They say that if you wait long enough, then anything from the past will eventually come back into fashion. And true enough; over the decades we’ve seen all sorts of unlikely fashions from yesteryear experience a new lease of life on the high street Disco pants, eighties neon and double denim… I’m looking at you. However, I’m sure that I’m not the only one who was slightly amused and bemused to see our very own Guernsey jumper (which is over 400 years old) hit the headlines recently. At first, it may seem quite hard to imagine how a fisherman’s jumper, with humble seafaring origins, could make it into a glossy spread in Vogue – and be sported by none other than world renowned supermodel Kate Moss. Recently the Guernsey was promoted on ITV news by intrepid explorer Ben Fogle – It seems official; the Guernsey is in the media glare, it’s being worn by the fashion set. Celebrity endorsement has elevated our much loved Guernsey jumper into the upper echelons of glamorous knitwear. 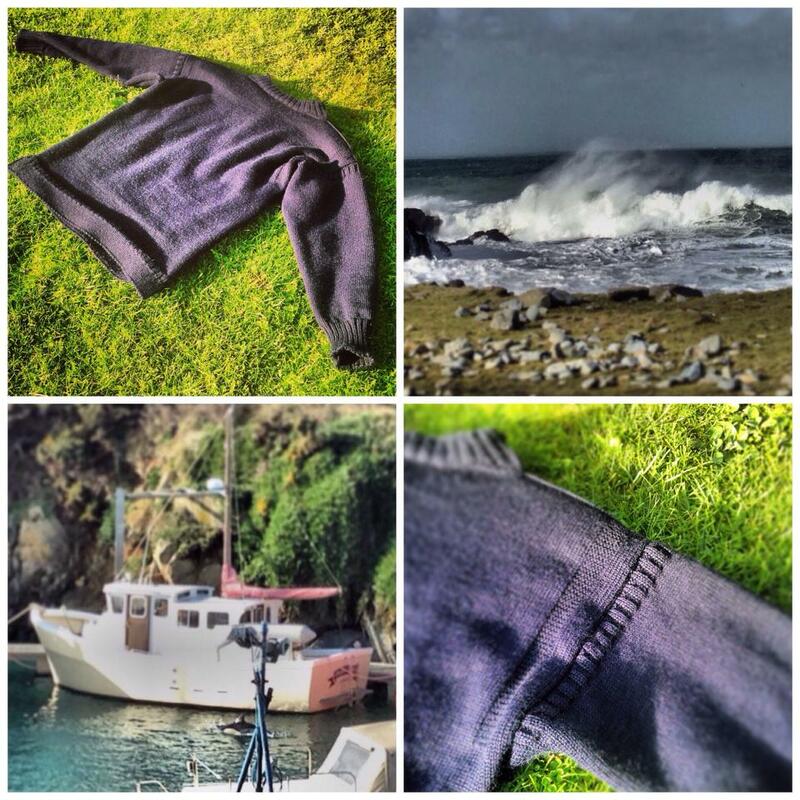 Forget cashmere and forget angora… it’s all about the Guernsey. It’s never been cooler to be seen in vintage look clothes, brogues and chunky knits that could have been worn by your grandparents. The Guernsey or ‘Gansey’ is a garment that was originally valued for its practicality. Knitted using oily lanolin wool, it serves as a great insulator against the elements. It’s important to remember that not so long ago, the main stays of the Island’s economy were the tomato trade and the fishing industry – the latter job requiring the fisherman to be outdoors in all weathers and temperatures. 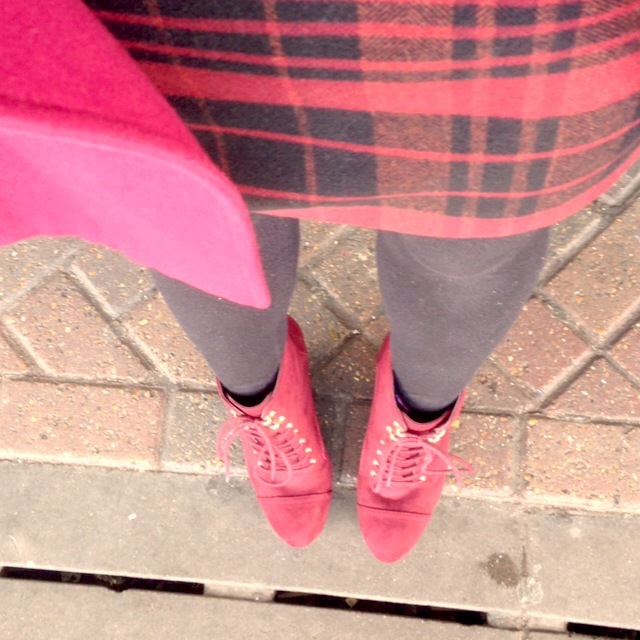 The Guernsey was therefore seen as a vital item of clothing. Traditionally, a wife would knit a Guernsey for her husband – once completed, she could sleep safe at night, secure in the knowledge that her fisherman would be snug in his woollens, mostly protected from harsh winds and relentless sea spray. The Guernsey has a simple yet unusual shape. For example, if you look closely at a Guernsey, then you’ll notice that the sleeves are much lower on the arm than on your standard jumper. The sleeves are stitched on below the armpit, (knitted on by hand to the main body of the jumper as a finishing touch) allowing for unrestricted movement – something that is a priority when you’re controlling a boat in unpredictable weather. The tightly woven stitching on the sleeves denotes different maritime symbols, such as rigging, ropes and waves breaking upon the shore. Occasionally, certain patterns on a Guernsey could be used as an identifier for men from different families or parishes. So you’d be able to tell your Queripel from Torteval from your Le Page from Castel just by his clothes. Looking back now, this creativity may have seemed like a cute personal touch, however this decision to customise the Guernsey was not fashion based. The grisly truth, was that the unique pattern meant that if a man had been lost at sea and his body eventually washed ashore, the pattern of his Guernsey – the lanolin wool not being damaged by the sea – would lead quickly to his identification. The high symmetrical neckline meant that the Guernsey could be worn back to front – if you got one side dirty or it started to show a bit of wear and tear then you could just flip it round. It was seen as an enduringly loyal item of clothing – iconic Guernsey. Guernsey jumpers and stockings are historic objects with a rich heritage – and date back as far as the 1600s when English wool was first imported to the island. According to the BBC and The British Museum’s ‘A History of the World’ project, Guernsey knitting even had royal connections – Mary Queen of Scots is said to have been executed in her favourite pair of Guernsey stockings. If you go down to the Fermain Tavern today, there’s a fair chance that you will see one or two middle aged professionals (and maybe even a sixth form student) wearing their Guernseys with nonchalance. However, if you ask these finance types why they wear their fisherman’s Guernsey, you’ll notice that they’ll tell you their sentimental reasons for doing so with a typical Guernsey donkey sense of pride. My sixteen-year-old brother even asked for a Guernsey for Christmas – and when I questioned him why, he replied that not only was it an ideal garment for outdoor pursuits (you’ll often find him down the shooting range on a Sunday) but also that he liked to support local industry. Furthermore, it reminded him of his roots and heritage. “If I’m looking for a quality jumper, then why wouldn’t I go for the best?” The Guernsey is not disposable fashion – for many it’s an heirloom. So what do we make of the Guernsey becoming ‘on trend’? Well, we won’t settle for anything less than the very best, will we? It’s only natural for it to be modelled in one of the world’s leading fashion bibles and by top models. 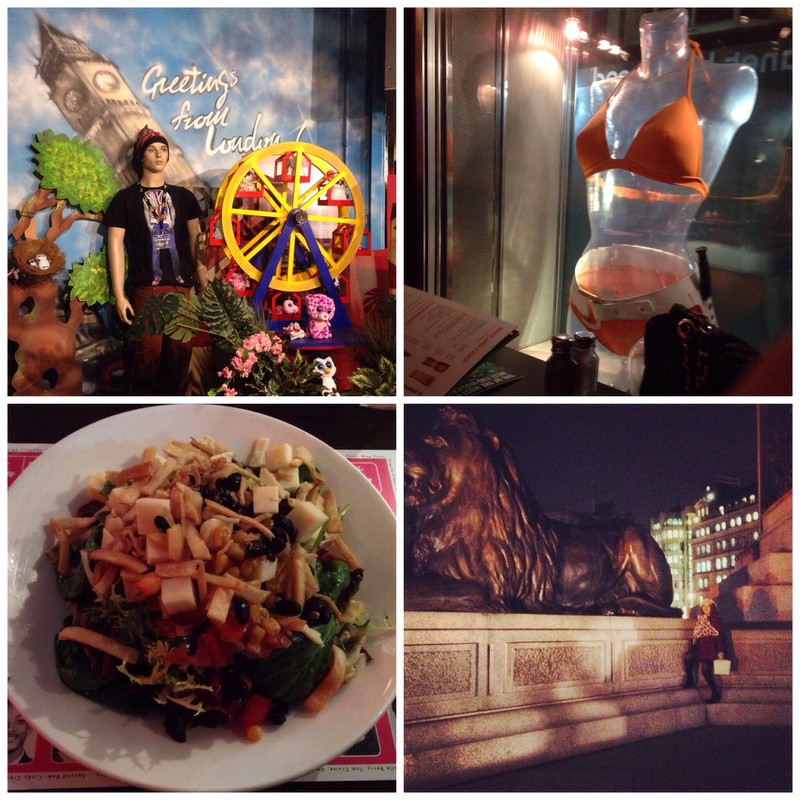 Because what does a publication such as Vogue, Kate Moss and the Guernsey have in common? They’re timeless. After spending the morning brunching with Florence in the 13th arrondissement, I made my way, guidebook in hand, to the fashionable district of Le Marais to meet another friend. Whilst I was living in Clermont-Ferrand and Konstanz as part of my degree programme, unbeknownst to me, a French girl called Ombeline had embarked on her own year abroad, finding herself living and working on my home island of Guernsey. After meeting through a mutual friend in the summer of 2013, we swapped details – and upon hearing that I was in the city, she found some spare time in her schedule to accompany me on an adventure retracing the footsteps of another French national with links to the island of Guernsey… the writer Victor Hugo. As they say “It’s a small world, after all”. 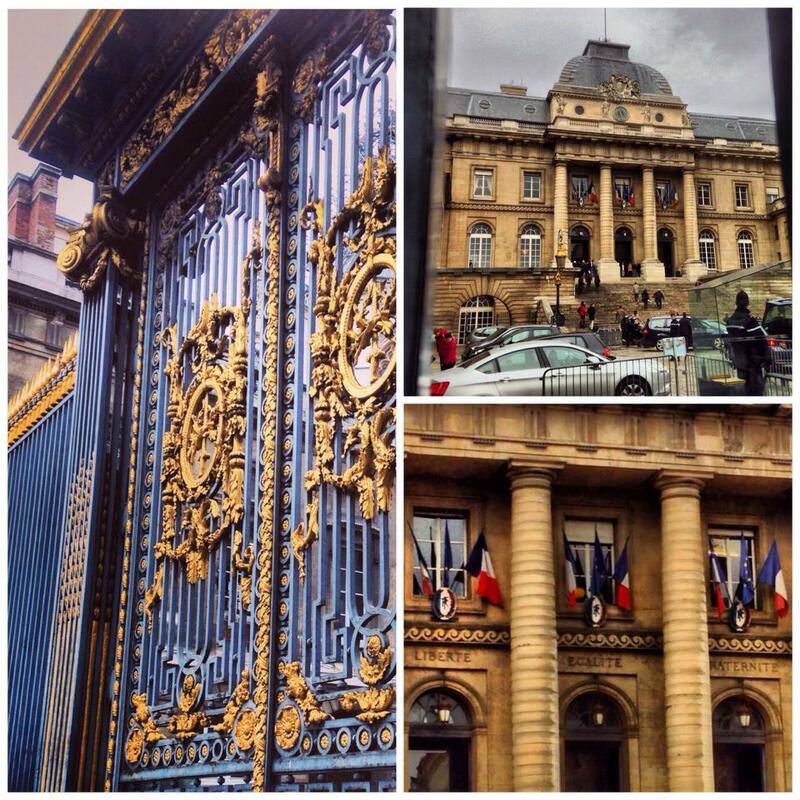 We began our journey near the Hôtel de Sully, a beautiful baroque building at 62 rue Saint-Antoine. Le Marais is a lovely area of Paris, famous for its elegant ‘hôtels particuliers’ – that is to say, private mansions that were once owned by members of the French aristocracy. Featuring ingenious and elaborate architecture, these fancy townhouses are not always easy to spot as you walk around Paris, as they are often artfully tucked away around forgotten street corners and behind stone walls. 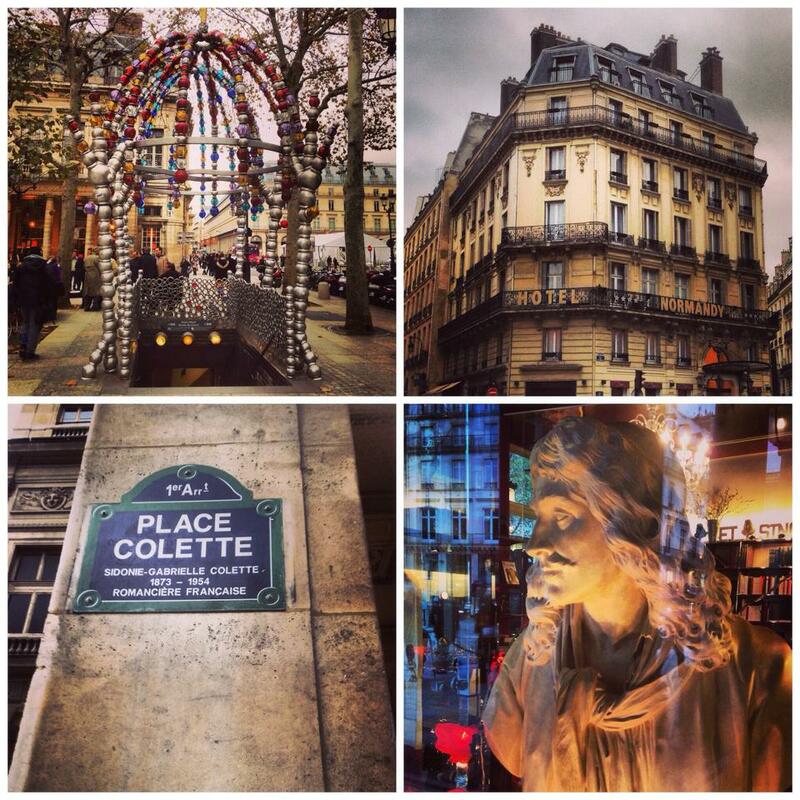 If you want to discover some hidden architectural treasures, then head to Le Marais! The Hôtel de Sully was designed by Jean Androuet du Cerceau, a French architect of ‘hôtel particuliers’ who descended from a long line of famous architects, in 1624 and ended up being purchased by Maximilien de Béthune, Duc de Sully some ten years later. It came into the hands of the state in 1944 and since 2000, the Hôtel has been the headquarters of the Centre des monuments nationaux, an organisation which looks after France’s national monuments and aims to preserve and promote France’s national heritage sites and ‘patrimoine’. The sites overseen by the organisation include the Arc de Triomphe, the fortifications of Carcassonne, Chartres Cathedral, Notre Dame de Paris and the Panthéon, just to name a few. Today, the 27th January 2014, actually marks the 200th birthday of Eugène Viollet-le-Duc – a French gothic revival architect, famous for his views on historic preservation and for his restoration work on several national monuments (Notre Dame and Carcassonne included). Happy Birthday Eugène Viollet-le-Duc and long may the preservation of national monuments continue! Using the courtyard of the Hôtel de Sully as a shortcut, we walked from rue Saint-Antoine to peaceful Place des Vosges. We made our way to number 6, and were soon climbing up the stairs to Victor Hugo’s former apartment on the second floor of the Hôtel de Rohan-Guéménée. The entire building of the Hôtel has been transformed into a museum dedicated to Victor Hugo – with temporary and permanent exhibitions. It is free to visit the apartment on the second floor, with an added charge for the current exhibition on the first floor – La Cime du rêve – Les Surréalistes et Victor Hugo, a temporary exhibition which runs until the 16th Feburary and focuses on Victor Hugo and artists from the surrealism movement. Victor Hugo lived in the apartment on the second floor from 1832-1848. You enter the apartment through the antechamber before being greeted with sumptuous rich red damask covering the walls in the next room – le salon rouge. In this room, a bust of a young Victor Hugo (sculpted by David d’Angers) stands guard, complete with brow furrowed in contemplation. 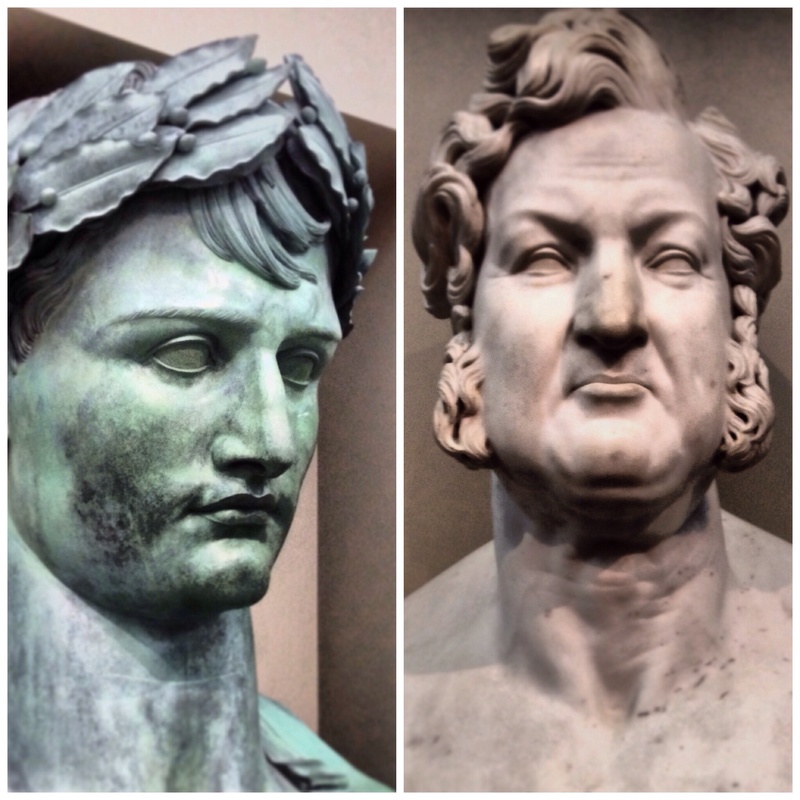 To the right hand side of the bust are portraits of Adèle Foucher (painted by Louis Boulanger in 1839) and Léopoldine Hugo (painted by Auguste de Châtillon in 1836). Adèle Foucher was the wife of Victor Hugo – together they had five children; Léopold (b. 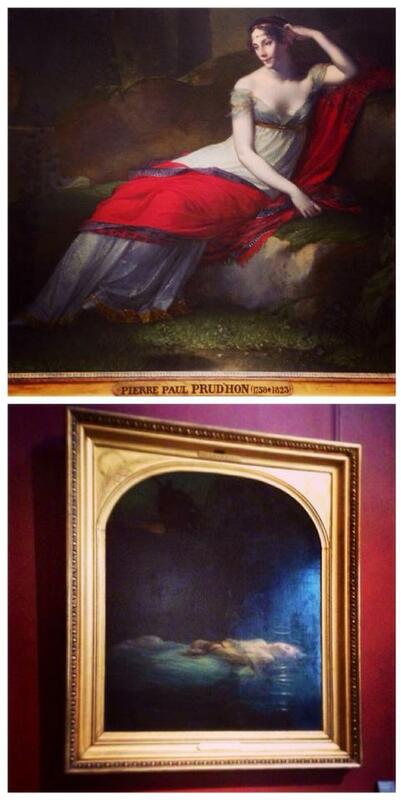 1823 and died the same year aged a few months old), Léopoldine (b.1824 d.1843 Léopoldine tragically drowned at the age of 19 in a boating accident) Charles (b.1826 d.1871) François Victor (who you can see pictured below left in a portrait by Louis Boulanger with his father and was famous in France for translating the works of Shakespeare from English into French b. 1828 d.1873) and Adèle (b.1830 d.1915). Adèle was the only child to survive Victor Hugo, as the other four children all died tragically before his death in 1885. Victor Hugo was especially haunted by the death of Léopoldine, and wrote the famous poem ‘Demain dés l’aube’ in her memory. Although Adèle survived her father, she suffered greatly when she fell in love with a Lieutenant Pinson during the Hugo family’s time on the island of Jersey. Her tragic love story was brought to life on the silver screen by François Truffaut in the film ‘L’Histoire d’Adèle H’ in 1975 – with the title role portrayed by the beautiful Isabelle Adjani. The film was partially shot in Guernsey, and serves as a touching homage to Adèle Hugo. 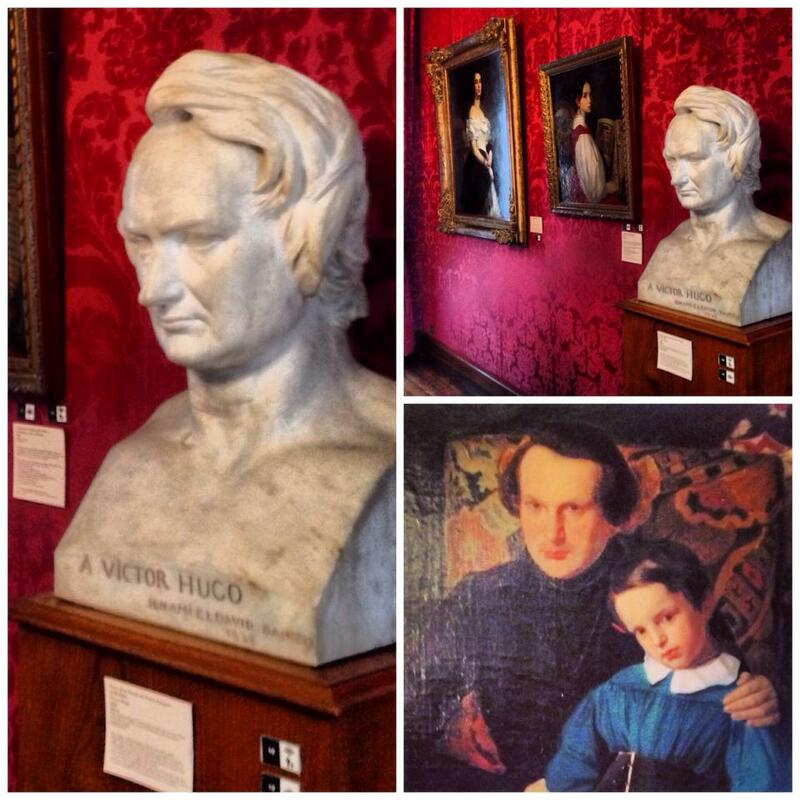 Victor Hugo was also survived by his grandchildren, the two children of Charles Hugo, Georges and Jeanne. Their portrait can also be found in the apartment – it was painted in 1879 by Charles Voillemot. 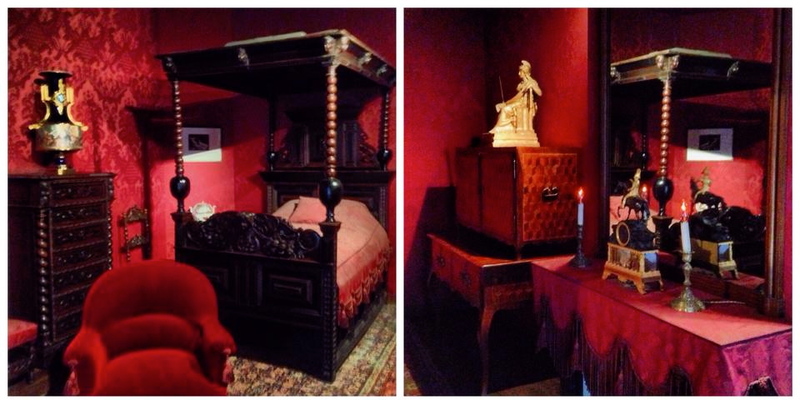 My favourite room of the apartment was Victor Hugo’s bedroom – the furniture from this room actually came from a different parisian residence of Victor Hugo and was donated to the museum several years later by his grandchildren. 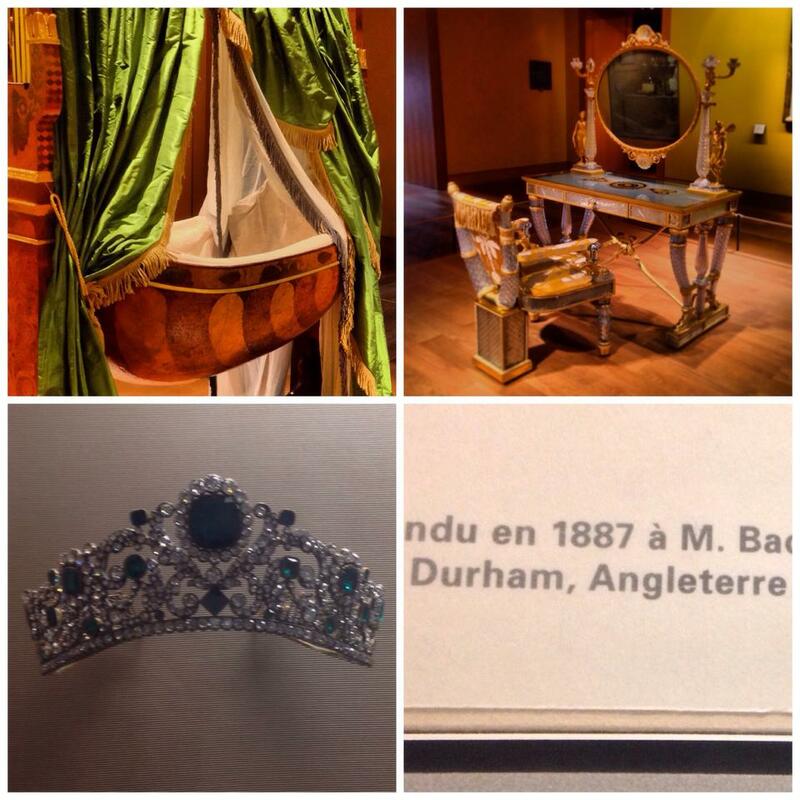 It was in this bed on the 22nd May 1885 that Victor Hugo died at the age of 83. Over two million people attended his funeral, following the procession of a national hero in a pauper’s coffin all the way from the Arc de Triomphe to the Panthéon. He now lies in the building dedicated to ‘les grands hommes’ next to two other great French authors – Alexandre Dumas, author of ‘The Three Musketeers’ and Emile Zola, author of ‘Germinal’ and many other French classics. After leaving Places des Vosges and having a brief shopping detour, we were back on the trail of Victor Hugo – destination Panthéon. 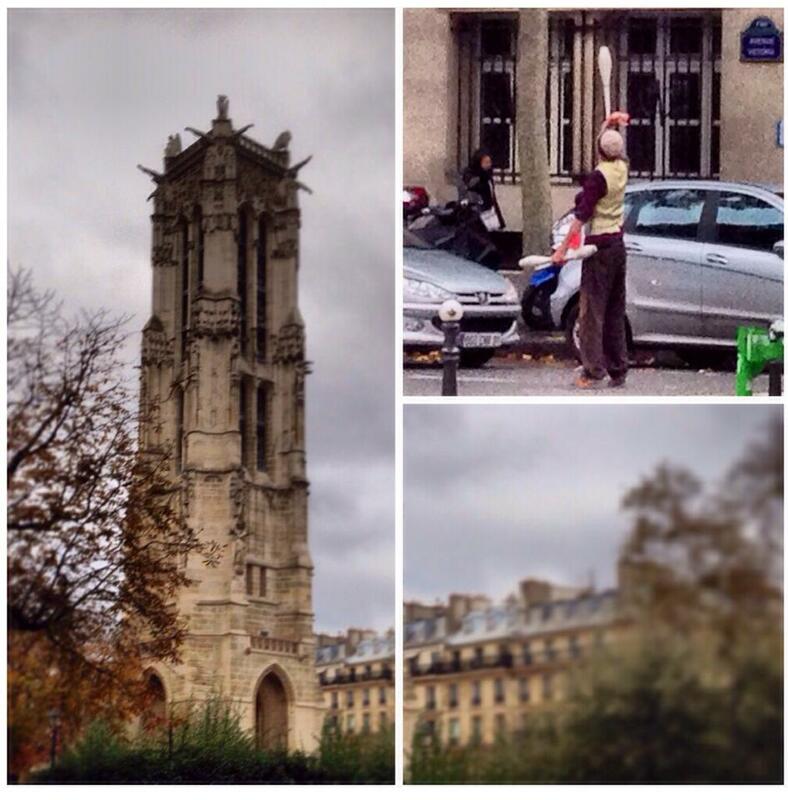 We passed the bell-tower of a former church, the Tour-Saint-Jacques on rue de Rivoli and were momentarily perplexed by the sight of a juggler juggling in front of a line of traffic on the avenue Victoria. The Tour-Saint-Jacques was built in the early 1500’s and unveiled after three years of extensive restoration by the city of Paris in 2009. 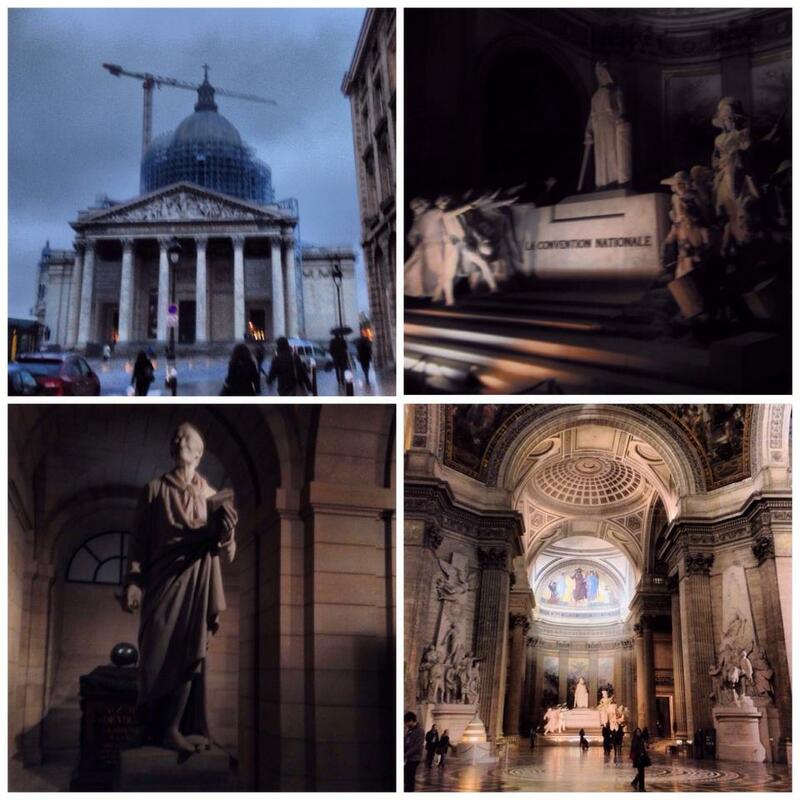 We hopped on the bus, waved our Navigo passes and headed to the Latin quarter to marvel at the necropolis of the Panthéon – the resting place of many of France’s greatest men… and multiple Nobel Prize winner Marie Curie, the first female French citizen to be recognised for her achievements and contributions to France by being buried in the Panthéon. 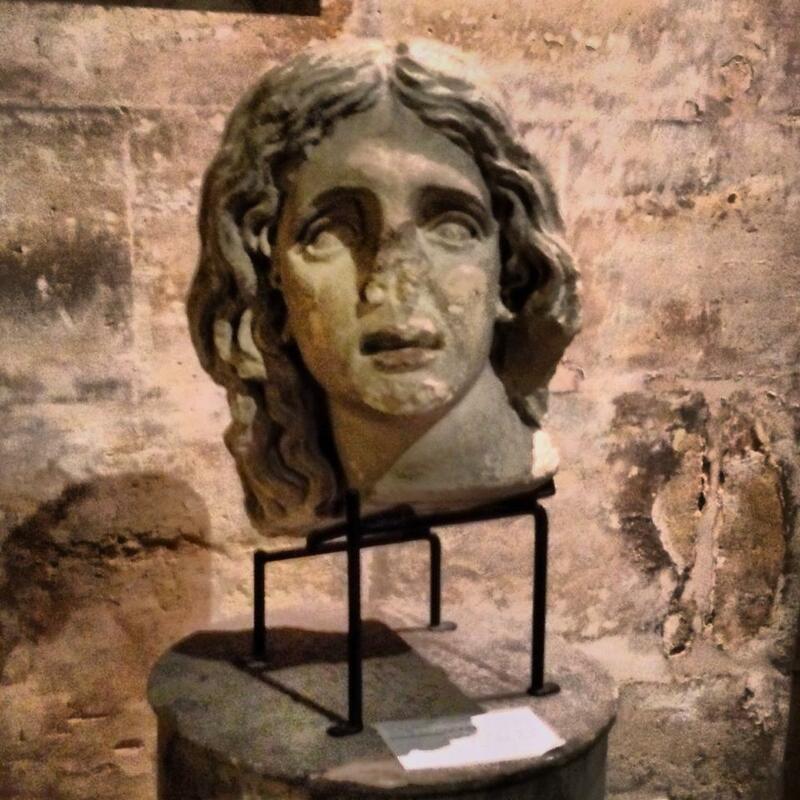 She was interred in the Panthéon in 1995, 61 years after her death. 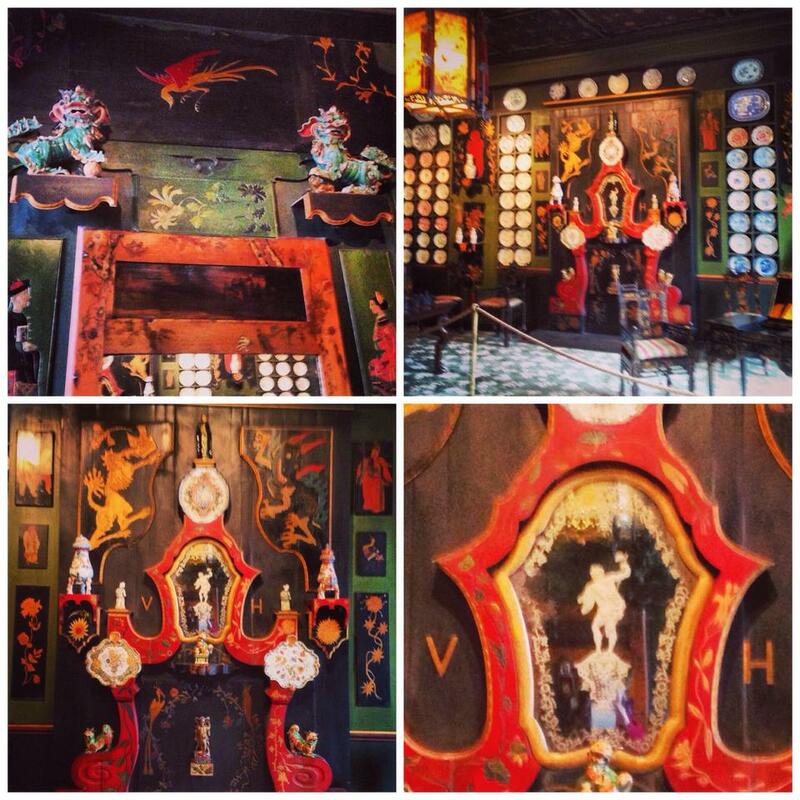 The building is open from 10am-6pm October-March and 10am-6:30pm April-September. Being under 26, we were admitted for free into the building with a quick showing of our identity cards. Art and architecture students often come to the Panthéon to sketch the ornate stonework and to contemplate – on our visit there were several students wandering the building armed with sketchpads and pencils, lost in their thoughts. As time was ticking, we made our way to the crypts first, as we had been advised that the tombs would be closing early. In the serene haven of the crypt, the tombs are bathed in a warm and calming glow. 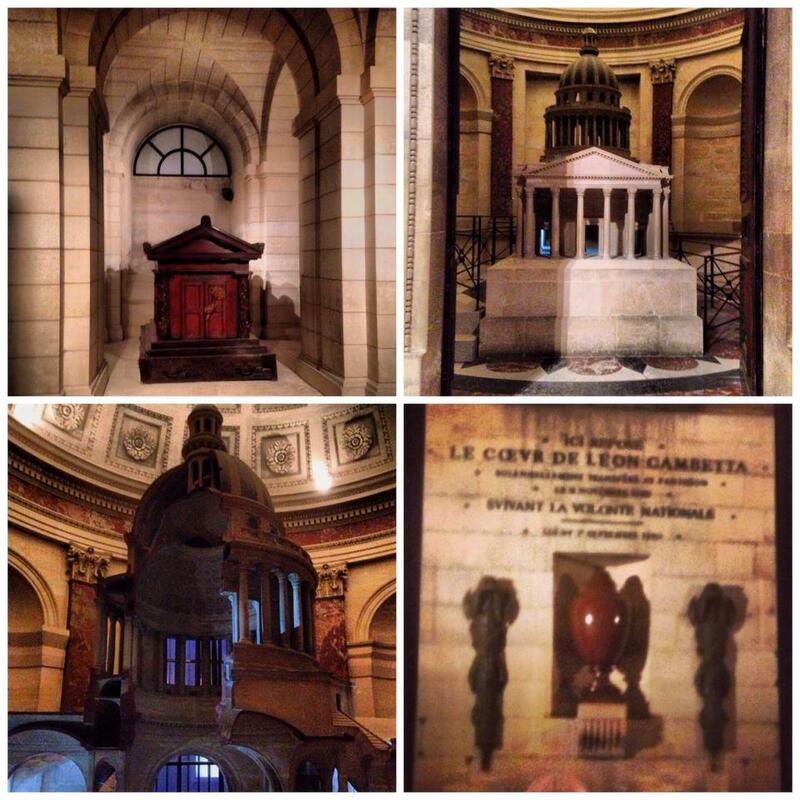 In the picture above, the tomb of Victor Hugo is featured bottom left – here in the depths of the Panthéon, Victor Hugo lies in quiet repose opposite Emile Zola. 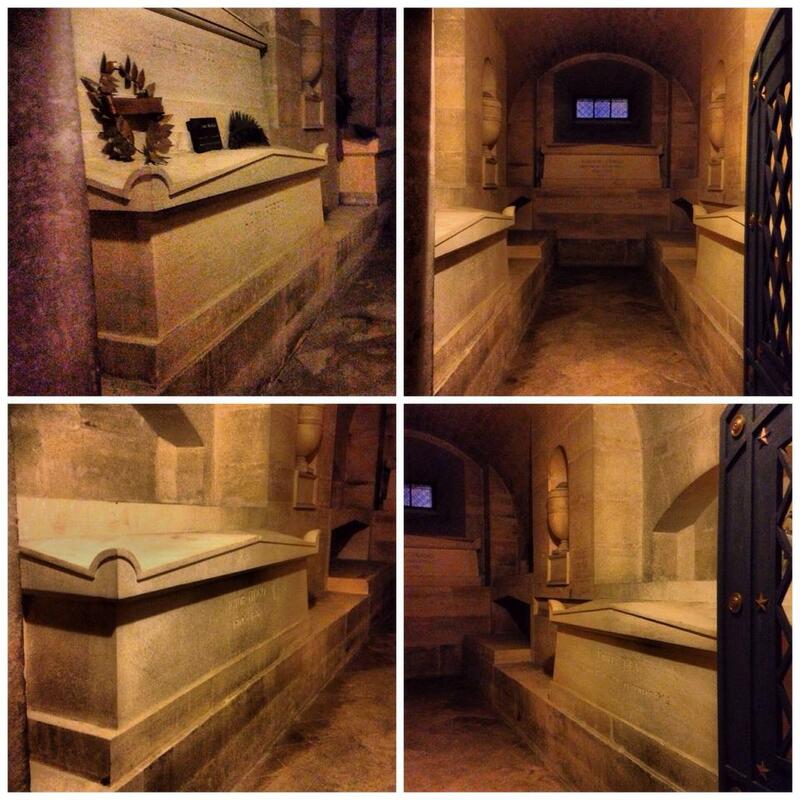 The tomb of Alexandre Dumas is slightly raised above the other two at the back of the vault. I found visiting the grave of Victor Hugo to be a particularly emotive experience – it’s overwhelming to think of all that he contributed to society – artistically through his books, drawings and artworks and politically through his personal beliefs – the beliefs that he wasn’t afraid to share with the rest of his country. He stood up for democracy and fought for the right of the underdog – even if taking such a radical approach meant being exiled from his beloved country. His tomb – along with the tombs of French abolitionist writer Victor Schœlcher, French socialist leader Jean Jaurès and Jean Moulin, a member of the French resistance who was killed by the Gestapo in 1943, Louis Braille, Voltaire, Rousseau, Emile Zola, Alexandre Dumas and Marie Curie – has a simple yet imposing design in white stone with clean lines. However, when you stand before any of the tombs in the Panthéon, it is a humbling experience to think of all the human beings buried there, who achieved and contributed so much for France during their time on this Earth. As it was nearing closing time and Ombeline had a class to go to, we decided to bid adieu to the great men (and women) of the Panthéon, heading outside into a tranquil dusky evening. 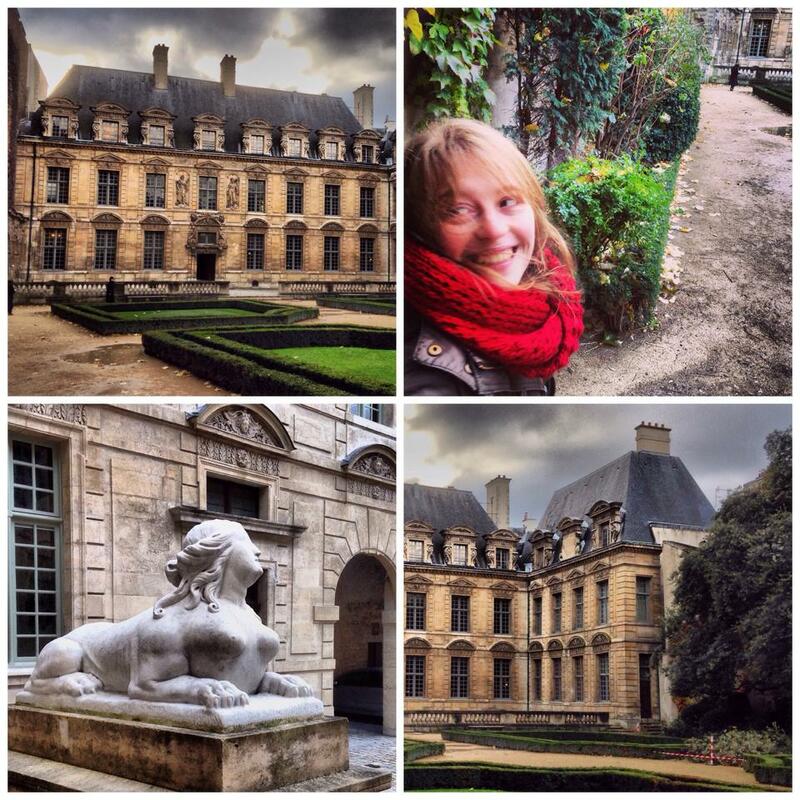 We stopped to look at the buildings of the Sorbonne Law School before continuing onwards through the alleyways of the Latin quarter in search of a snack. Running commentary of the sights and hotspots of the vibrant Latin Quarter was provided by Ombeline – thanks go to Ombeline for a great day of culture and catch up in Paris! If you are interested in learning more about Victor Hugo, then I would strongly recommend having a read of Graham Robb’s ‘Victor Hugo: A Biography’. The Panthéon also has its own website http://pantheon.monuments-nationaux.fr which can be consulted for further information. 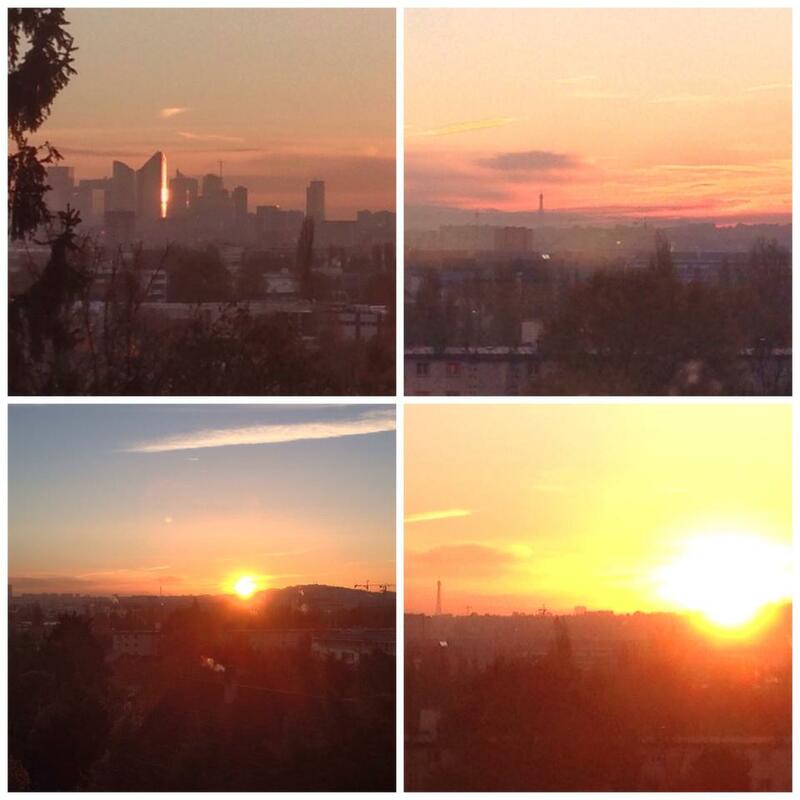 For me, waking up to the panorama of a sunrise over Paris will always be a magical experience. The years go by, the seasons change and I grow older, but my excitement at seeing the Eiffel Tower basking in the sun’s rays never diminishes. On this particular morning, I was in an especially good mood, buzzing with the anticipation of spending a day at Disneyland Paris, Europe’s top tourist destination. A few days previous to the glorious sunrise, my uncle Eric had contacted me over Skype asking if I’d be interested in joining him, my aunt and my cousin on a trip to Disneyland Paris. Like many people, I count myself as a lifelong fan of Disney animation and I’m also a big fan of the Disney Park in Marne-la-vallée, having been on my first ever trip to the resort in the summer of 1994 at the age of 3. On this occasion, my mum had decided to dress me from head to toe in a Minnie Mouse dress with matching ears. These garments were relics from when my parents had previously gone off gallivanting to Disney in 1992 leaving me behind with my grandparents in Normandy. Whilst I outgrew the dress a very long time ago, those Minnie Mouse ears from 1992 still fit… and have accompanied me on return visits to the park (christmas day trips in 2003, 2007 and an extended summer trip of 4 days in 2011 when the Dance World Cup took place at Disneyland Paris). 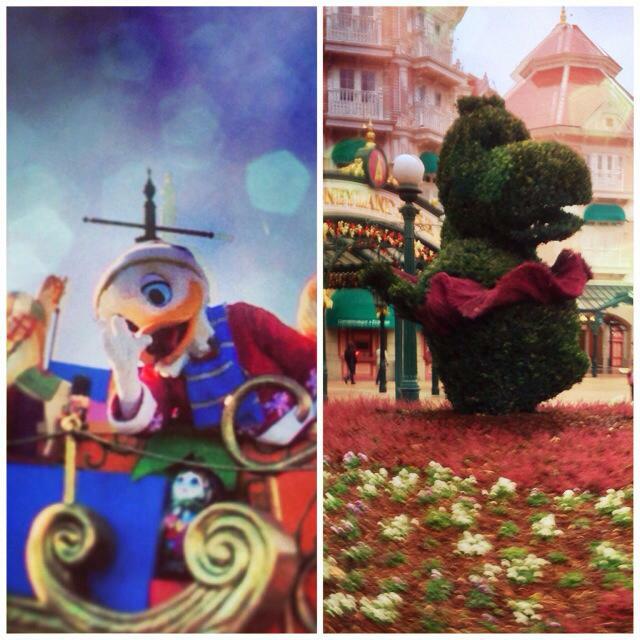 The pictures above are from 1994 and 2011 – as you can see Disneyland Paris has always been a place that evokes many happy memories for me and my family. I have always loved the fact that it is a bilingual attraction, with characters, parades, shows and rides often featuring both French and English because this reflects the way in which I was brought up – Franglais for the win! 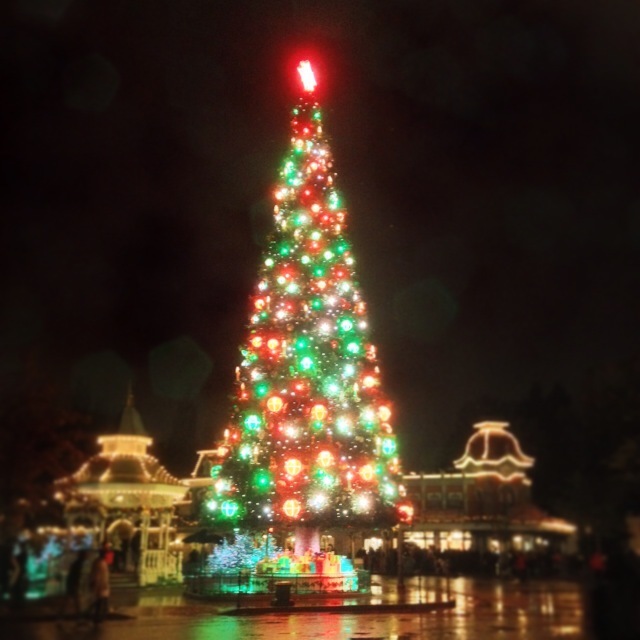 The Disney company has several parks throughout the world, however Disneyland Paris is widely regarded as being the most beautiful in terms of layout and architecture. Many Disney films have been inspired by French fairytales, style or architecture (such as ‘Beauty and the Beast’, ‘Cinderella’, ‘Sleeping Beauty’, ‘The Aristocats’, ‘The Hunchback of Notre Dame’ and ‘Ratatouille’) and so the choice of building a Disneyland park just outside Paris makes for a romantic and whimsical French backdrop that pays a lovely homage to many Disney classics. 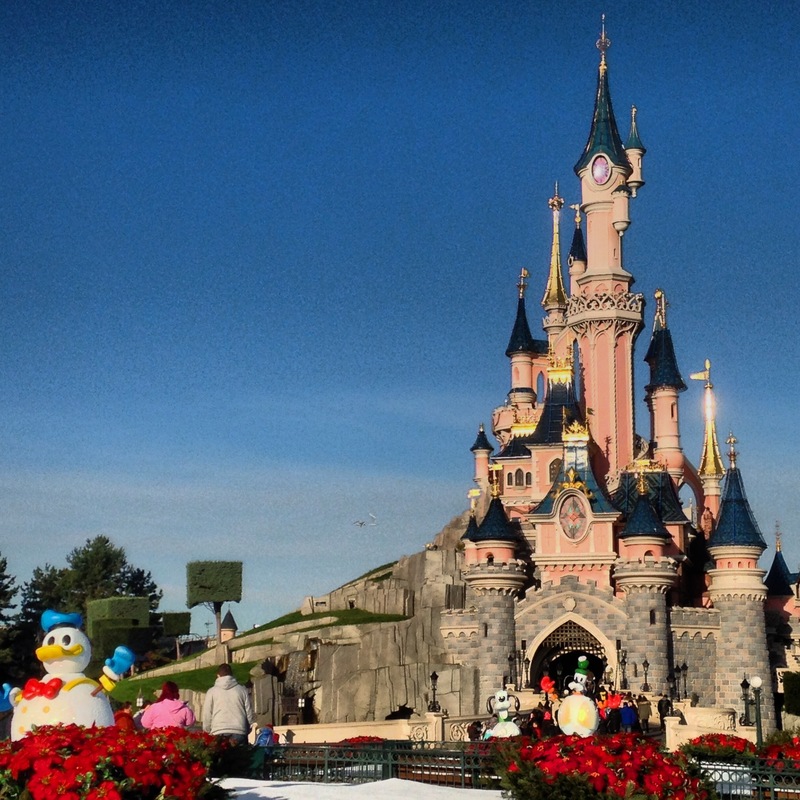 Disneyland Paris’ excellent transport links with the rest of central Europe means that the park is most definitely a jewel in the crown of the Disney Parks family. We took the RER from Chatou to Marne La Vallée – a journey which only took about 45 minutes. There is a lot of parking available in the Disney complex, however it is easy to commute by train (the park even has a direct link from London with Eurostar). What I was particularly looking forward to on this excursion was the fact that we were visiting Disney on an off-peak day in the middle of the working week. If you really want to maximise your chances of going on as many rides as possible with minimal queues then I would definitely advise visiting the park on a day with low attendance – luckily for us, the waiting time for most rides was a maximum of 5-10 minutes. 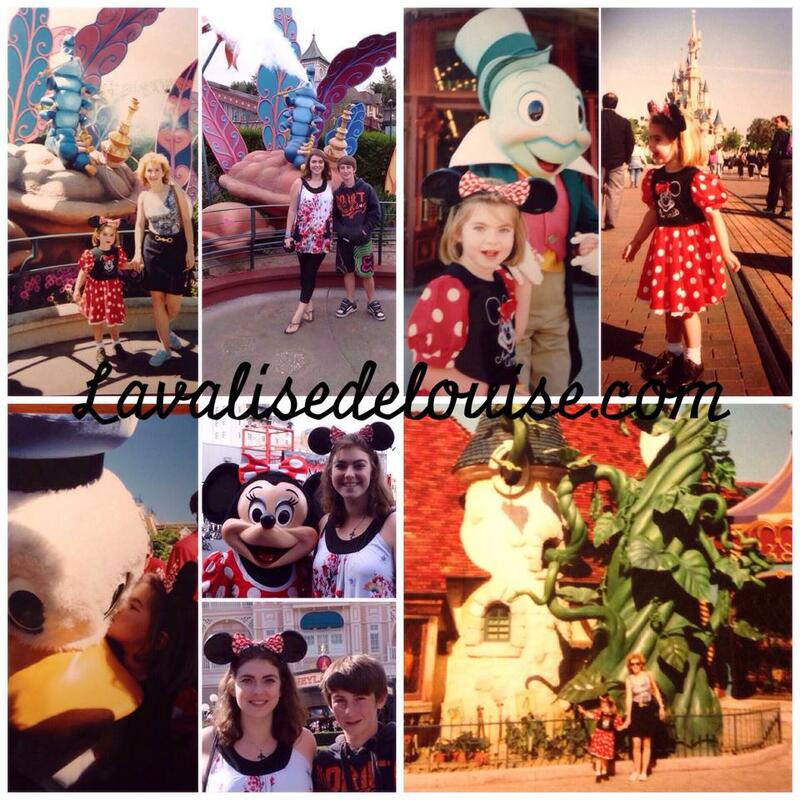 This meant that we could truly make the most of our park hopping day tickets – the Disneyland Paris complex contains two theme parks, Disneyland Paris (est.1992) and Walt Disney Studios (est. 2001), as well as a Disney Village full of restaurants, cafés and shops, and it is possible to zip in and out of the two if you buy a two park ticket. At the height of the Christmas and summer holidays (peak attendance) it is not uncommon to queue for over an hour for some of the top rides. Arriving at Marne-la-vallée, we made our way throught the archways of the bright pink Disneyland Hotel and entered onto Disneyland’s Main Street USA. The park was beautifully decorated for the Christmas season (which runs from November-January) with trees, wreaths and flurries of artificial snow. Main Street USA is a really beautiful area with wonderful 1920s style architecture. Vintage cars and horse drawn carriages are often parked near the entrance, with Disney characters available for meet and greets under the band stand. There are many different activities available within the park – some guests want big thrills, others are looking for gentler rides, some just want to absorb the atmosphere and take in the sights, whilst many guests go to Disneyland with their children in order to meet Disney characters. 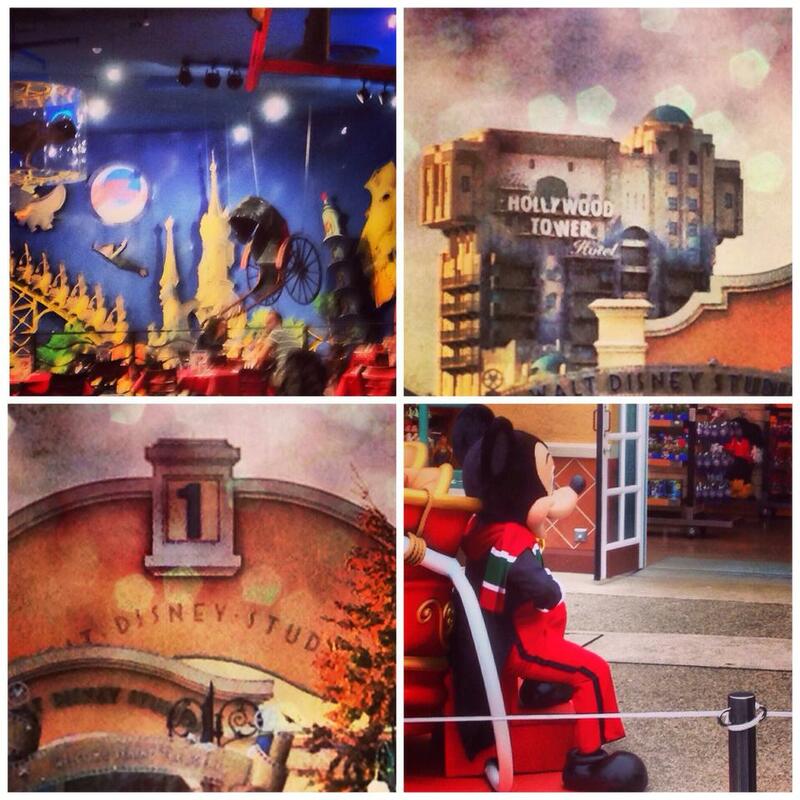 For many children, meeting a character is an unforgettable and magical experience. 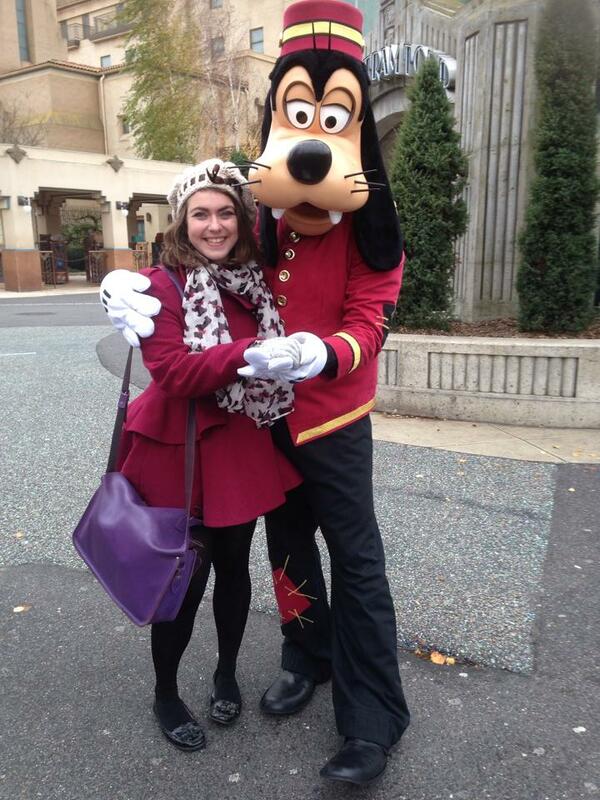 If you’re planning a trip to Disneyland Paris and are especially interested in photo or autograph opportunities with characters, then I would recommend checking a programme for character locations at the beginning of your visit so as to optimise your chances of avoiding long queues and getting to meet with as many as possible. Programmes and maps of the park can be found at the ticketing booths by the entrance or online. 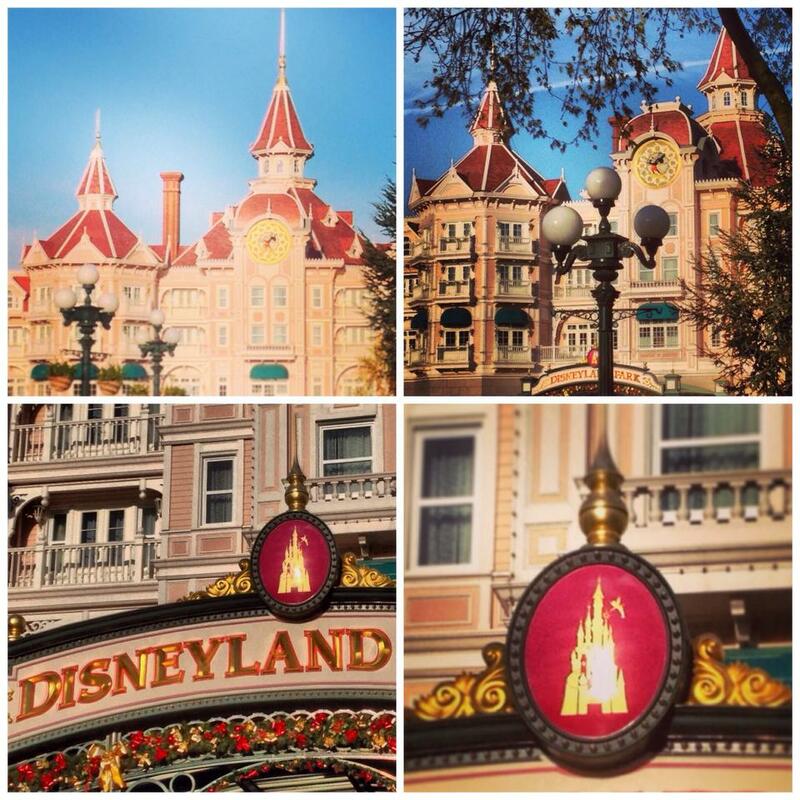 Disneyland is split into different themed zones – Main Street USA, Fantasyland, Frontierland, Adventure Land and Discoveryland. My cousin Maxim’s favourite attraction is the ‘Buzz Lightyear Laser Blast’ which is based on the character of Buzz Lightyear from the Toy Story films, and so futuristic space age Discoveryland was our first port of call. ‘Buzz Lightyear Laser Blast’ is a popular fastpass attraction – and is especially popular with younger children. At certain attractions within the park, it is possible to print off a Disney fastpass which enables you to return at a certain time slot and skip the queue – it’s a ticket that can come in handy! After zapping some aliens with laser guns, we dashed over to Star Tours – a Star Wars spacecraft simulator. For us, there was no wait for the ride – however, if you do find yourself with time to spare, you can spend a long time marvelling at the attention to detail in the queuing area. The animatronics, which include talking robots of R2D2 and C-3PO, are very impressive. The first magical moment of the day was when the little boy in front of us (wearing an oversized fluffy hat) was referred to as an Ewok by one of the castmembers operating the Star Tours attraction – this quite visibly made his day. See the magical steampunk rocket launcher, pictured top right? That’s the Space Mountain Mission II attraction, an enclosed roller-coaster which draws inspiration from the works of French science fiction writer Jules Verne. After our simulated journey through space on Star Tours, my uncle suggested optimistically that I accompany him on the Space Mountain Mission II roller-coaster. Now… I’m not entirely sure whether he was expecting me to say yes, as on my previous trips to Disneyland, I had never really had the courage to go on big roller-coasters. Time was always of the essence, and I imagined that I’d queue for ages, panic at the last minute and then change my mind about going on the ride – which would end up being a waste of everyone’s time. However, as there were no queues at Space Mountain and as we had been hopping on and off rides at a fast pace, I ended up over excitedly agreeing with my uncle that going on Space Mountain Mission II was a BRILLIANT idea and before I could hesitate, I found myself strapped into a rocket and being counted down in preparation for take off… ie. being fired up a cannon. With a wicked gleam in his eye, uncle Eric had assured me just before we got on that there was no loop the loop or ‘looping’ on the ride… this was a lie. A necessary lie to get me to face my fears of being flipped upside down at speed. As you are propelled upwards and subsequently whooshed along the inversions and loops of the track, a light show of swirling neon constellations, supernovas and vortexes come into view – making for an exciting and disorientating experience. It’s fast, it’s violent but extremely fun. I bruised my knee and had tears in my eyes from the speed at which we were going but left the ride giggling feeling giddy and happy from the adrenaline rush. 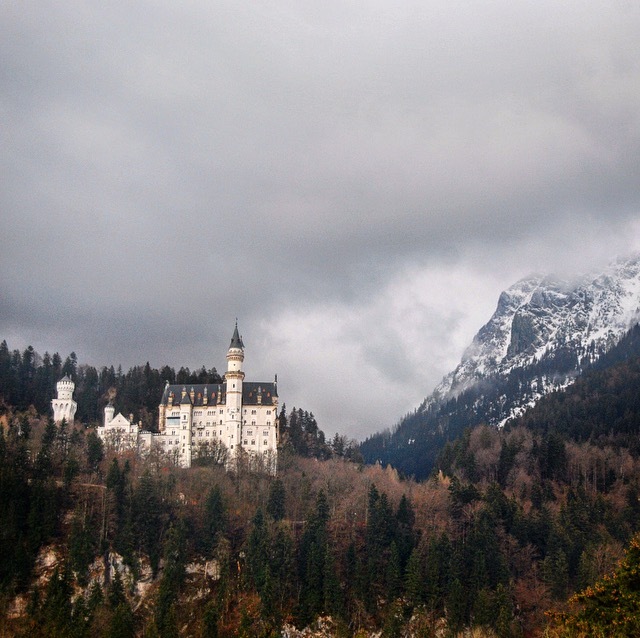 Reunited with my aunt and cousin, who had been patiently waiting with our bags, we headed onwards towards Fantasyland – this is the most magical area of the park in my opinion, as it has the gorgeous Sleeping Beauty Castle (Le Château de la Belle au Bois dormant). 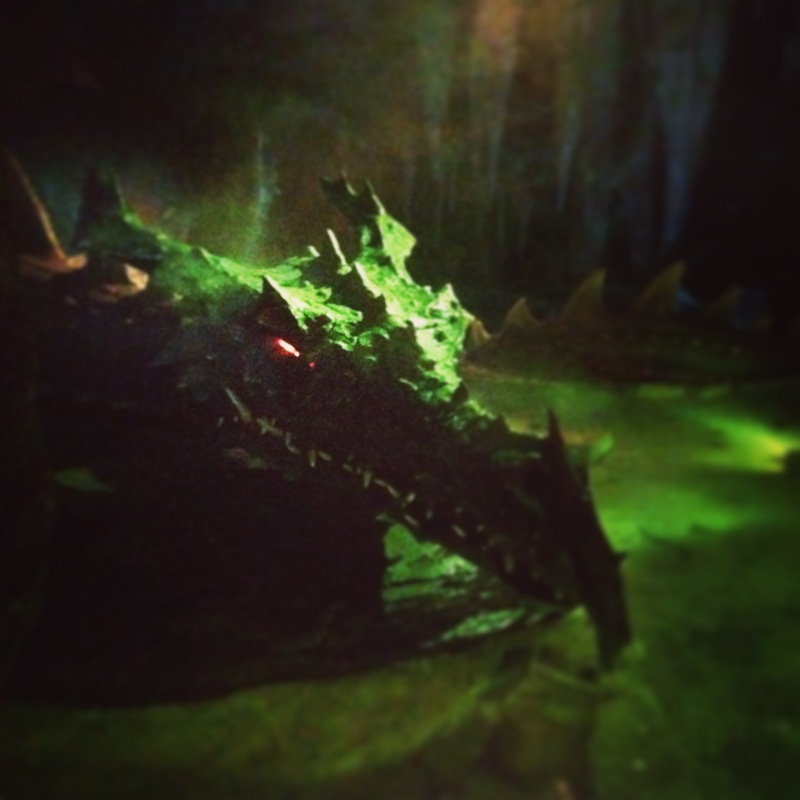 We stopped briefly to visit the ‘mysterious’ dragon which lurks beneath the castle in ‘La Tanière du Dragon’. As a little girl, I seriously believed that this was a real dragon – and each time I visit the park, I find it quite heartwarming to see that the 27m long mechanical dragon is still puffing smoke and terrifying little children… it ‘s a mechanical masterpiece that has not changed in the slightest since the very first time I saw it 18 years ago. Most of the children gathered around it (including a certain ten year old cousin) were marvelling at the fact that they were in the presence of a ‘genuine fire breathing dragon’. We didn’t actually stay in Fantasyland for very long, instead making a beeline for Pirates of the Caribbean in Adventureland. 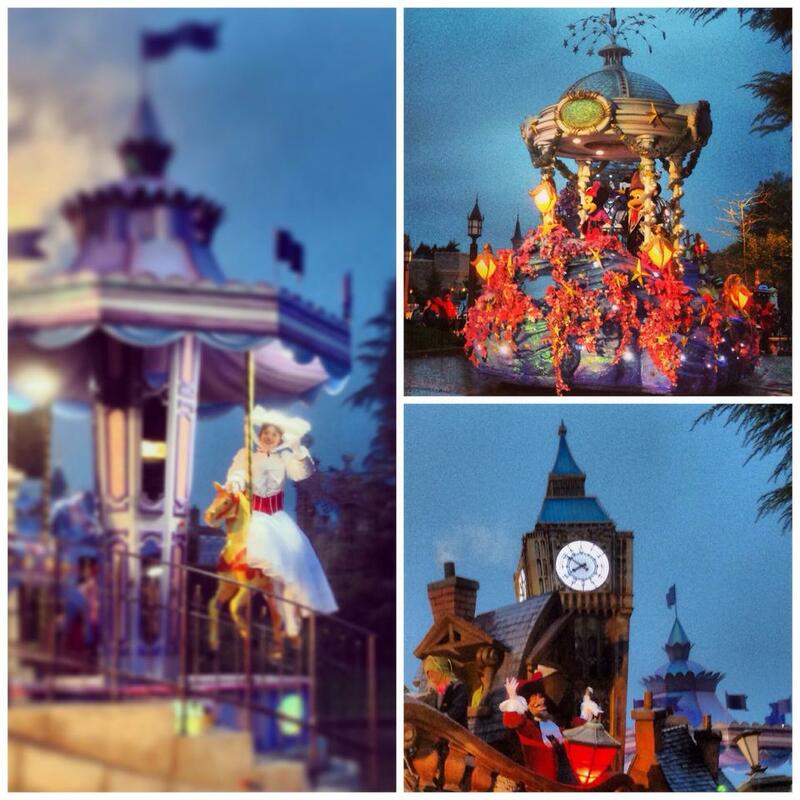 This ride is wonderfully atmospheric and extremely popular. As you descend into the caverns of the attraction you are hit with the smell of brine, and by the time you arrive at the loading bay of boats you could almost believe that you are actually on a caribbean lagoon underneath a starry sky. The film ‘Pirates of the Caribbean’ starring Johnny Depp as Captain Jack Sparrow is based on this ride and its counterparts in the American theme parks – you’ll enjoy spotting similarities between the ride and the film. You can even dine in the Blue Lagoon restaurant which is actually situated within the attraction itself – how’s that for an immersive dining experience? The visual highlight of Adventureland is Captain Hook’s pirate ship, which is docked next to Skull Rock. 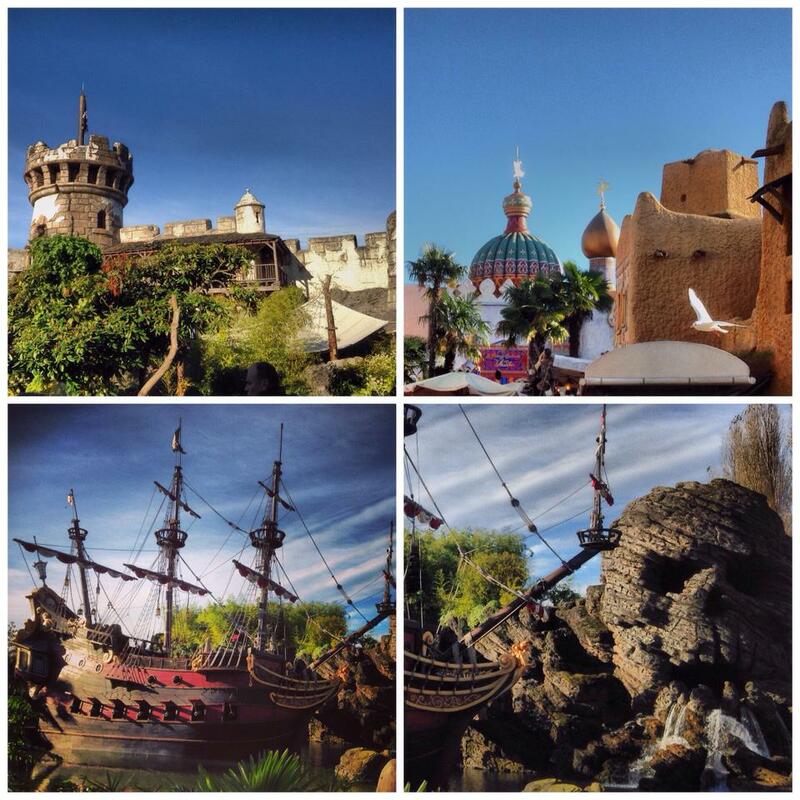 Adventureland is not only inspired by pirates, however – it also features Moroccan architecture, with scenery inspired by ‘Aladdin’. After spending some quality time with the pirates, it was time to visit cowboys and ghosts in Frontierland. This area is themed around Big Thunder Mountain and has two of my favourite attractions – the Thunder Mountain Railroad and the delightfully creepy Phantom Manor. 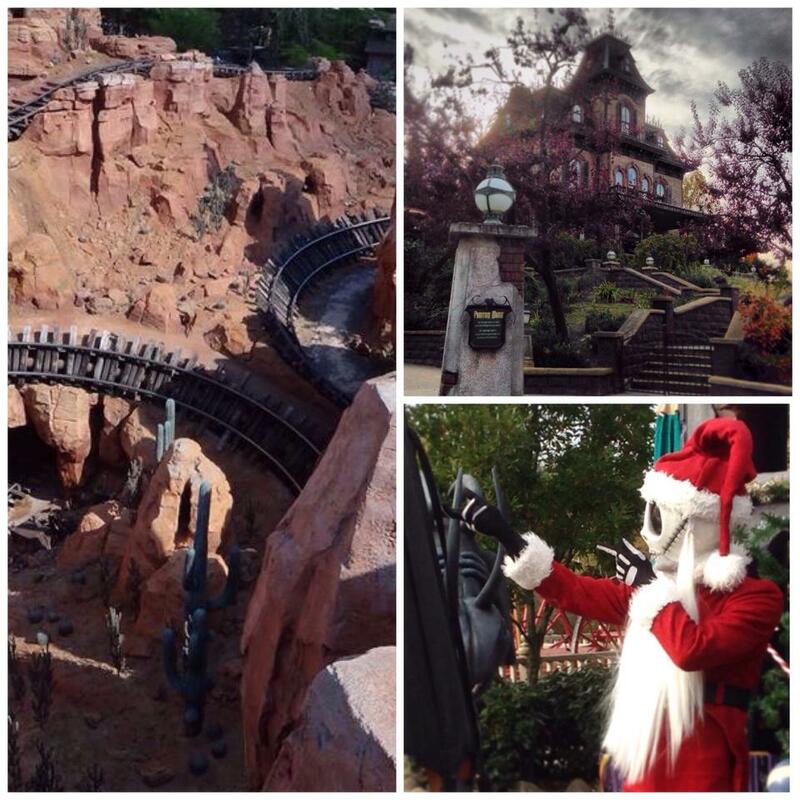 After a ride on Thunder Mountain – a runaway mine train – we were greeted theatrically by Jack Skellington from ‘The Nightmare before Christmas’ – this was exciting for me as this was a character that I had never seen at Disneyland Paris before. He was waiting outside Phantom Manor and accompanied by Sally the rag doll. Phantom Manor is a slow moving dark ride which features stretching rooms, ‘doombuggies’, holograms, ghostly brides and many visual references to Vincent Price and Edgar Allan Poe. It’s a beautifully designed attraction – towards the end, see if you can spot the ghostly skeleton which appears above your reflection in the mirrors. 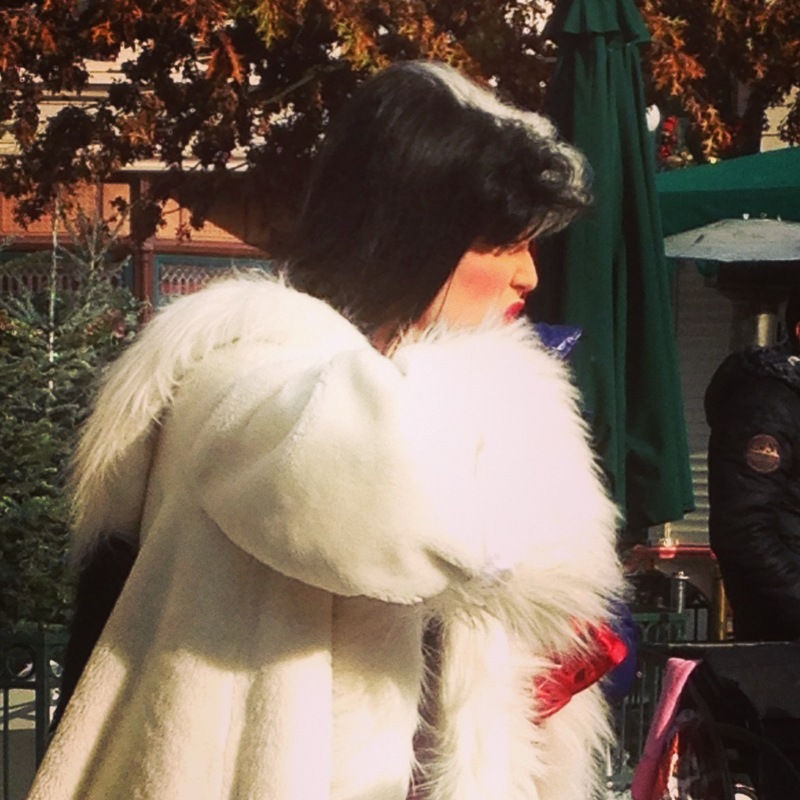 After a brief skirmish with Cruella Deville…. … we took a break from the park, heading into Disney Village for food. The restaurants in Disney Village are great value for money – we went to Planet Hollywood (pictured slightly blurred below). Planet Hollywood is known for paying homage to films throughout the ages and of course as we were in Disneyland the restaurant had to have a Disney twist. After lunch, we carried on the Hollywood theme by going to Marne-La-Vallée’s second park, Walt Disney Studios – the first stop being a ride that I was anticipating and dreading in equal amounts – The Hollywood Hotel Tower of Terror (La Tour de la Terreur – Un Saut dans la Quatrième Dimension) – the lift which takes you into the ‘fourth dimension’. My aunt didn’t fancy joining in on the jaunt to the fourth dimension ie. a terrifying series of drops. This ride is one of the most popular rides out of the two parks in Marne-La-Vallée – although Disneyland is much prettier in comparison to Walt Disney Studios, the Studios has the most thrilling set of rides – the Tower of Terror was exhilaratingly fun. Bellhops in costume greet you in character as you enter the building (I got a bow, a flourish of a cape and a kiss on the hand). Later in the afternoon, I even got whirled and twirled around by one particularly goofy bellhop who we happened to bump into on the way to Crush’s Coaster. Who said that character interactions were purely for the children…? Walt Disney Studios has a lot of different shows – in 2011 I’d previously seen Animagique, Cinémagique, Stich Live!, the Studio Tram Tour and Moteurs…Action Stunt Show Spectacular. As it began to rain, we quickly dashed to the backlot to catch an afternoon showing of the cars stunt show – there’s a lot of fire, smashing of glass and bike/car chases. The show lasted for about 45 minutes – afterwards it was time for Uncle Eric to persuade me to go on yet another death-defying ride – the Aerosmith Rock ‘n’ Roller Coaster. 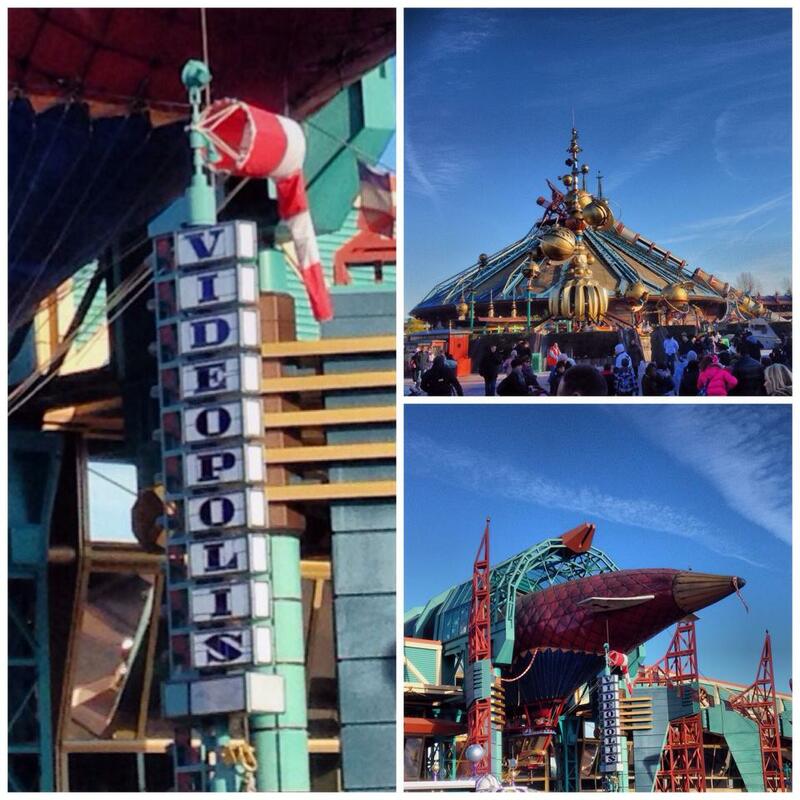 THIS IS A FAST RIDE – in fact it is the fastest at Disneyland Paris and ‘goes from 0 to 60mph in 2.8 seconds’. There are loops, there are lights; in short, it’s pretty brilliant. 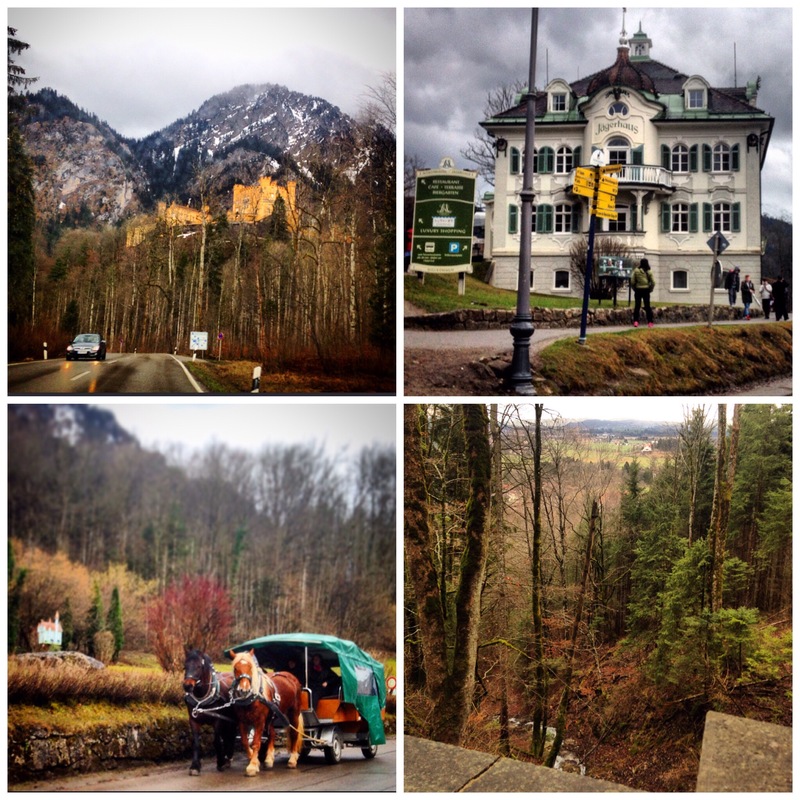 Again, by the end I had tears in my eyes but I thoroughly enjoyed the experience and would highly recommend going on the ride if you like strong sensations (…. and Aerosmith, of course). After Aerosmith, my aunt and cousin joined us on Crush’s Coaster – this is a spinning indoor roller coaster based on ‘Finding Nemo’. This ride actually had the longest wait time of any of the rides that we’d been on during the day – if you really want to go on this one then I would advise going on it as soon as the park opens in the morning in order to avoid the queues. Although this ride did not have any loops, it was rougher than I expected – hold onto your belongings tightly on this one! 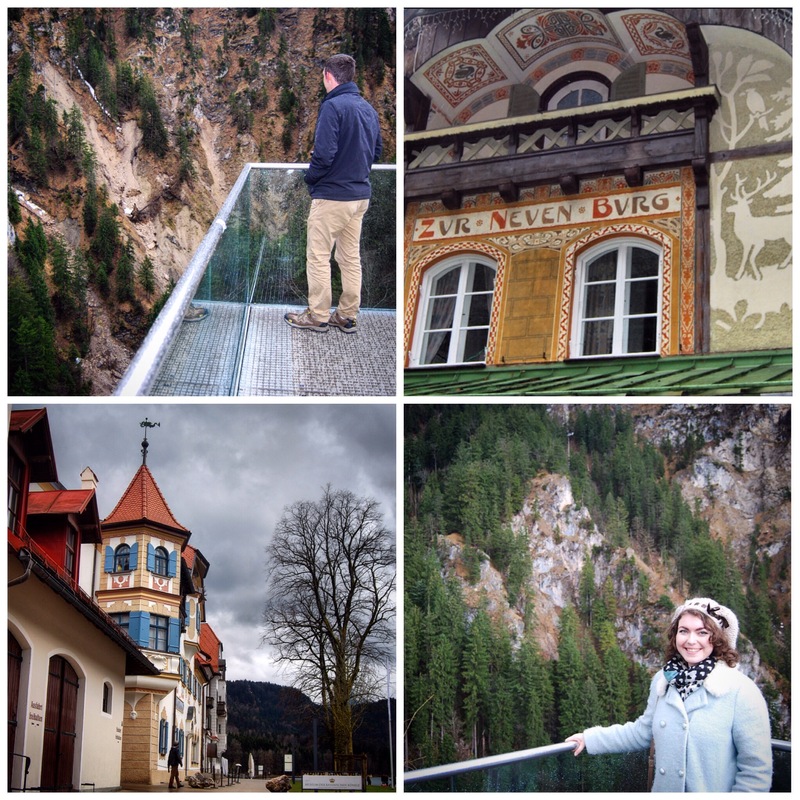 At the beginning, I couldn’t sit back and relax as we were dragged backwards up a high vertical slope and I was worried that my satchel was going to fall out of the turtle shell – let that be a valuable lesson to me! The lighting and visuals on the ride were beautiful and really did justice to the film – I especially enjoyed the glowing jellyfish that were suspended in midair over the track. Passing by topiary hippos from Fantasia, we headed once more into Disneyland for a repeat ride on Buzz Lightyear and to watch the evening parade. The rain was really starting to lash down by this point – not that you’d have been able to tell that it was raining from the characters’ enthusiasm. 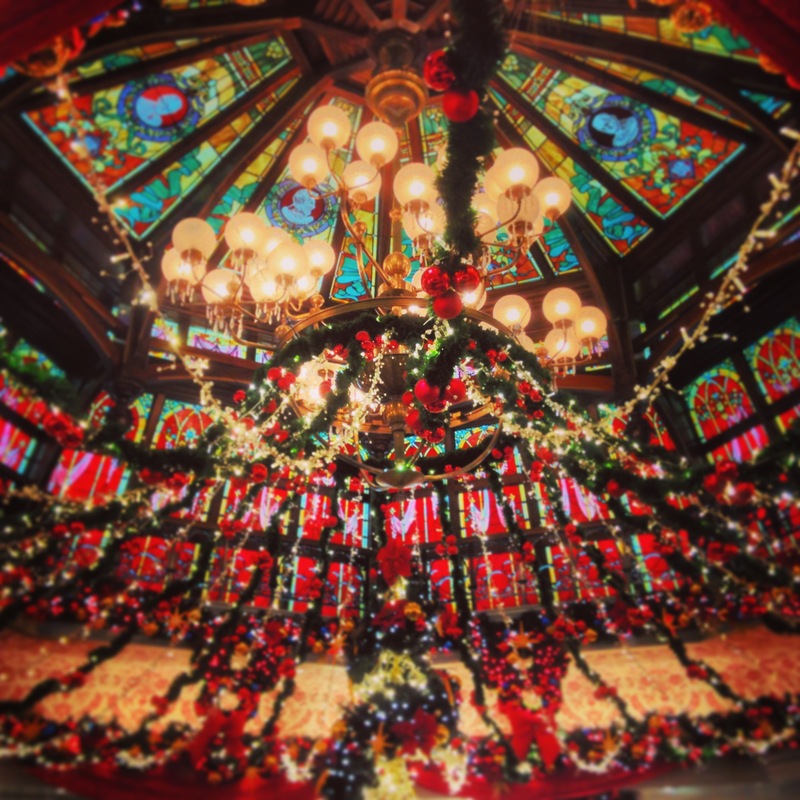 After a trip around the shops, my uncle, aunt and cousin left as my cousin had school the next day, leaving me alone to wait in the shops until Disney’s Christmas Wishes and the big finale of the day – Disney Dreams Christmas. The shops were packed with people waiting for the shows… and it seemed as if every small child was deliberately going out of their way to touch the hundreds of glass baubles on display. Every so often you’d hear the tinkling of glass smashing followed by a parent’s gasp of horror. I was starting to feel the icy rain by this point but I’d heard so much about the ‘Disney Dreams’ light and water show, where images are projected onto the castle to spectacular effect, that I didn’t want to miss it. If you get a chance to see ‘Disney Dreams’ then do so – this may sound cliché but it’s entrancing – probably the closest that you’ll ever get to bathing in pixie-dust (…I went there). 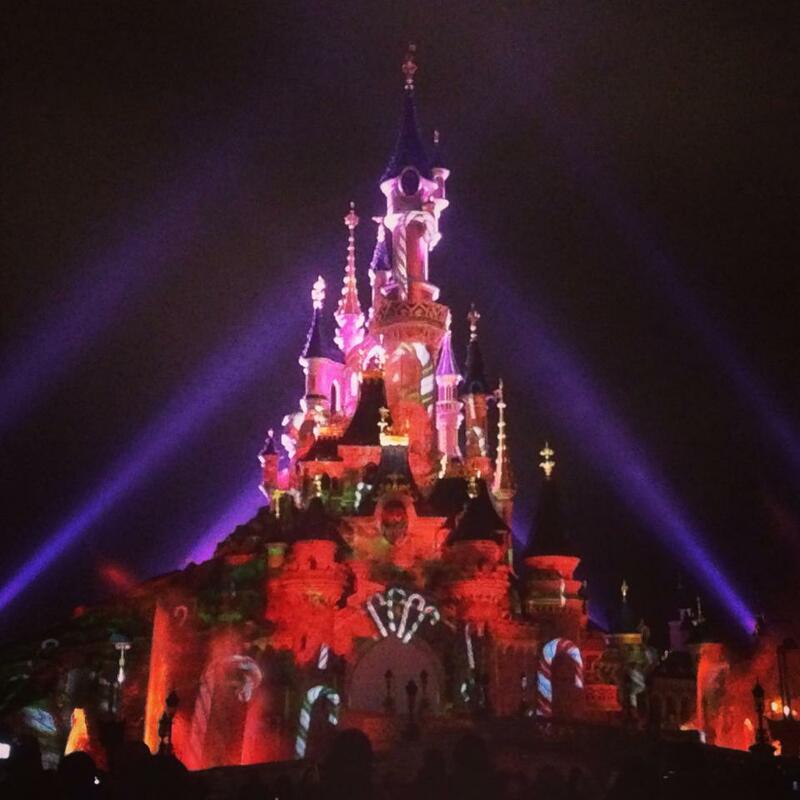 I watched the Christmas version which featured scenes from ‘Bambi’, ‘Toy Story’, ‘Fantasia’ and ‘Frozen’ – hearing Idina Menzel’s rendition of ‘Let it go’ from ‘Frozen’ as fireworks were shot off from the Castle was incredibly moving. Completely soaked to the bone and shivering, I left at the end of the show as the park was closing, ran to the RER station and managed to get a hot chocolate just before the station shops closed down. I then hopped onto the RER and managed to find a seat before the rest of the disney crowds packed the train compartments. Mission accomplished, I settled down with my hairbrush (plucked magically from the satchel of wonders to the bewilderment of the men sat next to me) to try and make myself look less like a bedraggled swamp monster. I stopped off in Vincennes to dry off and be fed pasta and drink Monaco’s (thanks go to G) before being accompanied part of the way back to Florence’s apartment at about 11pm. 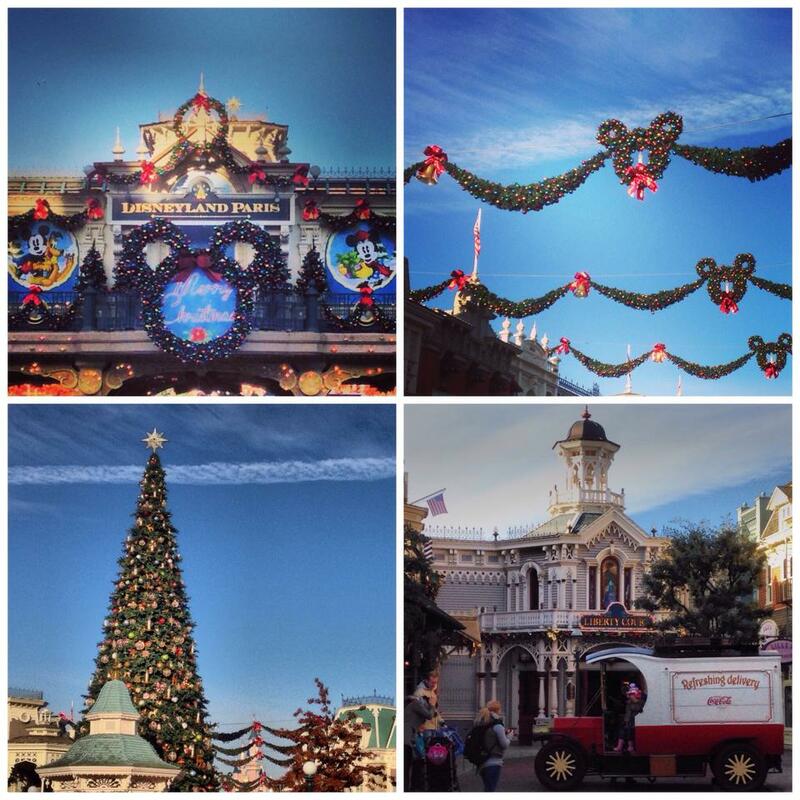 All in all, I had another wonderful Disney experience – with several pictures to add to my memories! 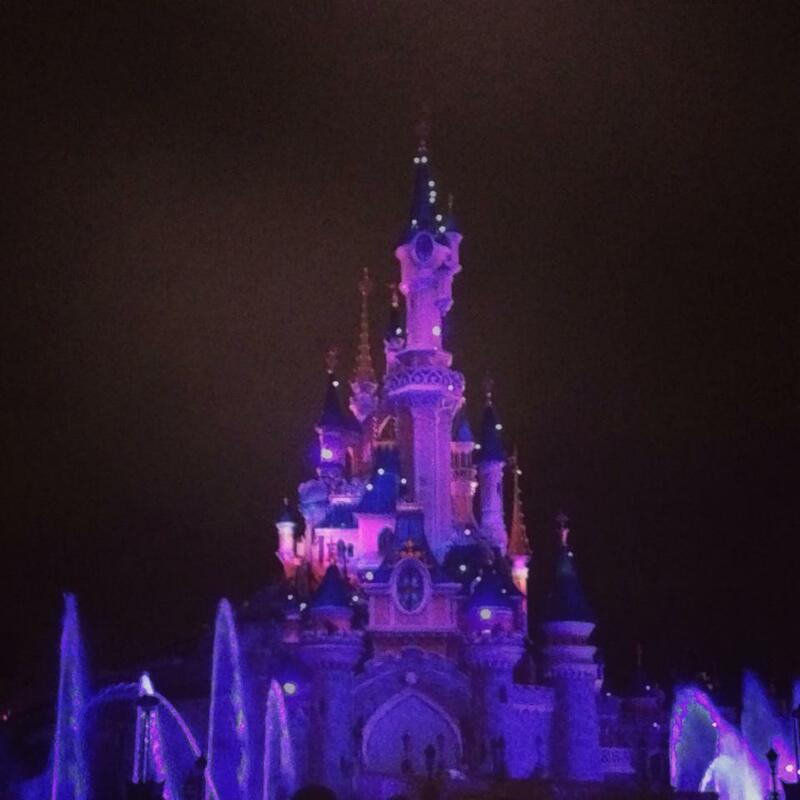 Thanks go to my Uncle, Aunt and Cousin for taking me to Disneyland Paris – hopefully it won’t be too long before my next visit to a Disney Park! 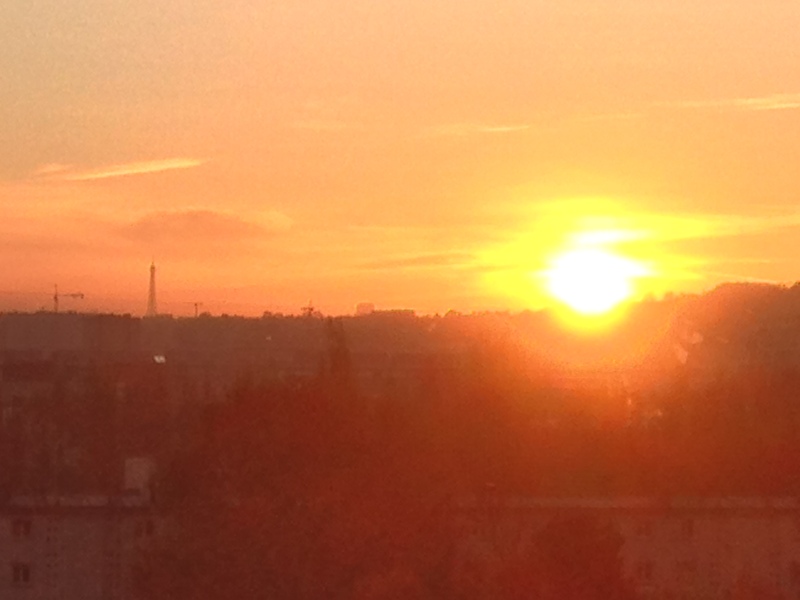 Are you ready for another story from Paris? Well then, I won’t keep you waiting a moment longer! The day started off slightly overcast – after having been reunited with my suitcase, I spent a while deciding what shoes to wear on my day in the city before eventually settling for sensible flats. Heels are all very well but when you’re dashing all over the city and having to anticipate the thought of climbing lots of stairs at BREAKNECK SPEEDS (slight exaggeration) then flats are the best option… Satchel packed with a change of clothes, I headed to Maison Blanche (which is not a glamorous presidential house or home to Blanche Neige but a relatively small and quiet metro station) where I took line 7 to Châtelet. 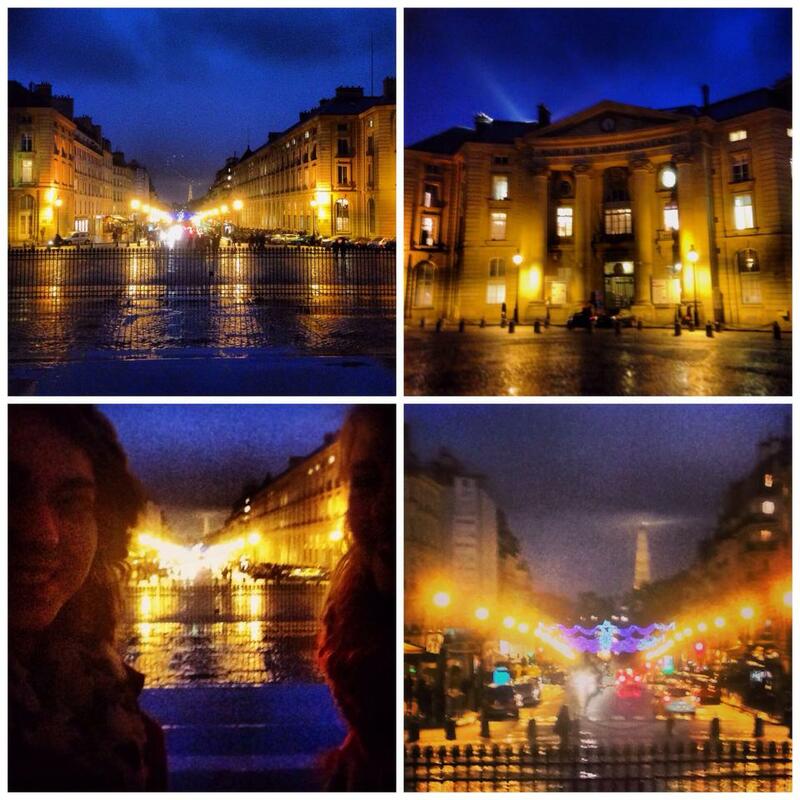 Emerging from the underground, I was greeted by the stunning architecture in Place du Châtelet. I soon found myself crossing the Pont au Change (a bridge which features as an iconic location in two of my favourite books Victor Hugo’s ‘Les Misérables‘ and Patrick Süskind’s ‘Das Parfum’. The latter tells the story of a sensual yet gory quest for the perfect scent through 18th Century France and a large portion of the book takes place at a fictional parfumerie on the Pont au Change). From the bridge, I got a great view of the Palais de Justice complex, which is a really impressive sight to behold. Whilst the gothic towers and spires look as if they belong in the illustrated pages of a fairytale book, it’s important to remember that Paris has more than its fair share of dark secrets. 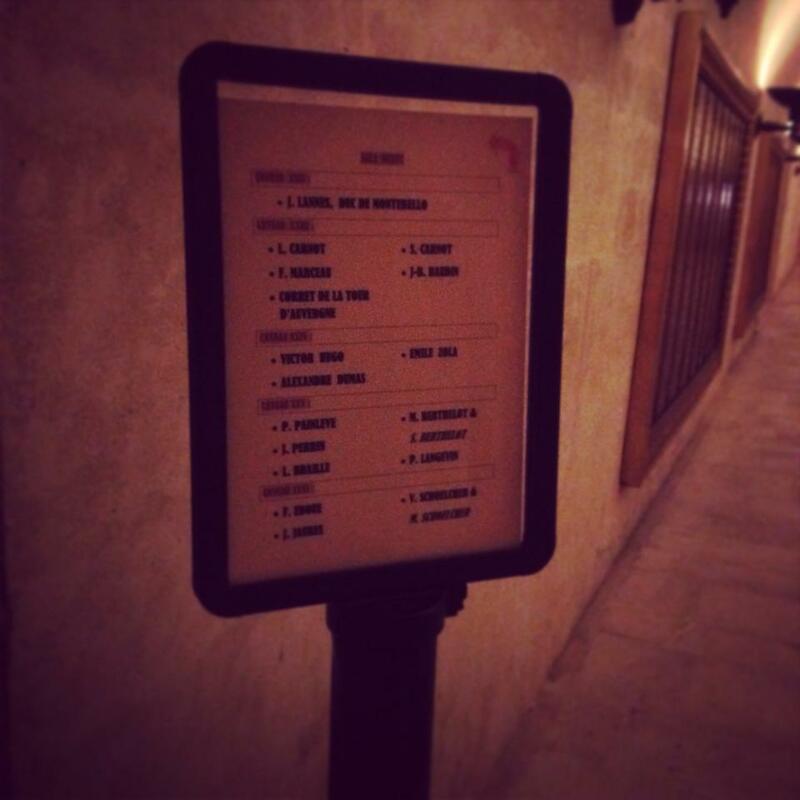 This building has a particularly bloodthirsty past, for it was in the Conciergerie, an ancient prison within the complex, that numerous prisoners (including Marie Antoinette) were imprisoned before they were guillotined during the Reign of Terror. 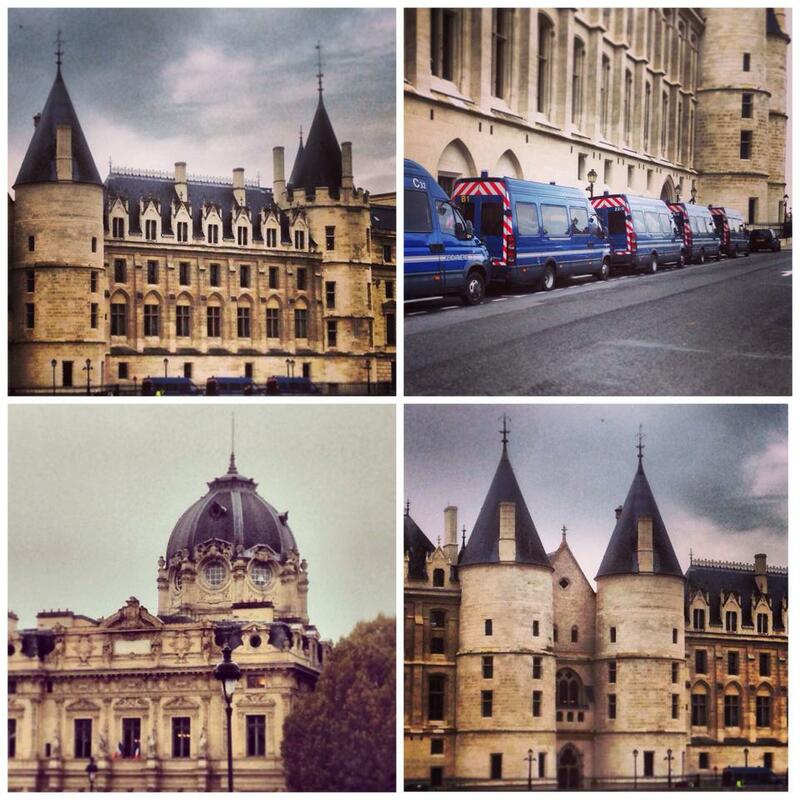 Just around the corner from the Conciergerie is the Palais de Justice – this is the most exciting part of the building because this is where all the action takes place and where justice is carried out to this day! This was a very busy area, with a heavy police presence. The national tripartite motto of ‘Liberté, égalité, fraternité’ is featured on the façade of the Palais, with one word chiselled above each of the three main doors. When you cross over the Pont au Change, you leave the right bank of the Seine and find yourself on the île de la cité – a natural island on the River Seine, which is dominated by the iconic gothic cathedral Notre Dame de Paris. 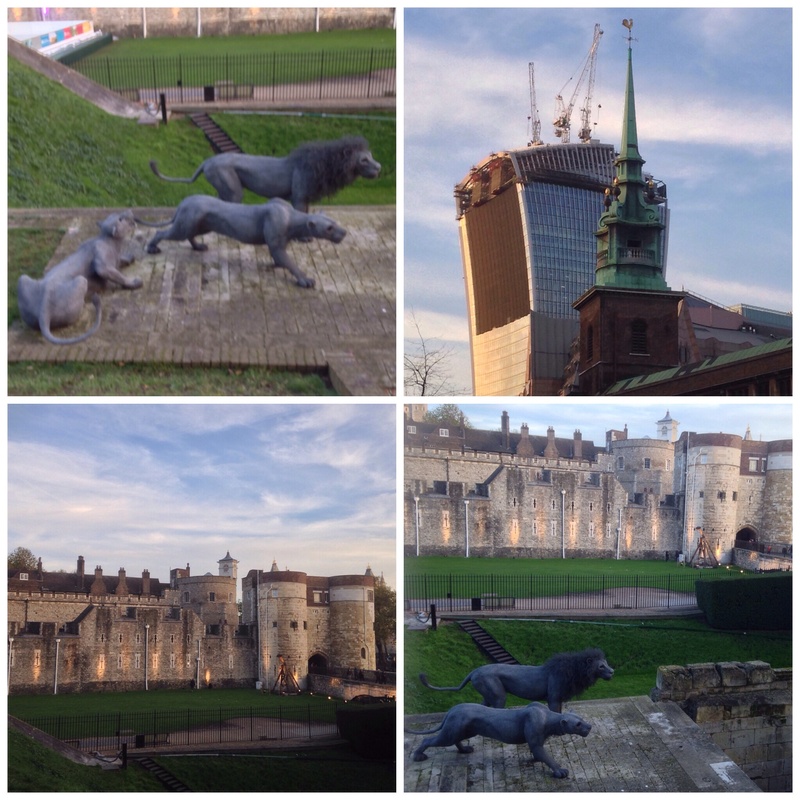 I do have to admit, however, that even though the view of the plaza was compromised by the big blue monstrosity, the view from the platform was spectacular, giving the viewer a closer look at the ‘Gallery of the Kings’, a line of statues on the Cathedral façade. The air was cold and even though I wasn’t that high up the ground, it felt as if I was at quite a high altitude. I stayed for a while gazing at gargoyles – and I ended up being approached by a seemingly never-ending chain of couples wanting to have their photographs taken with the impressive backdrop of the Cathedral. This went on for a good twenty minutes, (I started to feel as if I was a teacher on a school trip in charge of everyone’s cameras) but it was actually quite a lovely feeling helping others get a good memory to take home. 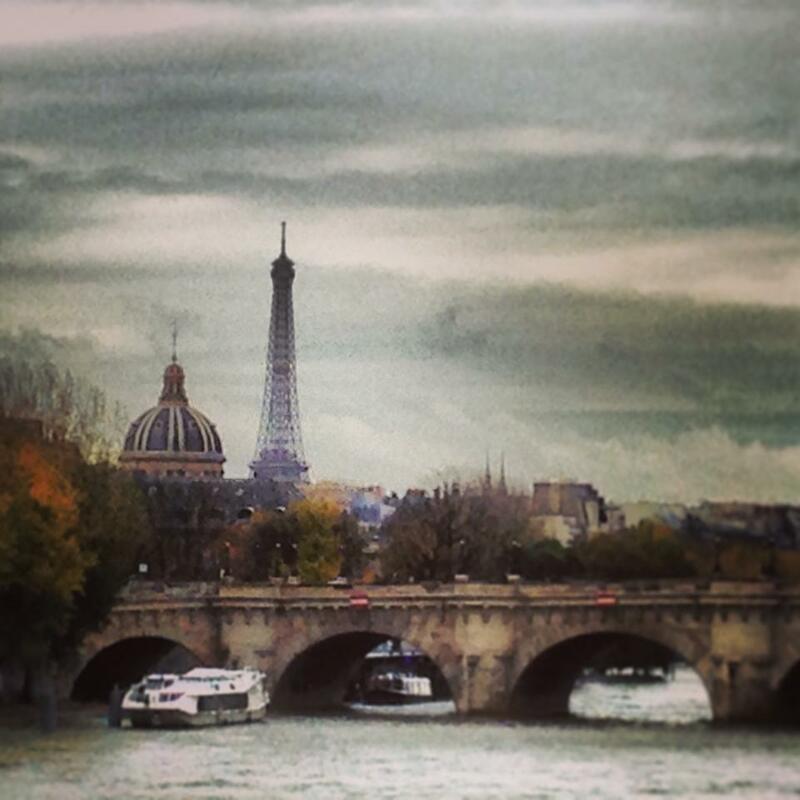 Moving swiftly onwards, I left Notre Dame to have a look at the ‘Bouquinistes of the Seine’. 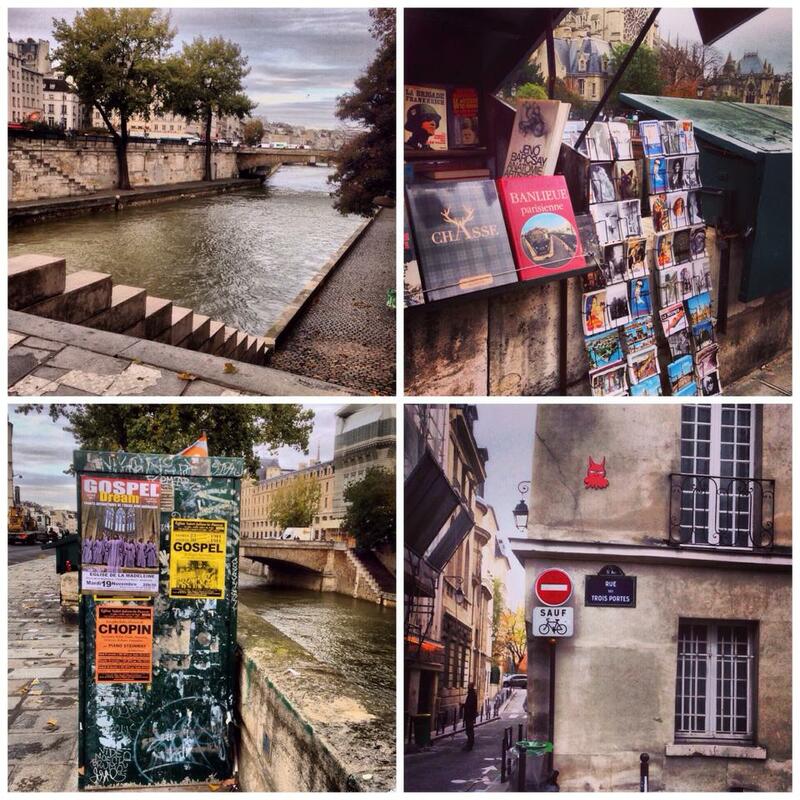 Along the river, you will find green stalls which have a large variety of second hand and antiquarian books – as well as the obligatory postcards of the Eiffel Tower, cats and Brigitte Bardot. Pieuvres aside, I continued on my travels and eventually stumbled across a weekly market. Taking a break to buy a drink, I was amused momentarily by the commotion caused by a small flock of pigeons flying out from behind the counter of a bakery before I looked at the time and realised that I had to meet a friend in the west of Paris and that I had no idea where I was supposed to go, which metro line to take… or indeed where the nearest Metro station was. Although I was cutting it very fine, I made it just in time and promptly found myself in a Japanese restaurant with ‘G’ struggling to make a dent into a large platter of avocado sushi, rice, mushroom skewers AND miso soup whilst trying to appear elegant and demure using a pair of chopsticks. 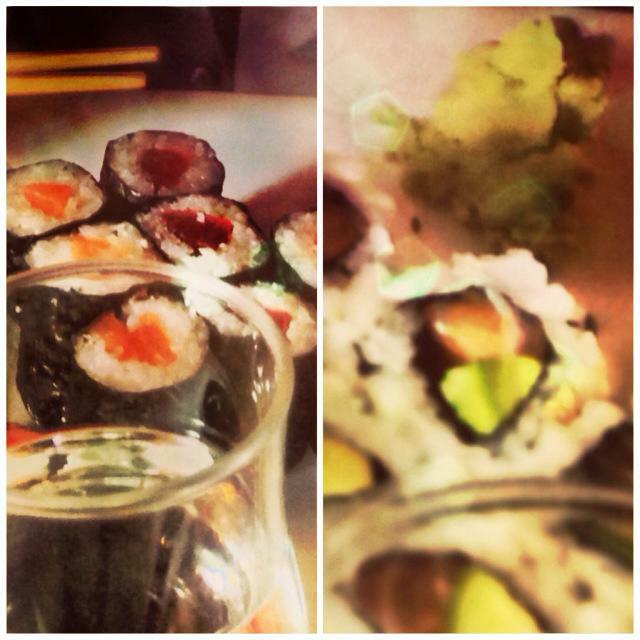 A sushi massacre ensued. 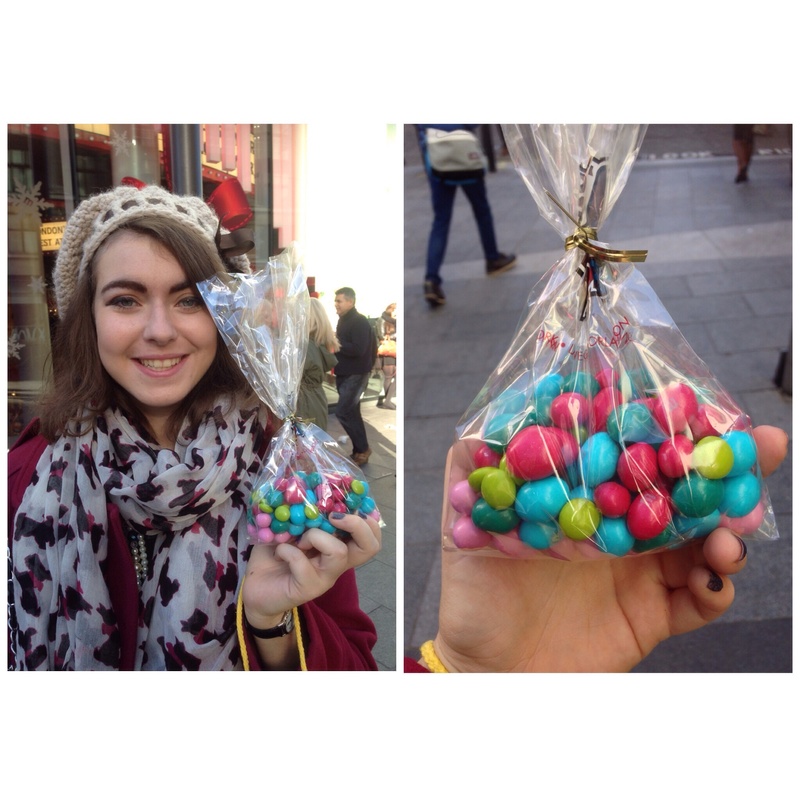 Seeing as I had moved onto the west side of Paris, I was relatively close to the big department stores Printemps and Galeries Lafayette on Boulevard Haussmann. Outside, the grey clouds were dispersing, leaving the skies over Paris a glorious shade of bright blue, so I decided to go for a walk along the boulevard. 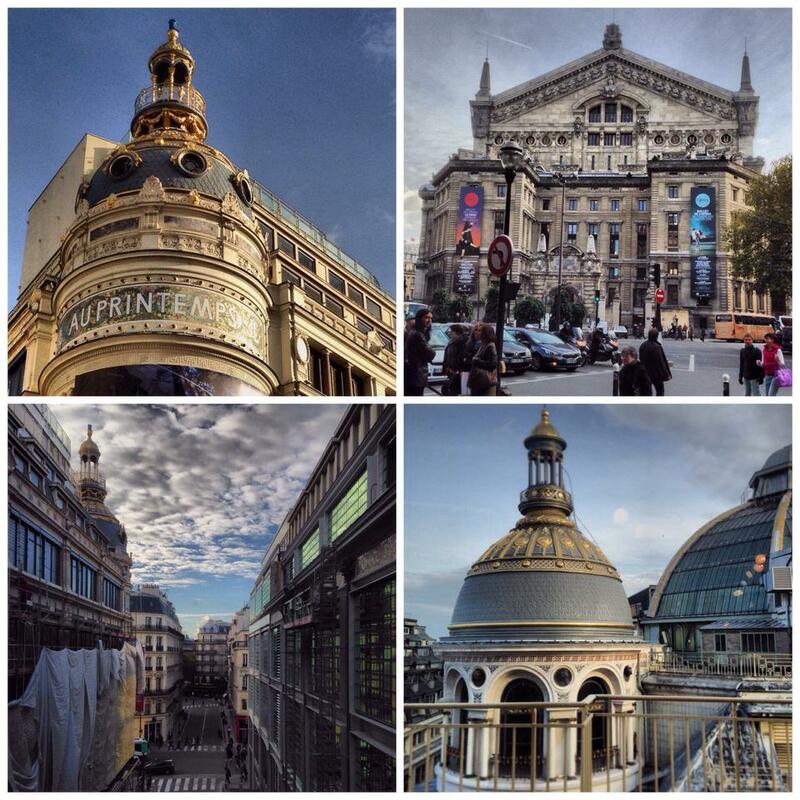 The blue skies were contrasting beautifully with the golden art nouveau domes of Printemps’ Flagship store. The shop windows were beautifully decorated for the festive season. 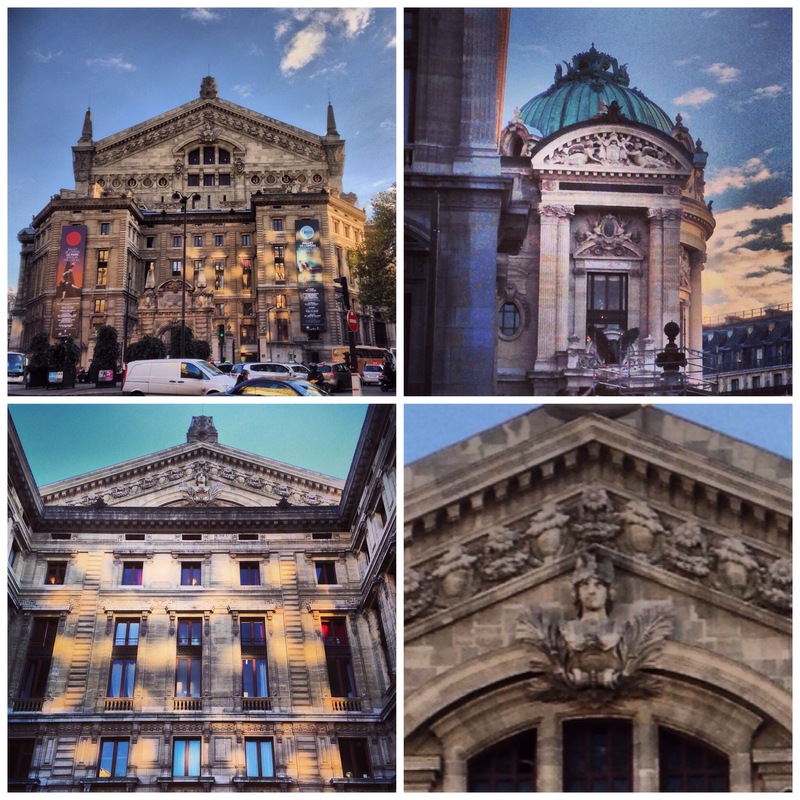 Just across the street from Printemps is the rear façade of the Palais Garnier, l’Opéra National de Paris. 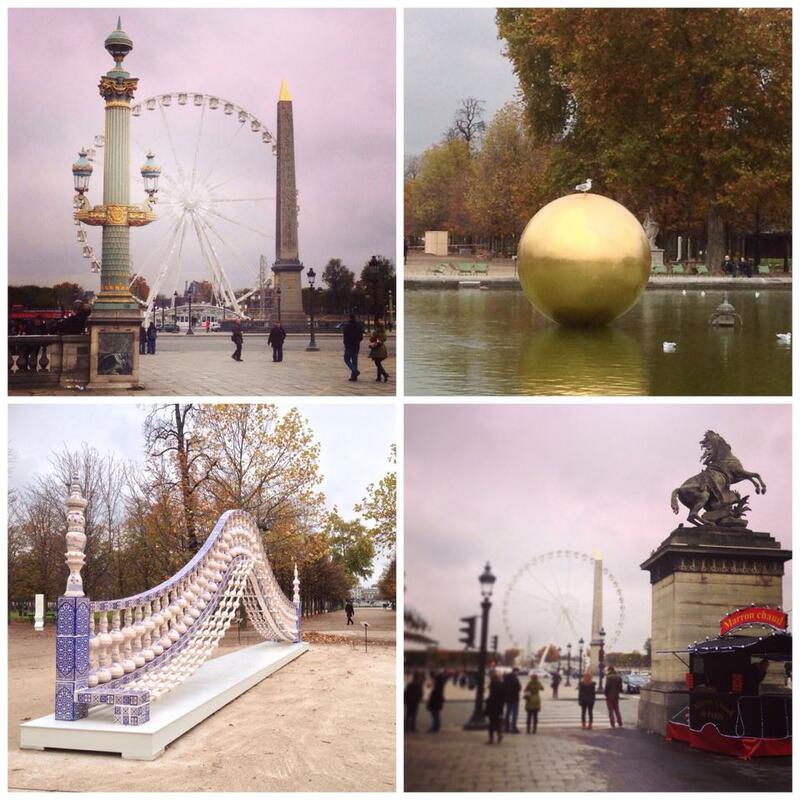 This structure was planned by Napoleon III and designed by Charles Garnier – the project completed construction in 1875. It’s an opulent, beautiful building – and was the scene and inspiration for Gaston Le Roux’s 1910 novel ‘Le Fantôme de l’Opéra’. 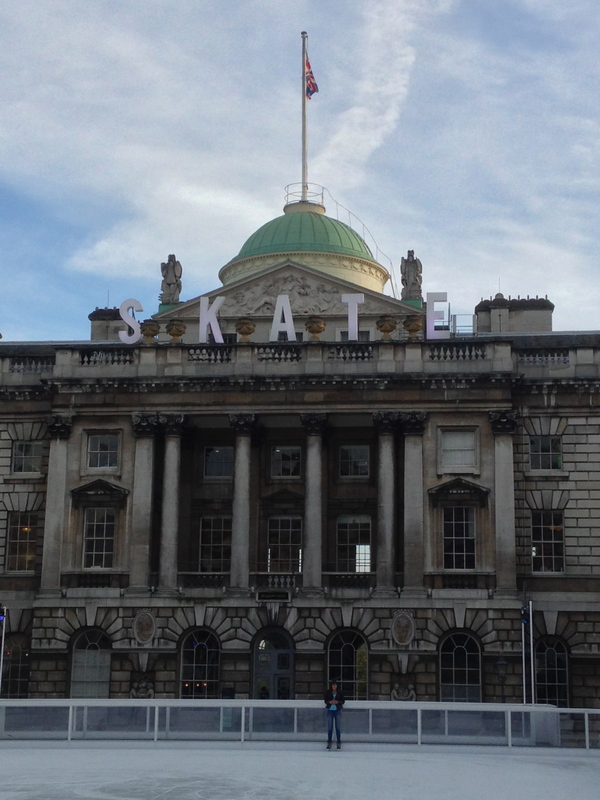 Having recently been bowled over by Gerónimo Rauch’s performance as Erik the Phantom in London, I had been particularly looking forward to getting a closer look at the building. Florence had told me that if you turn up an hour before certain performance then it is possible to get cheap tickets, however I didn’t have time to try this out. 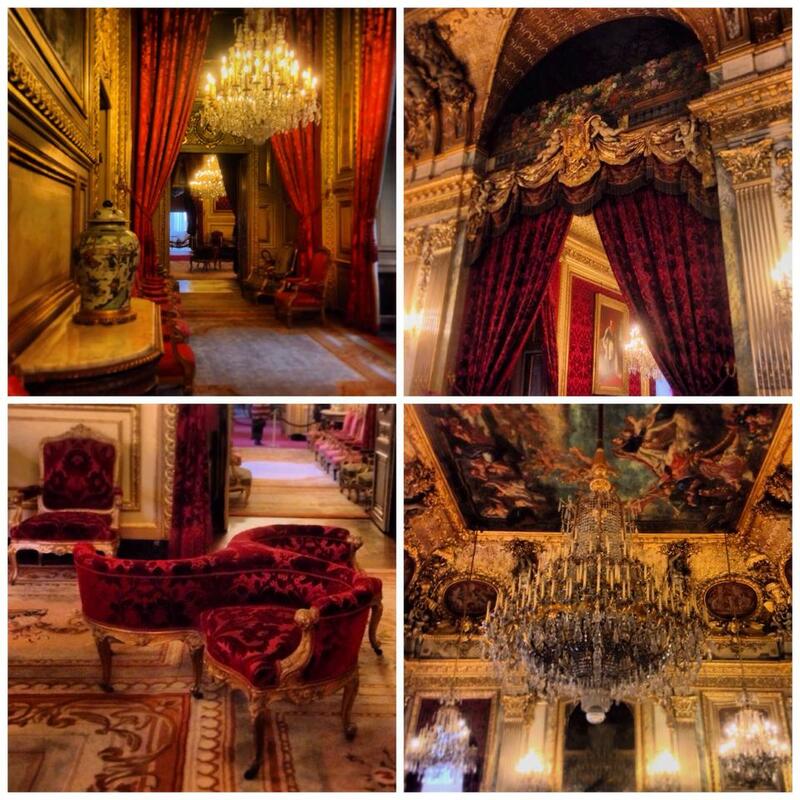 The Opéra interiors are gorgeously decadent and can be toured for a small fee of around five euros. I allowed myself to get lost in the glitzy decorations of both Printemps and Galeries Lafayette (which was built 30 years after Printemps) for a few hours. 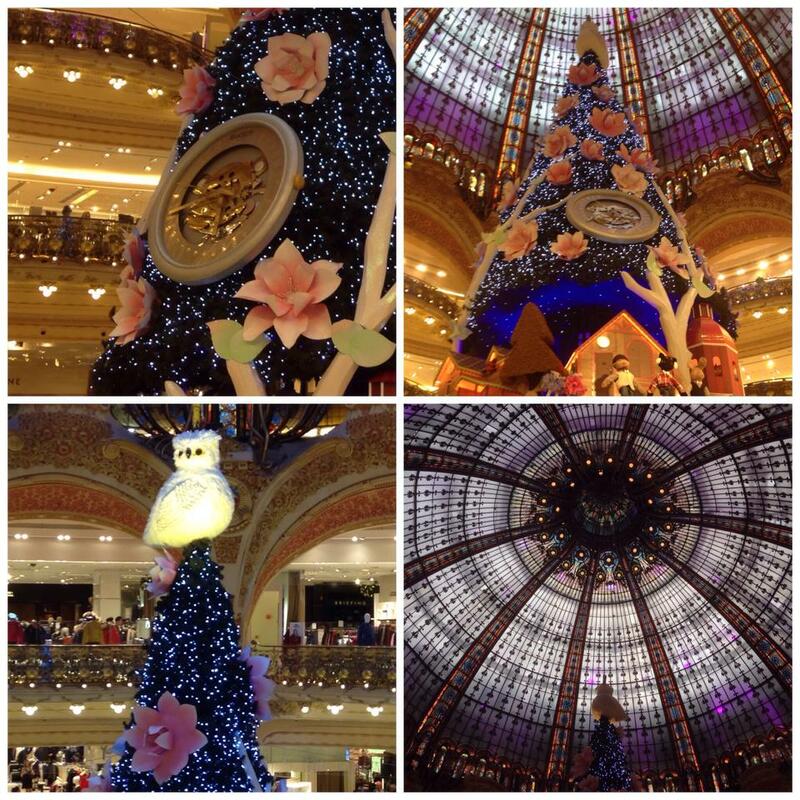 The Christmas tree in Galeries Lafayette was the most beautiful tree that I’ve ever seen. It was lit up with electric blue lights and studded with large pink flowers with mechanical petals which opened and closed at regular intervals. A big snowy owl perched at the top of the tree whilst animatronic puppets of mice, cats, rabbits and monkeys danced above the heads of shoppers making extravagant purchases at the make up counters on the ground floor. Galeries Lafayette has ten stories and so there are escalators on each floor in order to make the ascent to the heavenly glass domed ceiling – ‘la coupole‘ – much easier on your legs. I decided to make my way up to the top in order to get a closer look at the big fluffy owl. 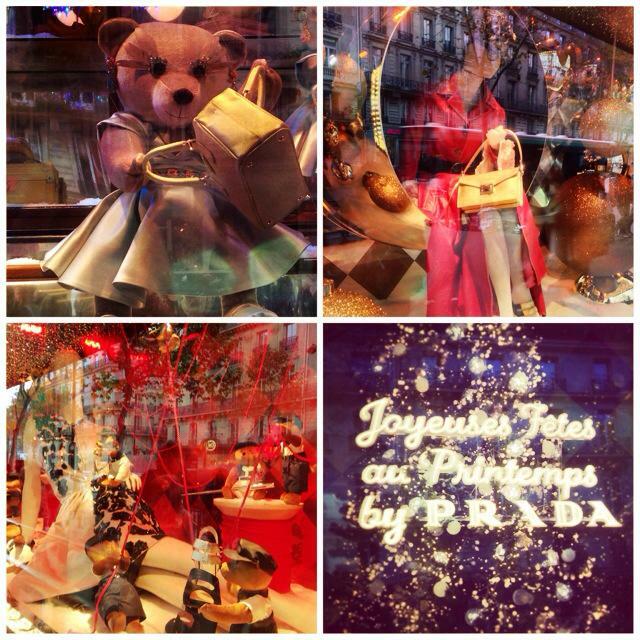 For many families, it’s a time honoured tradition to go and see festive displays in the big Parisian department stores. 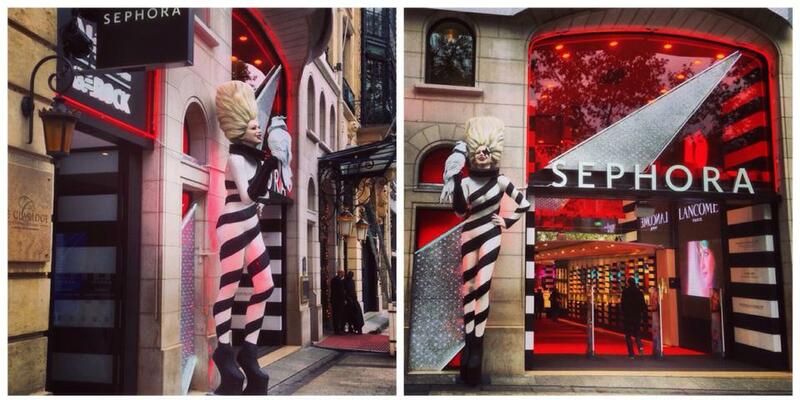 The 2013 window displays at Printemps were designed by Fashion House PRADA. Grown ups and children alike were peering into the colourful vitrines whilst upbeat retro music played from speakers – I especially enjoyed hearing the goose walk from ‘The Aristocats’. I would return later to Boulevard Haussman later in the week with my mum to bask some more in the bright lights and beautiful shop displays. As dusk began to fall, however, the time came for me to head to Chatou, a town in the suburbs famous for being popular with impressionist painters, to spend an evening with my uncle, aunt and cousin. For me, a trip to Paris is never quite complete without a stroll down “the World’s most beautiful avenue” – the Avenue des Champs-Élysées. The majestic Arc de Triomphe stands at one end of the avenue (if you want a view fromt the top, then the 300+ steps can be climbed for a fee) whilst the obélisque de Louxor waits for you at the other end. The obélisque, which is over 3,000 years old, originally stood at the entrance to an Egyptian temple – however, it was moved from Egypt to France around 180 years ago when it was given as a gift to the French government. At just under 2km long, the Champs is the perfect place to stretch your legs and people watch – if you’re not afraid of a bit of hustle and bustle and having consumerism thrust into your face. It’s a street where worlds collide and the activity of window shopping reigns supreme. Walking down the Champs, you’ll see all sorts of characters, from excited children on their first ever trip to Paris to little old ladies clad from head to toe in 1930s fur doing a bit of ‘lèche-vitrine’ whilst walking their poodles and pomeranians. 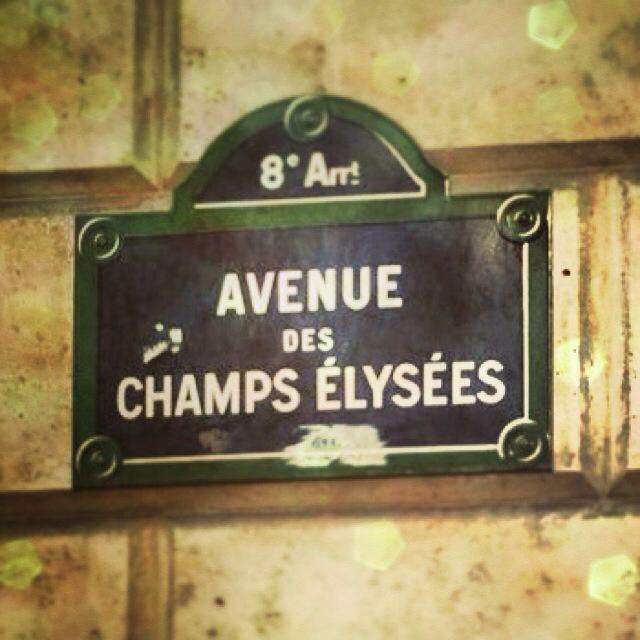 From Chanel and Louis Vuitton to Quiksilver and H&M, from Fouquet’s to Macdonalds, the Champs-Élysées has it all. The shops are all beautifully laid out – particular highlights include the Nespresso boutique (which has walls studded with gleaming jewel coloured Nespresso capsules), the car showrooms, which always have intriguing displays showcasing the latest must have luxury vehicle and of course, the piles of cakes and sweet treats placed alluringly in the windows at Ladurée. My favourite part of the Champs are the arcades and galeries – these areas feature stunning 19th century architecture and are tucked away under covered passageways sandwiched between the larger shops. Inside the galeries, chic boutiques, vintage bookshops, souvenir emporiums and James Bond-esque gadget shops nestle side-by-side. So, with time to spare in Paris, it was only natural that I would be tempted to go to the Champs-Élysées – after all, window shopping doesn’t cost anything. After a breakfast of pastries in Villiers, I got on the metro and changed line a few times before arriving at my destination. 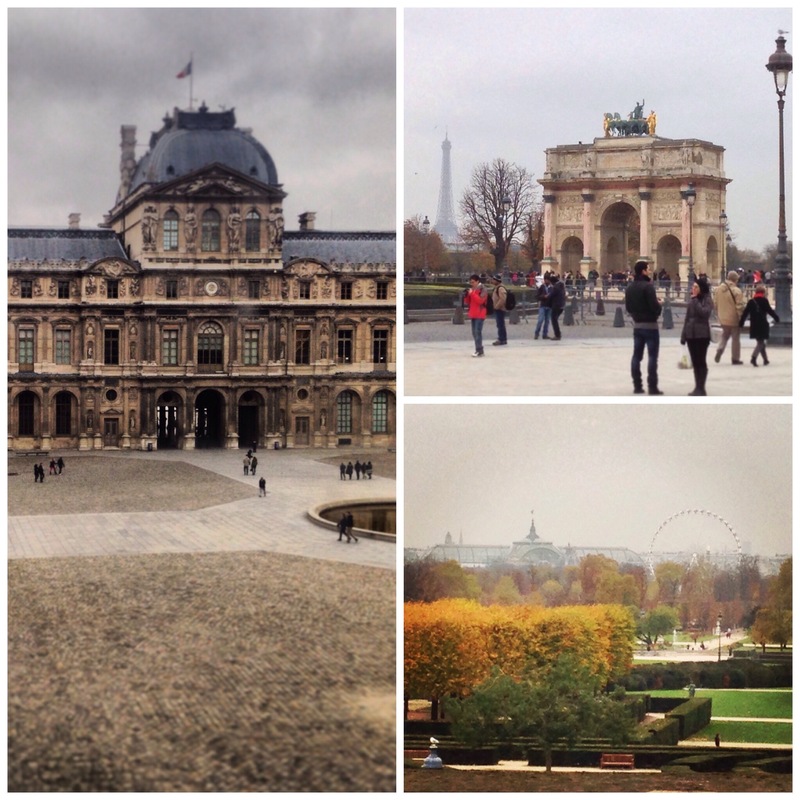 I decided to walk the 2km along the Champs to the Louvre through les jardins de Tuilieries. 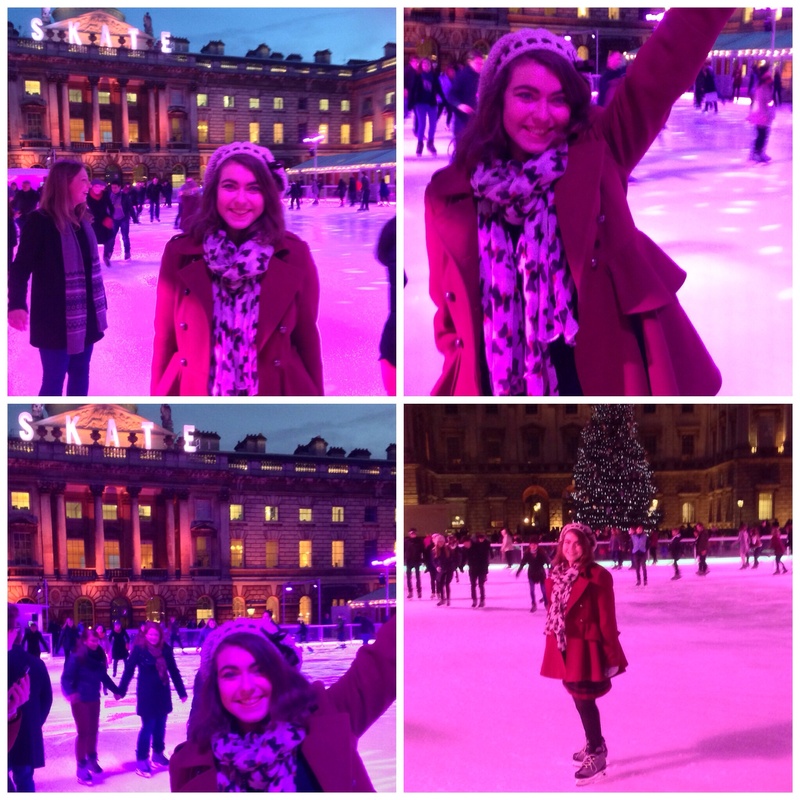 As this was just before the festive madness, the streets were relatively quiet, and I slipped into a reverie, gazing at doubledecker tour buses, pastel green Ladurée vans and sparkly shop windows… until all of a sudden a giantess came into view. I feel that if David Bowie, a Falconer and Kirsten Dunst were fused together and thrown into the Baroque era, then this statue would be the outcome. 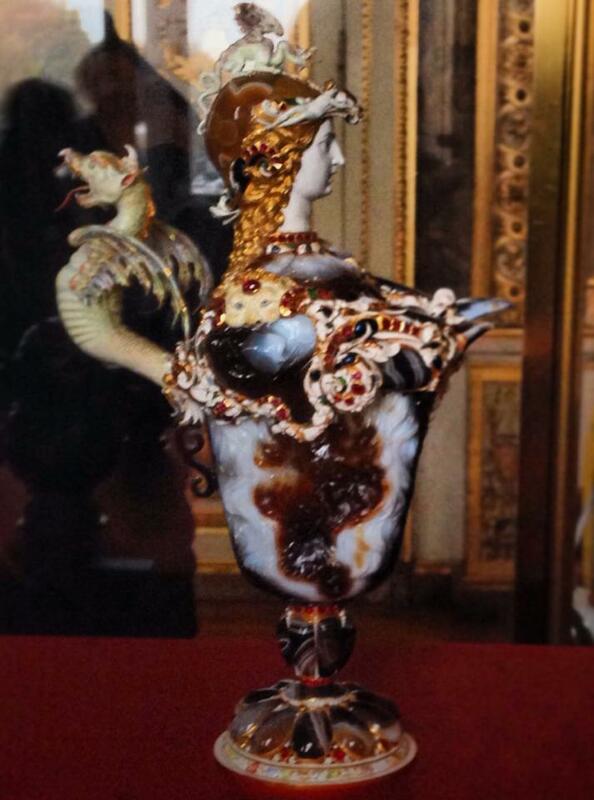 The theme for the holiday season was ‘Noël Barock’ which was conveyed pretty well through the outlandish décor. I have to admit that glam rock Marie Antoinette was quite alarming (i.e.terrifying) but I headed into Sephora regardless. Inside, I was greeted with the sight of stuffed cockatoos and a vast 1,500m² cavern of cosmetics, perfumes and powders. Upon entry, I was duly spritzed with a Dolce and Gabbana scent by men (dressed as butlers) who were lurking just inside the entrance, waiting for unsuspecting shoppers to strut in from the street and down the red carpet. 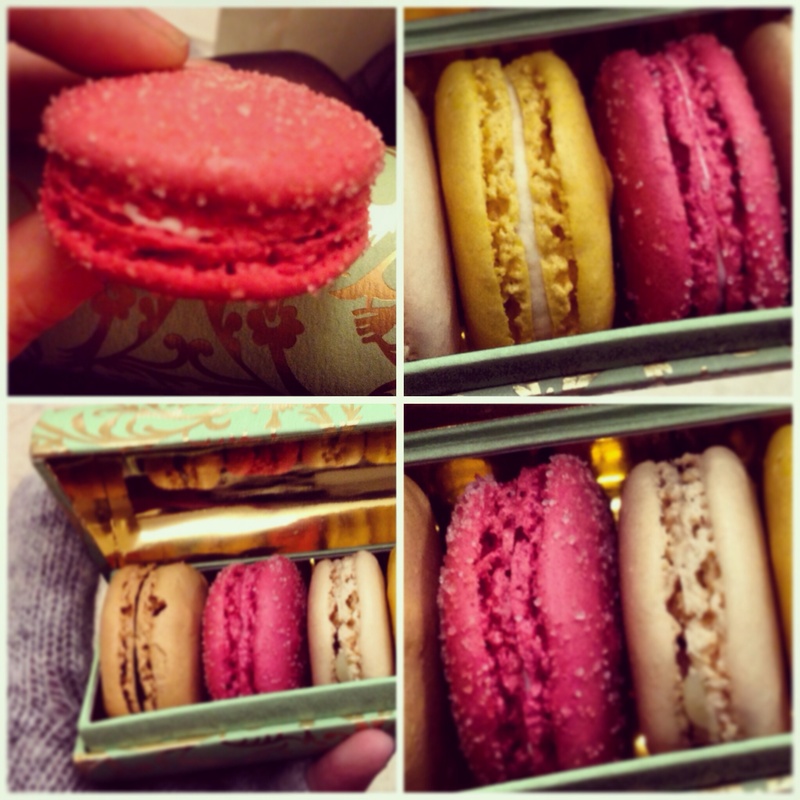 After checking out the new Ladurée makeup range, (originating from Japan, the cosmetics are sold exclusively in France by Sephora) I continued on my way and arrived at Place de la Concorde. Below you can see the obélisque de Louxor as well as la Grande Roue de Paris – a large transportable ferris wheel that has traveled all over Europe. I was particularly captivated by the mint green lamp post, which is quite possibly the most flamboyant LAMPADAIRE that I have ever seen. 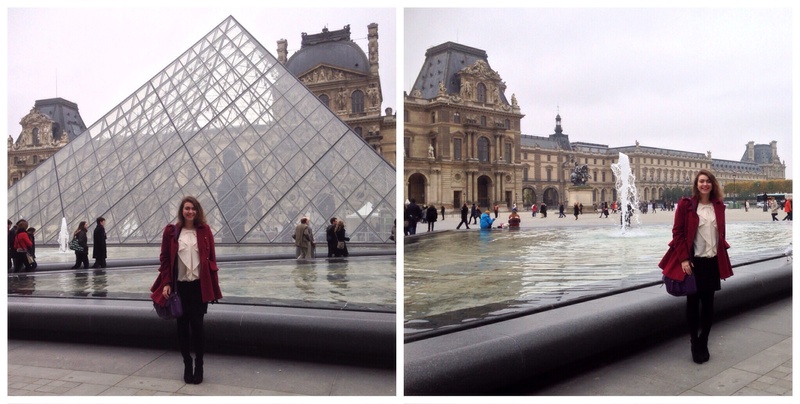 Eventually I found myself back at the Louvre. Feeling a bit peckish, I bought myself a baguette from PAUL (www.paul.fr) which had a little van situated next to L’Arc de Triomphe du Carrousel. PAUL does great sandwiches (including, in my opinion, the best sandwich of all time) however when it comes to bakeries in Paris, then you really are spoilt for choice. If you’re planning a trip to Paris and are looking for ways to budget during your stay, you can save money food wise by having picnics or by eating on the go. Fruit, cheese and baguettes (and of course, wine) from the supermarket are all relatively cheap and taste great. 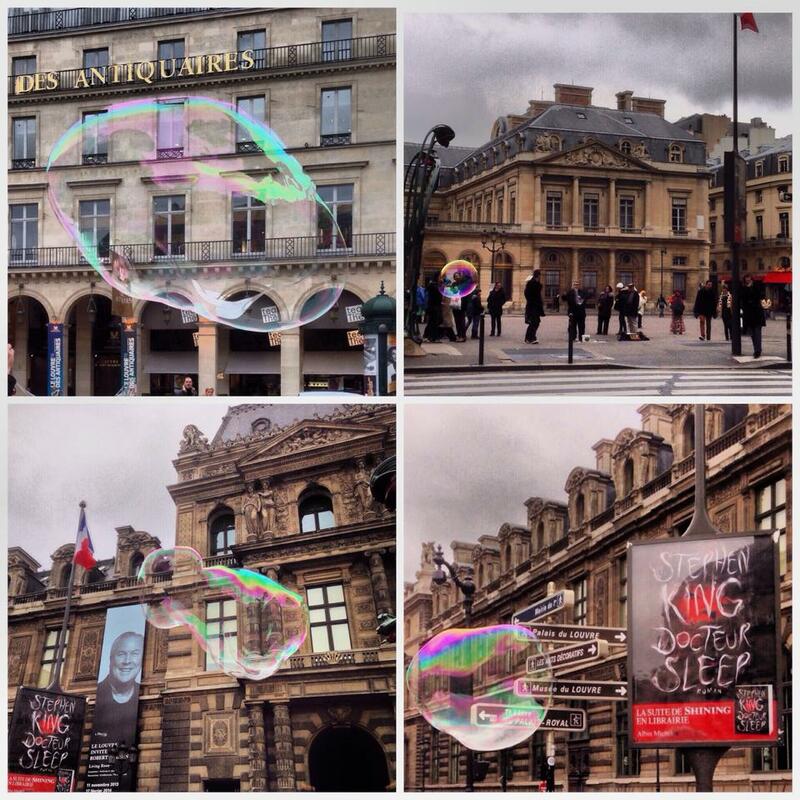 Before I headed back to the deep dark depths of the Metro, I stopped to gaze at these giant bubbles that were being blown by a street performer just in front of the Palais-Royal. The buildings of the Palais-Royal are home to the Comédie Française (a famous state theatre group) the Minstry of Culture and a national library, amongst other things! La Place de Colette (named after famous French novelist Sidonie-Gabrielle Colette, the writer of ‘Gigi’) is a particularly lively area, surrounded by grand hotels and antiquarian bookshops and has a very fancy metro entrance – the “Kiosque des noctambules”. See that dapper chap bottom right? That’s Molière, France’s answer to Shakespeare. If you’ve ever had to study French Literature, then you’ll probably be well acquainted with Molière. His works always feature somewhere on the literature syllabus of the French Baccalauréat! 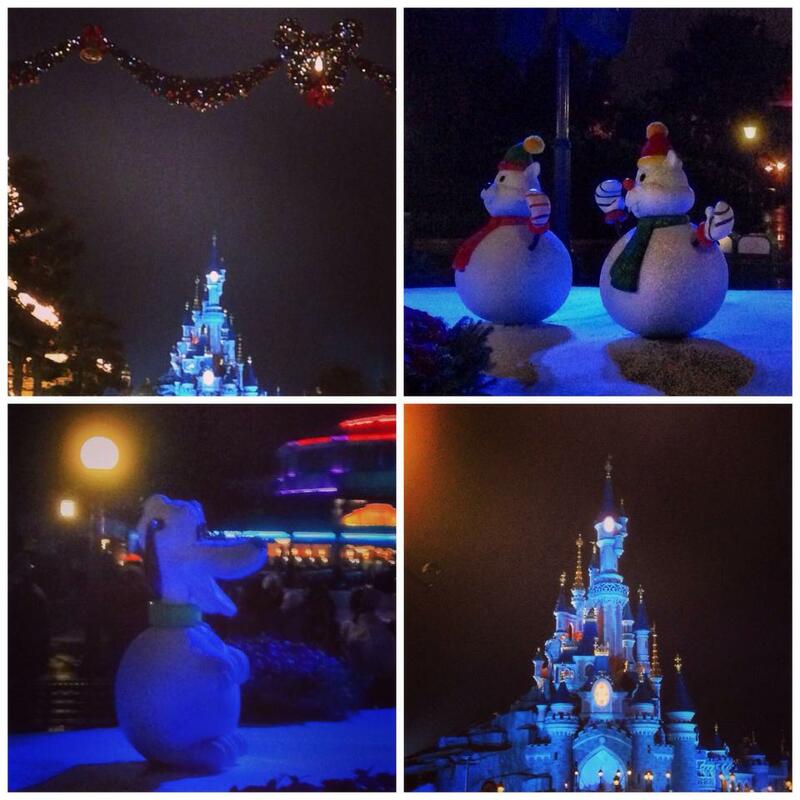 Coming up soon – Disneyland Paris, Place des Vosges and a recipe for galette des Rois! I left the planning of the first day in Paris down to the resident Parisian – Florence is a classy miss with a passion for culture and beautiful things so I knew that I was in good hands. 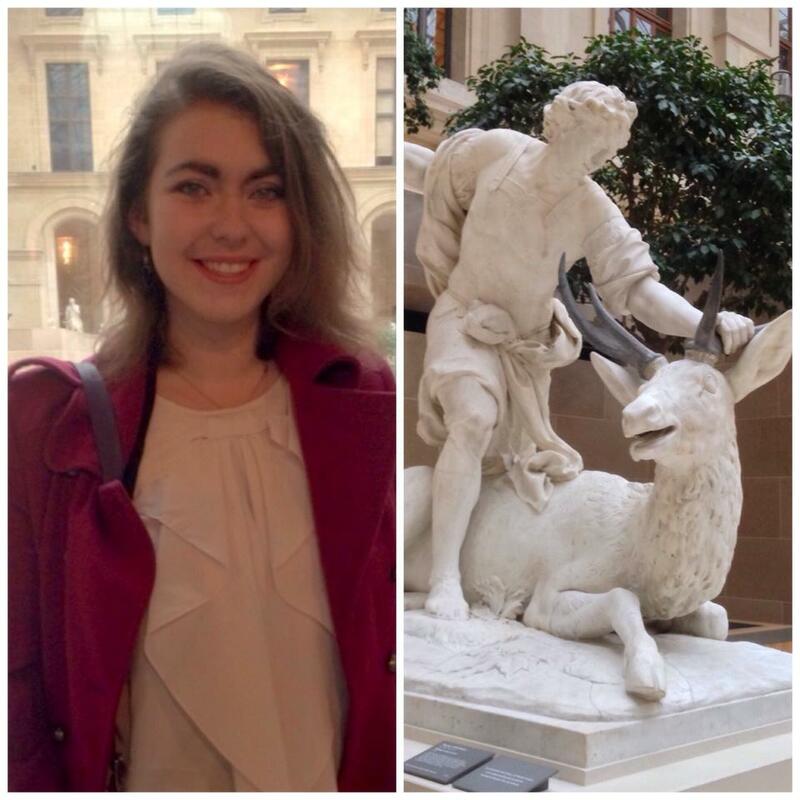 We bid farewell to Claire, who had a lot of essays to work on, and were off on the metro to the Palais du Louvre to spend a leisurely Sunday morning sauntering around the shops in the Carrousel du Louvre. We started off with a coffee break in Starbucks ( The irony of going on a cultural trip and ending up at Starbucks within the first five minutes has been pointed out to me. There is both a Starbucks AND a McDonalds under the Louvre which is frankly a bit surreal. We were hoping to use their wifi. There was none. 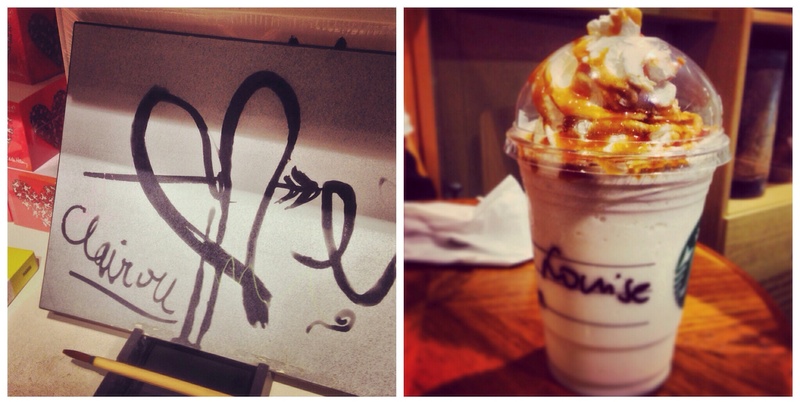 I clearly hadn’t adjusted to the parisian cold yet and thought that a frappucino would be a wise idea… wrong). Starbucks was followed by a taste test of the herbal teas on offer in L’Occitane en Provence, and scent smelling in Fragonard before we were suddenly inspired by the great masters and decided to give some of the art themed products from the Carrousel shops a test drive – there were quite a few cool gadgets, such as this ‘Bhudda slate’ that allows you to draw a design with water before slowly absorbing and erasing your scribbles masterpiece. After purchasing a few postcards, it was time to get down to business – we headed up the escalators to visit the famous Musée du Louvre, which is one of Paris’ top tourist attractions. The Louvre is one of the largest museums in the world, famous for its stunning architecture, art collections, glass pyramids and for paying host to Leonardo di Vincis’ famous ‘Mona Lisa’ (‘La Joconde’ in French), the mysterious portrait of a woman with a winsome smile… or smirk, depending on how you view it. Whenever I’ve walked past the Louvre in the past, it has been absolutely heaving with people, however we were lucky enough to visit on a relatively calm day. If you want to visit the Louvre at peak holiday times, then in order to make the most of your day I would advise arriving early to avoid queues and planning the sections that you want to visit well in advance. An audio guide in English (and many other languages) can be downloaded as an app for android phone and nintendo 3DS XL (I found the nintendo 3DS XL partnership quite intriguing) using the Louvre’s wifi network. To our delight, we were able to get in for free, as free entry is offered to any citizen of the EU (with a valid id card) under the age of 26. This excellent initiative is also available in other Parisian museums and I really believe that it is a great way to promote the preservation of art and culture to young people. 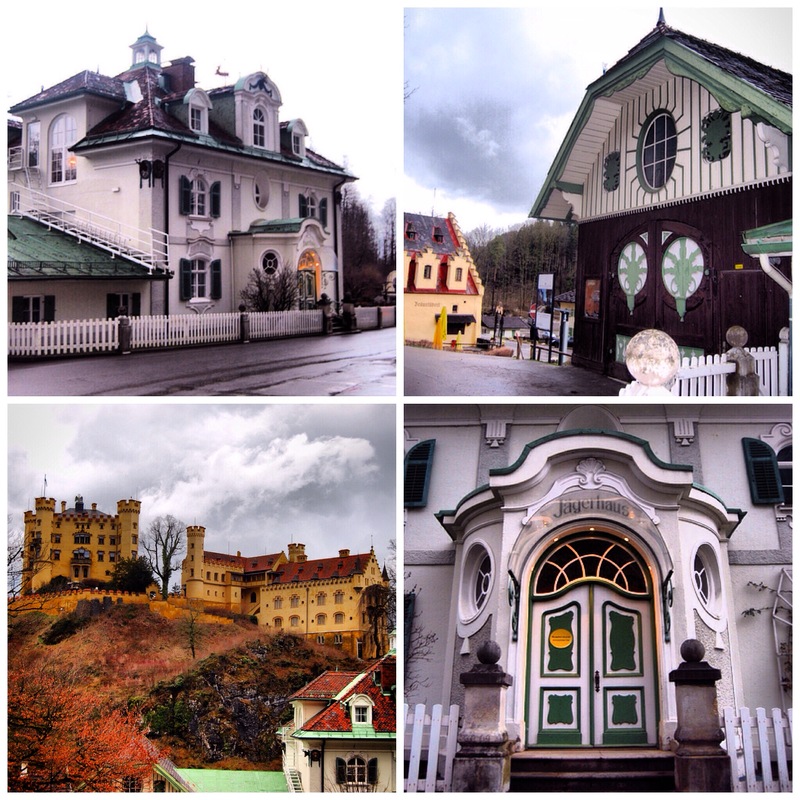 We picked up some plans of the museum, flashed our identity cards and started our visit on the lower floor. Here we were greeted by formidible giant busts (including the bronze bust of Emperor Napoleon below on the left… and this gentleman with rather impressive sideburns on the right) and the medieval foundations (and moats) of the palace building. The ground floor foundations are all that remains of the Louvre’s first incarnation as a medieval fortress. 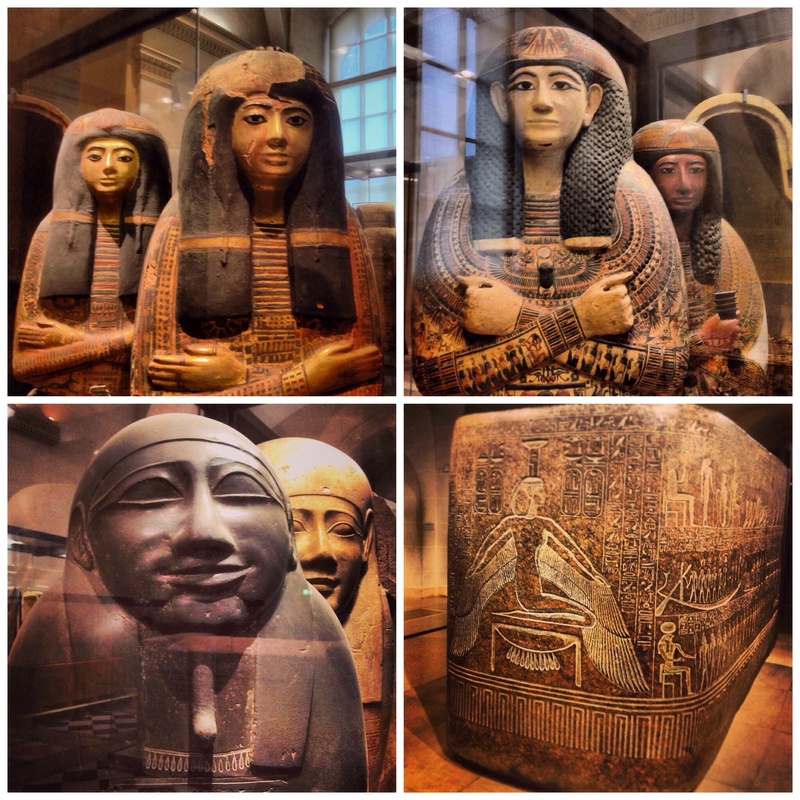 Leaving medieval France behind us, we climbed up some stairs and embarked on a journey through Ancient Egypt. After viewing tools, trades and jewellery (Florence was particularly taken with the scarab amulets), we arrived at the section devoted to Egyptian mummies and burial customs. The devotion to respecting the dead through ornate handiwork, elaborate coffins and the practice of complicated preservation techniques such as individual embalming and burial of organs is both fascinating and bewildering to contemplate. 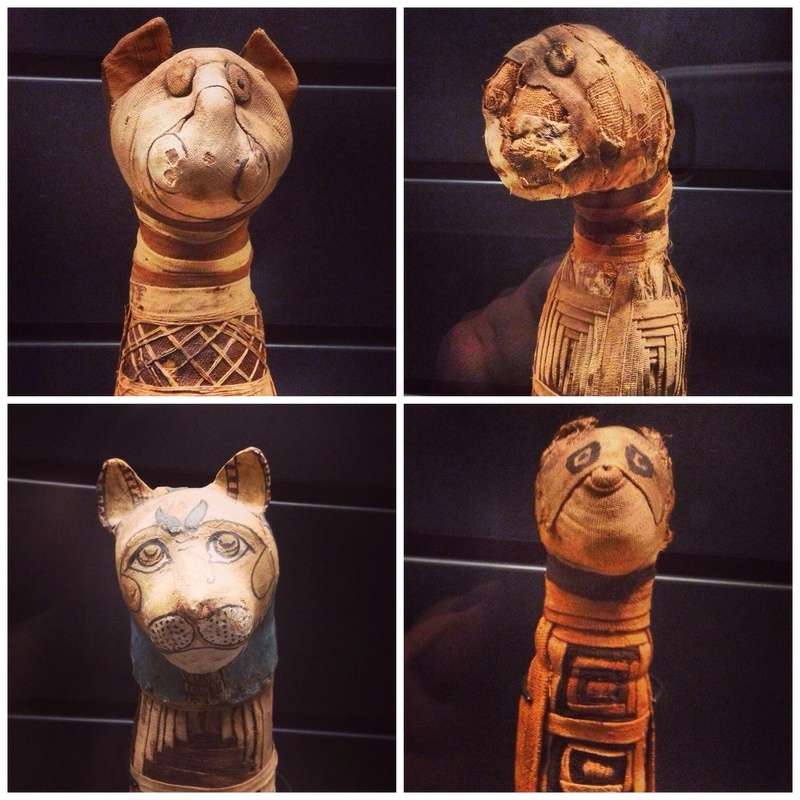 I found the collection of mummified cats particularly intriguing – in Ancient Egypt cats were worshipped and the death of a cat would be treated with great reverence and ceremony. Upon death, cats often received the same mummifying treatment as pharaohs – as you can see below. At first glance this motley crew of cats looked like a collection of long lost bedraggled stuffed toys – it was only on closer inspection that we realised that the seemingly cute painted gauze or plaster faces were in actual fact concealing some rather grisly remains underneath. The bodies are tightly bound with intricately patterned bandages brushed with resin. The organs would originally have been removed for individual embalming – in order to retain their shape, the bodies would have been stuffed with sand or earth before bandaging. Embalming the remains of a dead body ensured that the spirit that once resided in the body would be able to progress on into the afterlife. Occasionally pets were even sacrificed and mummified upon the death of their owner, so that their remains would be able to be placed side by side in the tomb, ensuring that the owner would have a companion with which to cross over into the next life with. Cheerful thoughts! After a substantial amount of time contemplating Mummies, we headed onwards through the Louvre… gazing upwards in awe at the palatial gold lacquered ceilings. ANYWAY, we were gazing up at golden ceilings and heading onwards through the Louvre towards the most valued painting in the world – the ‘Mona Lisa’. As we followed the numerous arrows pointing the way to her, we noticed that the number of people in our vicinity increasing at a fast rate. By the time we actually entered the room where the painting was displayed, we were faced with a real hullabaloo. The ‘Mona Lisa’ is actually surprisingly underwhelming – compared to other works in the room, it’s quite a small painting, cased under thick bulletproof glass (to protect the grand dame of the museum from attack) and surrounded by a cord barrier. It’s not the kind of painting that you can stand in front of and gaze at for ages as to get a glimpse up close you have to weave through the crowd (the ideal manoeuvre to get to the front is kind of a cross between a slithery eel and a slalom skier) whilst avoiding elbows and camera phones to the face. 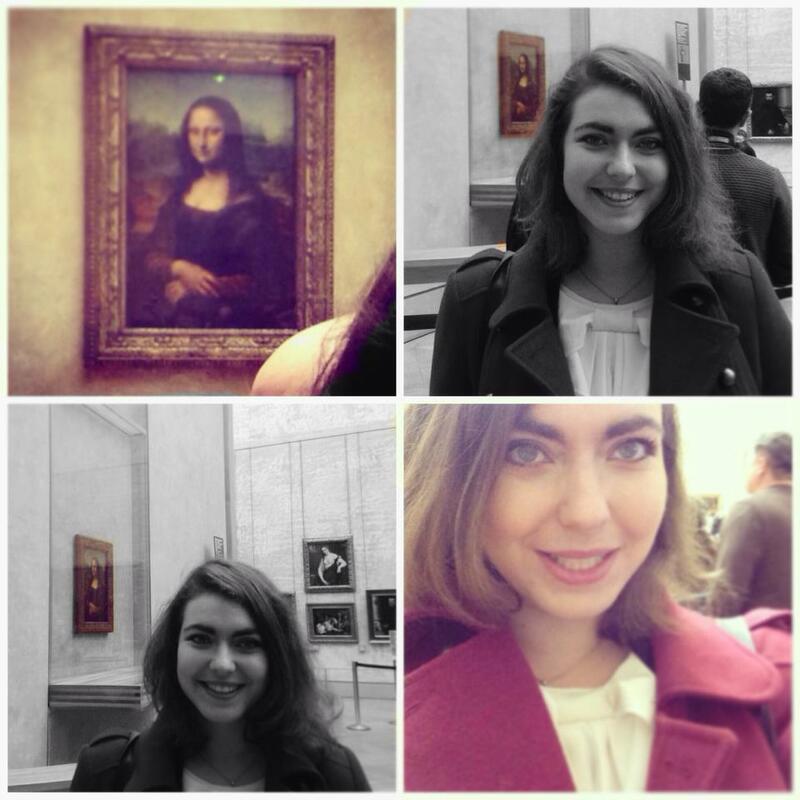 The real challenge is trying to get a photo of the ‘Mona Lisa’ without any other tourists in the frame…. Florence accepted the photography challenge. As you can imagine from my eel/slalom skier description before, this feat required some quite skilled choreography – however she managed to get a couple of photos of me that almost look as if we had the room all to ourselves for a private view (LIES). We soon escaped the throng to have a look at other paintings in the room – our favourite was the immense and colourful crowd scene ‘The Wedding Feast at Cana’ painted by Veronese in 1563. 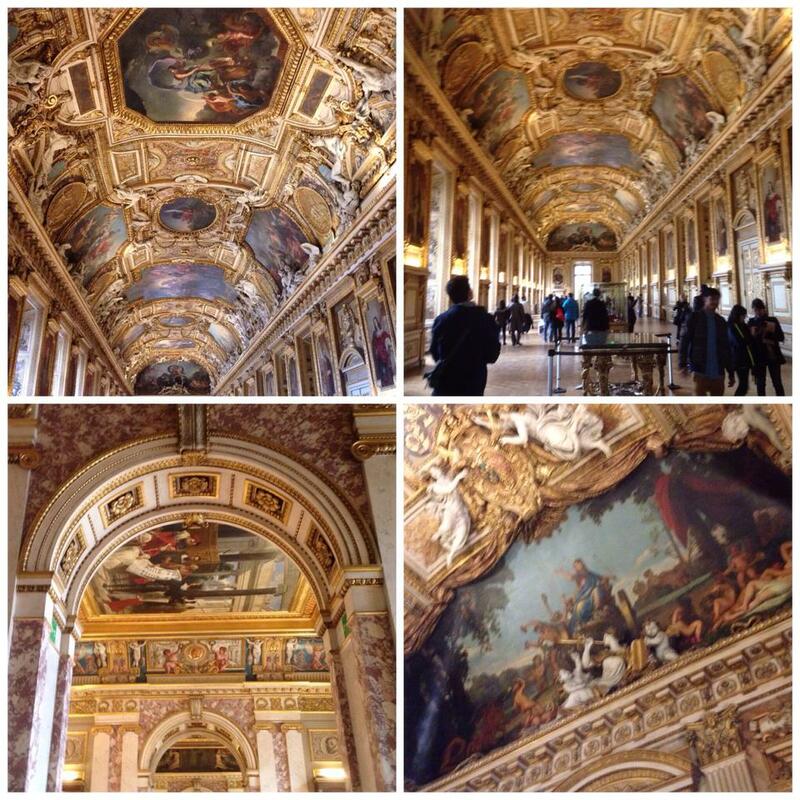 This is the largest painting in the Louvre’s collection and it covers the entire wall opposite the Mona Lisa. It’s quite interesting to observe how such a vast theatrical painting remains largely ignored, living in the shadow of ‘Mona Lisa’ and her many admirers. The fact that the painting is a crowd scene ironically reflects la foule in front of the ‘Mona Lisa’. 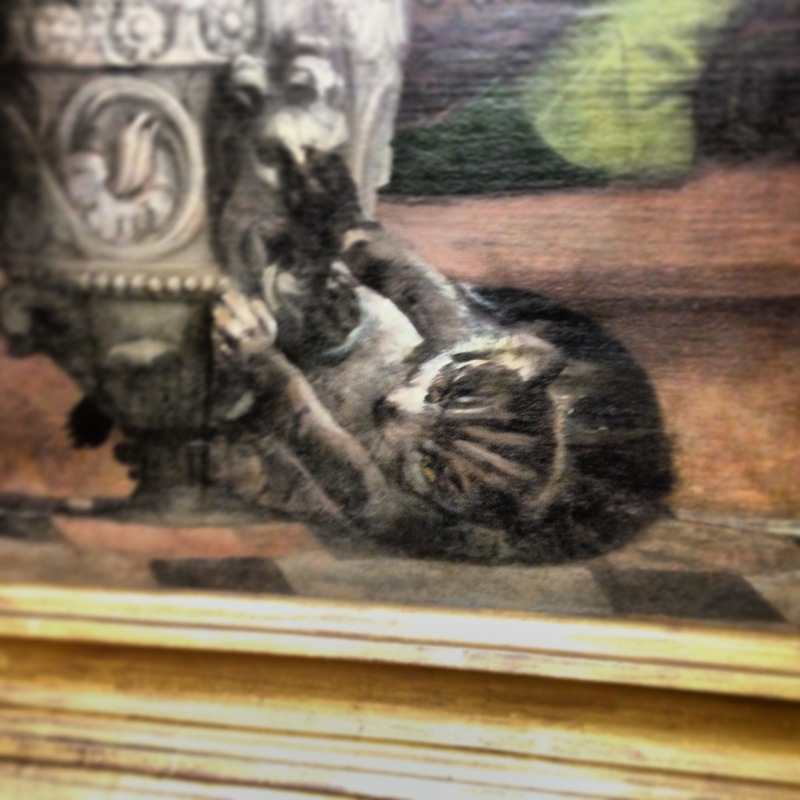 After having earlier spent quite a bit of time with the cats of Ancient Egypt, we especially enjoyed spotting the cat that appears in the bottom of ‘The Wedding Feast at Cana’. 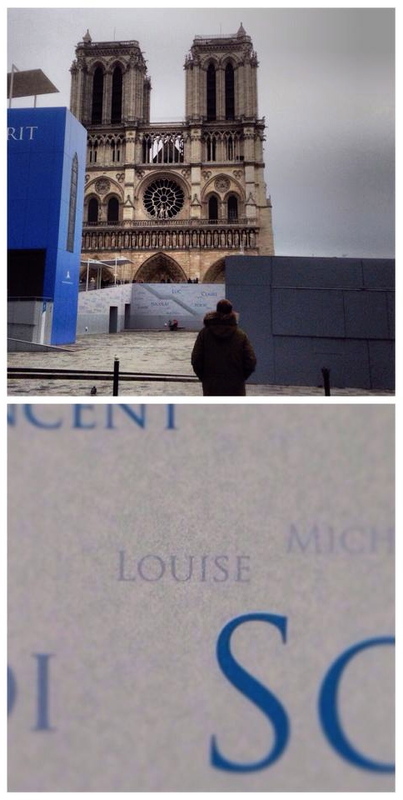 If you make a trip to the Louvre, see if you can spot it! We viewed a few more paintings (including ‘The Coronation of Napoleon’ by Jacques Louis David which was breathtaking) before deciding to replenish our oxygen levels by going outside to admire the architecture of the Louvre alfresco. En route, I took a few photos of portraits that particularly caught my eye – ‘The Empress Josephine’ by Pierre Paul Prud’hon (1805) and “The Young Martyr” by Paul Delaroche (1855). Josephine de Beauharnais was the first wife of Napoleon – her former residence the Château de Malmaison is considered a Napoleonic national museum and is located in Reuil-Malmaison, just a few RER stops outside Paris. Below you can see one of the iconic glass pyramids situated in the courtyard of the Louvre. 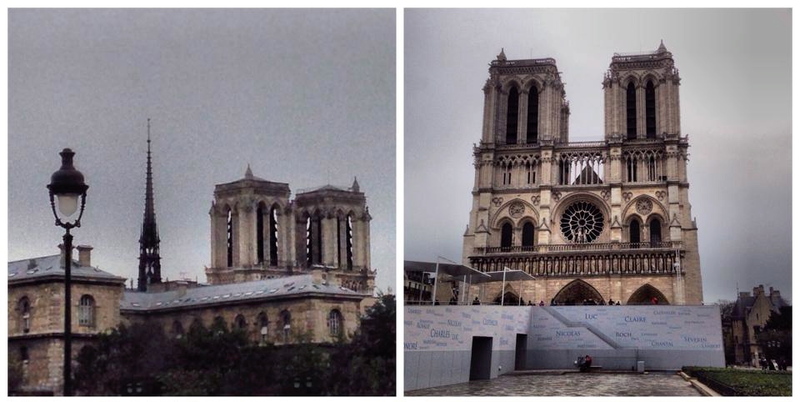 Although they were quite a controversial concept when first installed, they have since become beloved Parisian landmarks. The large pyramid was completed in 1989, it’s just that little bit older than me! The Louvre has its own ‘Arc de Triomphe’ – the ‘Arc de Triomphe du Carrousel’ is a miniature version of the larger ‘Arc de Triomphe de l’Étoile’ (situated on the Avenue des Champs-Élysées). The baby arch is made out of rose marble and although both structures were planned at the same time, the miniature was actually completed 28 years before its larger counterpart. After going around in circles for a while, admiring the ins and outs of the courtyard, we decided to head head back inside to the first floor of the Richelieu wing to see the state apartments of Napoleon III. Victor Hugo famously referred to Napoleon III as “Napoleon le petit” (Napoleon the little), implying that Napoleon III was diminutive in both stature and grandeur. 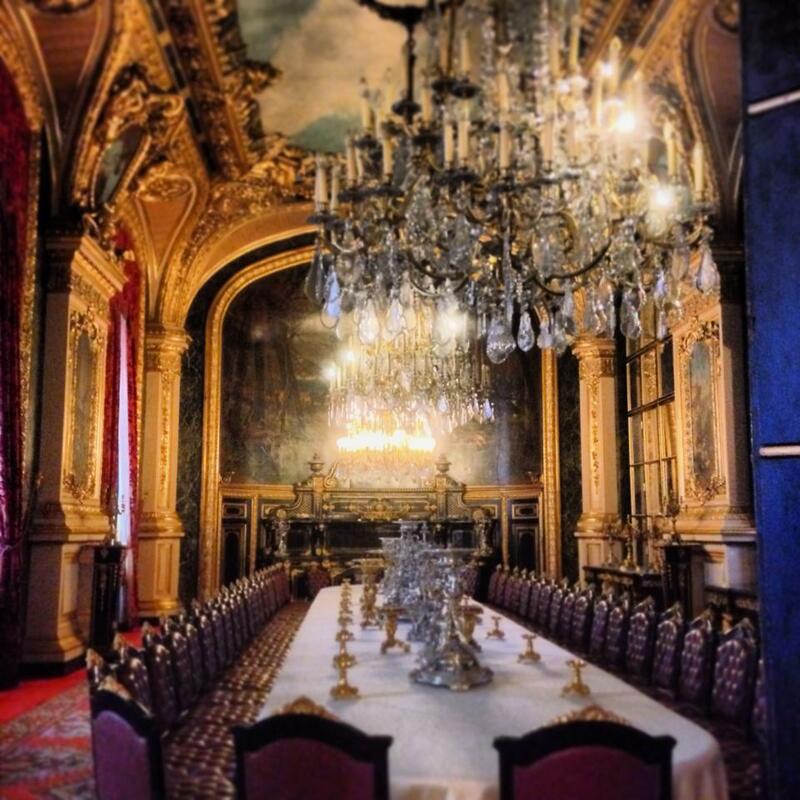 The grandeur that Napoleon III was lacking in character (according to Hugo) was clearly hiding in the interior décor of his state apartments.If you’re planning a visit to the Louvre, this section is not to be missed – the sheer opulence and decadence has to be seen to be believed. After perusing the apartments and indulging in one last photo opportunity (I just loved the joyous stag, it reminded me our Collingwood stag statue back in Durham), it was back down to the carrousel in an attempt to source food and an internet connection so that I could send off some articles – I ended up leaning against a plinth in the apple store. We then parted ways as Florence had a busy evening of studying ahead of her, whilst I was off to meet my mum, who coincidentally had just arrived in Paris for a course on French tax, in Villiers. Food was to be found at Casa Belucci, a cute Italian restaurant in Avenue de Villiers (http://www.lacasabelucci.com) We were enticed in by the chic red lip sofas (reminiscent of the italian siren of the silver screen Sophia Loren and Paris’ classic ‘Crazy Horse’ cabaret show). 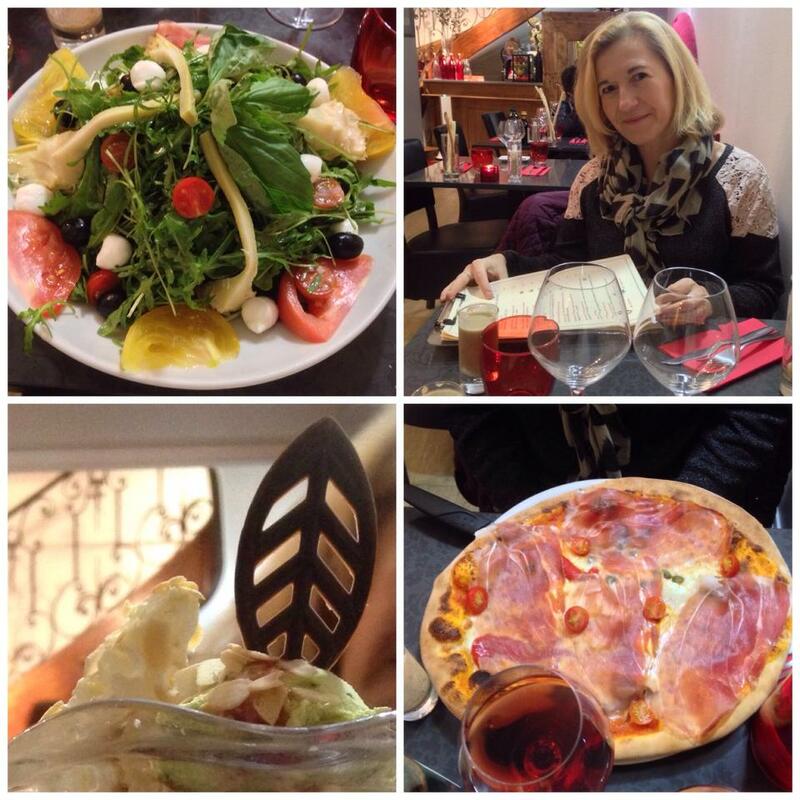 We were presented with free shots of mushroom soup, before sharing the’Romana’ pizza and ‘La Riviera’ salad. Dessert was a raspberry sorbet and pistachio icecream coupe topped with cherries and pistachioscalled ‘L’Amarena en Folie’. All in all, it was an excellent way to conclude the day! 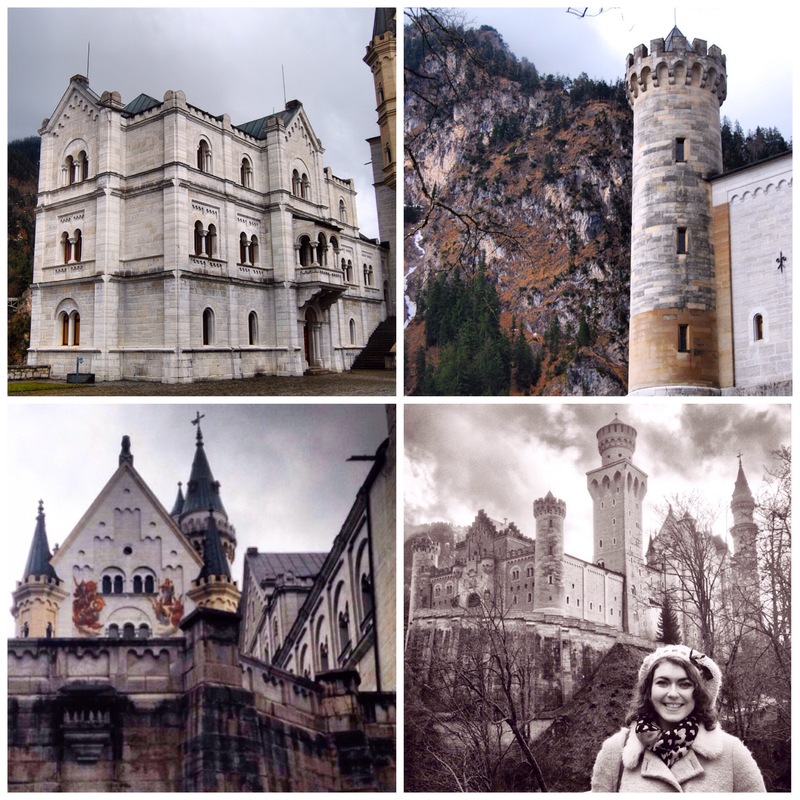 Many thanks to Flo for joining me in being a culture vulture tourist for the day! 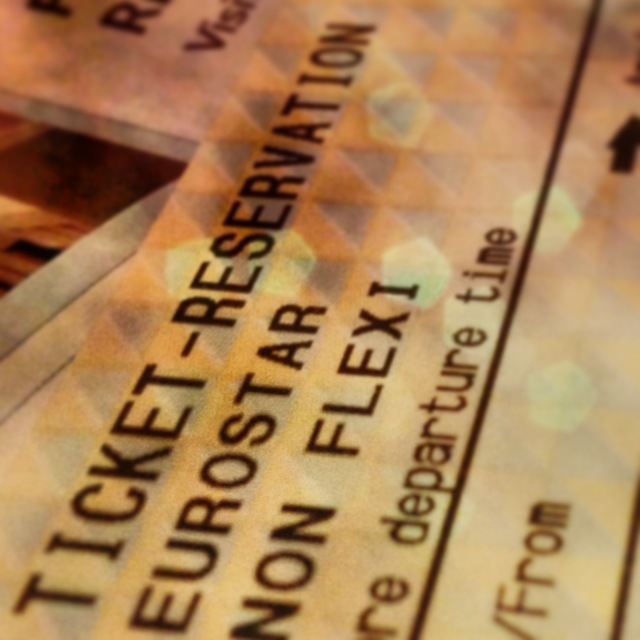 Going on the Eurostar was one of the events on my trip that I was most looking forward to. Considering that I often make trips to Paris to spend time with family who live in the city, a lot of friends were surprised by the admission that I’d never been on the Eurostar before. The ultra speedy train journey from the heart of one city to another was to be a new experience for me. Living on Guernsey, you become used to travelling primarily by ferry and by plane (my first flight was to France at the age of three months old!) 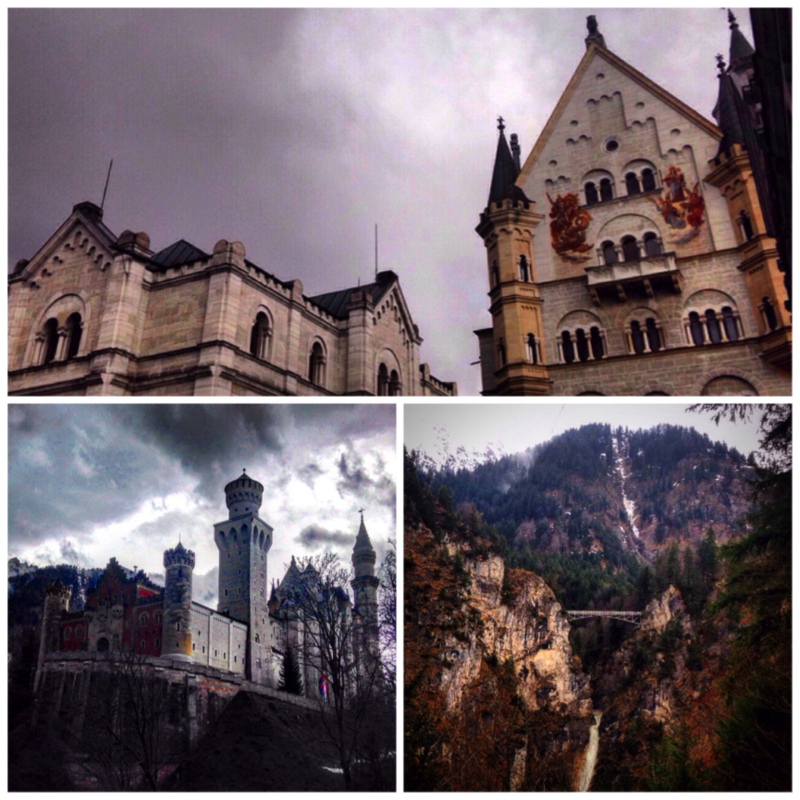 – when I was younger, going on a train journey was something very exciting indeed. I was particularly looking forward to a journey from one country to another without stringent baggage restrictions – you can take up to two cases and a piece of hand luggage (which can contain liquids) on the Eurostar. Being able to pack as much as I wanted, however I wanted (without having to remove the majority of my clothes at security) felt quite refreshing. The Eurotunnel and Eurostar service were both established in 1994 and so it is has been possible to get direct trains from London to Paris (and even direct trains to Disneyland Paris in Marne La Vallée) for two decades. Eurostar will celebrate its 20th anniversary later this year – Happy 20th Birthday Eurotunnel and Eurostar! I spent the morning and early afternoon with Ellie (who made sure that I ate some food by treating me to Lunch, thanks Ellie!) before I left East Croydon for the last time and got the train to London Victoria. My friend Nick was in central London for the day and came to see me off, helping me with my suitcase from Victoria to King’s Cross St Pancras tube stop – what a gent! We had a bit of time to spare before I had to go to the Eurostar departure lounge, so we decided to soak up the atmosphere of Europe’s “destination station” for a while. Stepping into St Pancras International, which was built in 1868 and renovated quite recently during the 2000’s, is a perfect way to escape into a sophisticated little bubble just a few steps away from a tube stop. St Pancras is widely considered to be the crown in the jewel of London’s railway stations, and has even been referred to as being the “cathedral of railways”. 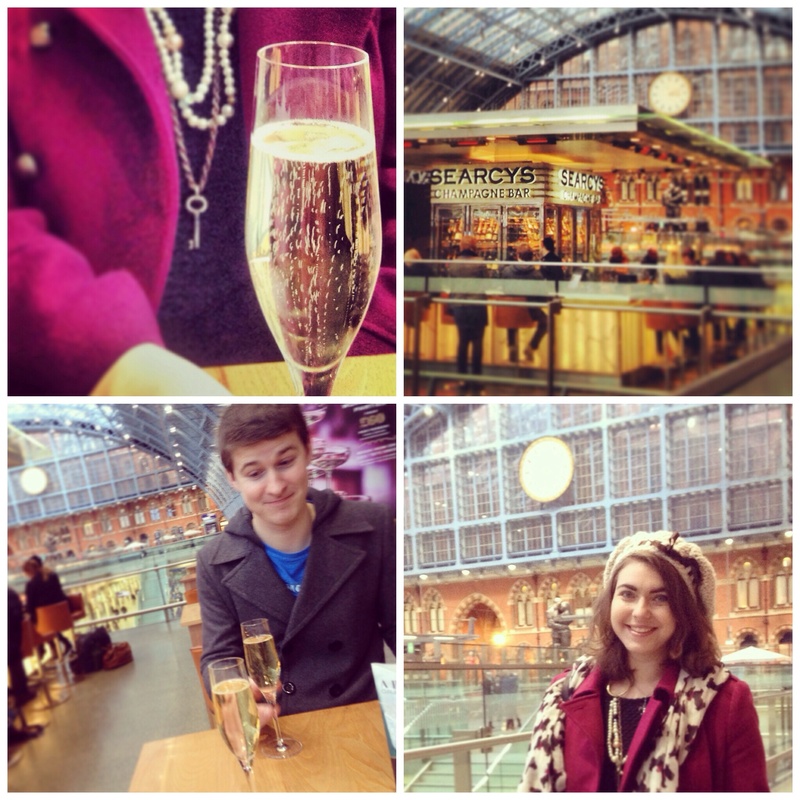 After our champagne break, it was time for me to head to departures… via Marks and Spencer’s! I was going to be staying with a friend in Paris who has a bit of a soft spot for mini bites – mini bites are little petit four sized cakes that Marks and Spencer’s sell in plastic tubs (ooo glamorous) . They come in varieties such as rocky road, flapjack, chocolate cornflake clusters and chocolate mini rolls… and are quite the party pleaser. I also bought some lilies, which would sit next to me throughout the duration of my Eurostar journey. The train left at 17:45, so it was already dark by the time we left London. I settled down with a copy of Eurostar’s in-house travel magazine “Metropolitan” – written in both French and English, I found it both fascinating and informative – just my kind of culture magazine. After a brief stop at Ashford international station, I could vaguely make out the lights of Dover before we entered the Channel Tunnel. 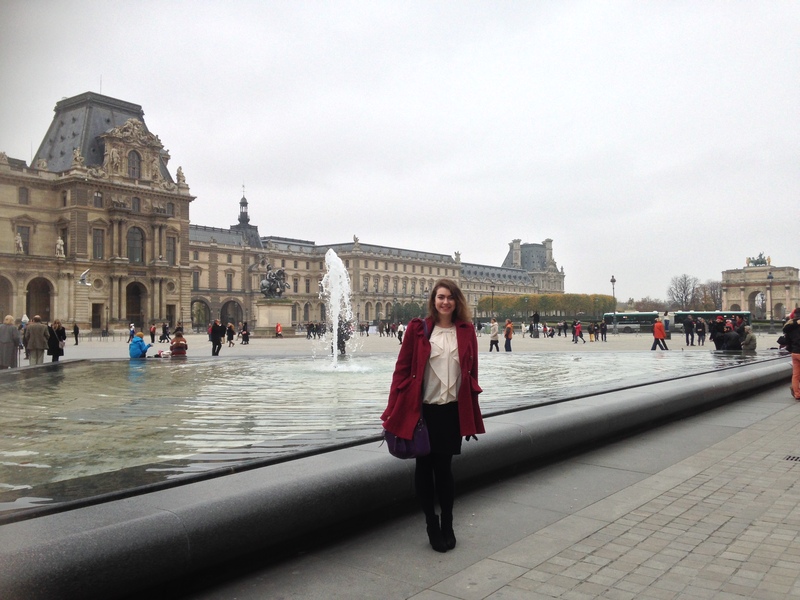 It wasn’t long before we were in Paris, and I was reunited with Florence! We escaped the rather hectic Paris Gare du Nord and got on the tram – the Parisian buildings passed by in a blur a bit too quick for my tired eyes, so I can’t precise too much other than to say that everything looked beautiful. After a Mcdo meal in Paris’ Chinatown, we made our way to Florence’s twin sister’s apartment, where we were greeted by amazing floor to ceiling Jacques Demy ‘Les Parapluies de Cherbourg’ film posters and freshly brewed tisane. The twins fell asleep, whilst I stayed up a bit later to work on an article – happy to be in the City of Light once again. 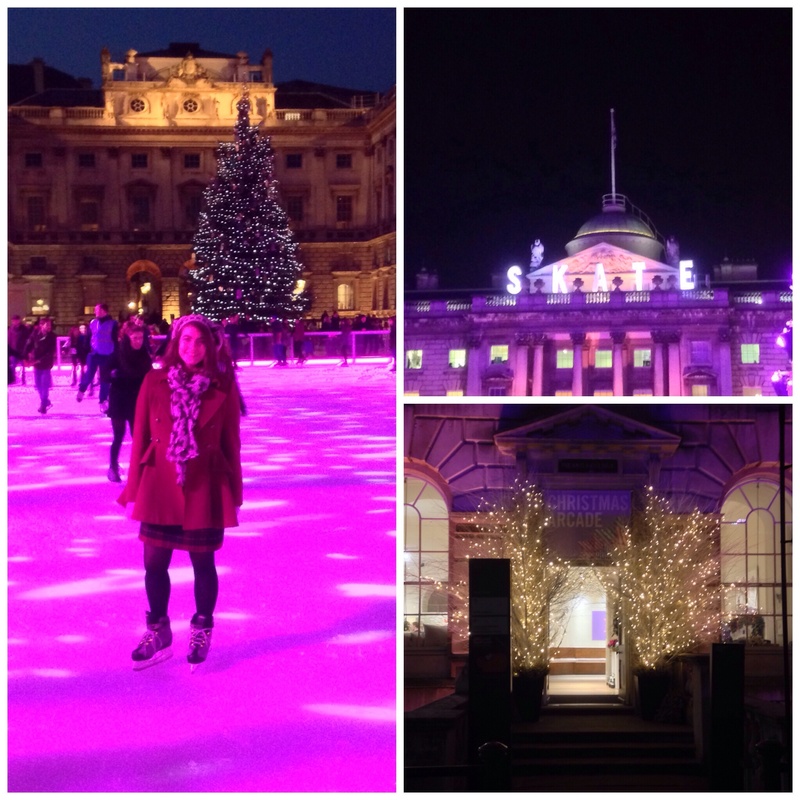 I really enjoyed travelling with Eurostar and hope that there will be more opportunities to do so in future! On the fifth day of my trip, I found myself accompanied through the London streets by some pals from University – three physicists and a mathematician, to be exact. Nick, Tom, Caleb and Daryl (Daryl of Hamleys teddy bear snuggle fame) managed to organise a London meet up day with relatively short notice and it was great to catch up with what they’d all been up to over the summer. We met in the morning at London Victoria – Nick, who was busy with his fancy jet-set number-crunching job (or so he’d have us believe…), joined us later in the evening. With so many scientists in the entourage, you’d think that the day would have gone ahead with logical precision, however apart from a request from Daryl to visit Chin Chin Labs in Camden, it was a relaxed freestyle day – which was more than ok with me, as you can tell from my previous posts, “magical mystery tours” of random discovery are just the way I like it. 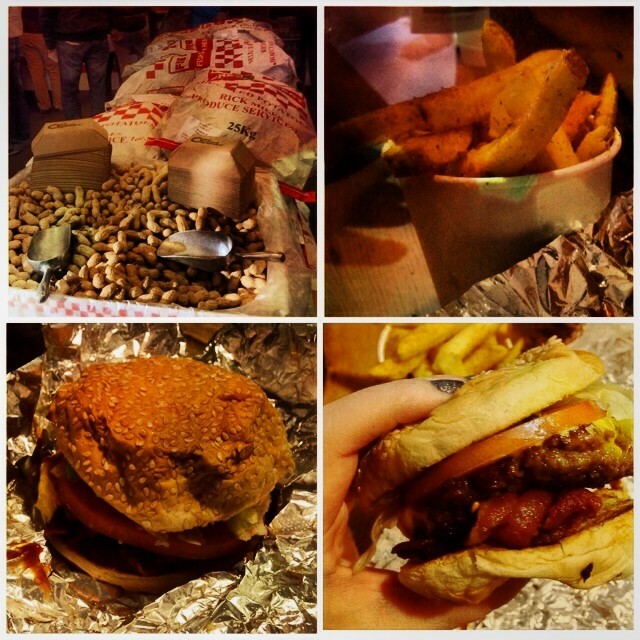 We had a mosey around several different areas of London throughout the day – As the only girl, I found myself outnumbered by the boys, however used this newfound manly troupe as the perfect excuse to finally try out Five Guys burger restaurant. I had finally worked out where the building was and had a hunch that it would be a crowd-pleaser – from experience, messy burgers tend to be a hit with men. Of course, I have a secret weak spot for a good barbecue bacon cheeseburger (but shush, no-one must know!) and was really intrigued to see if Five Guys lived up to the hype. I had decided to take my new shoes from Forever 21 for a test drive – they would come to be referred to throughout the day as the “disco shoes” by Caleb and Tom, who both seemed to have an affinity for their apparent 70s look (or more likely, the 70s in general). It took a while for everyone to get used to my new height, as at first glance it seemed as if I had grown about seven inches over the summer. It was a lie. Fashion can be deceiving, folks. After traipsing around London Victoria for a while, looking for an “edgy café” for Caleb to get a coffee from, we decided to do a bit of sightseeing, starting with Buckingham Palace. 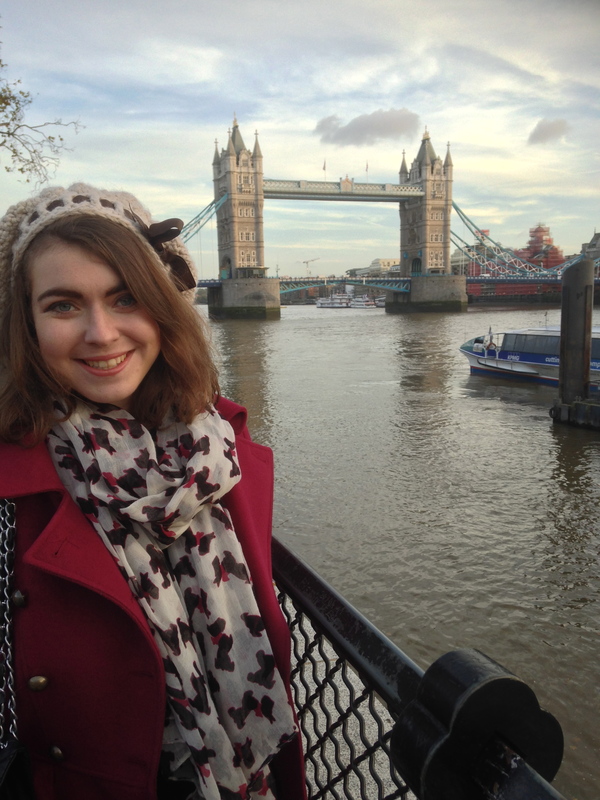 We zipped from Victoria to Green Park on the tube and caught some action at the Palace gates. 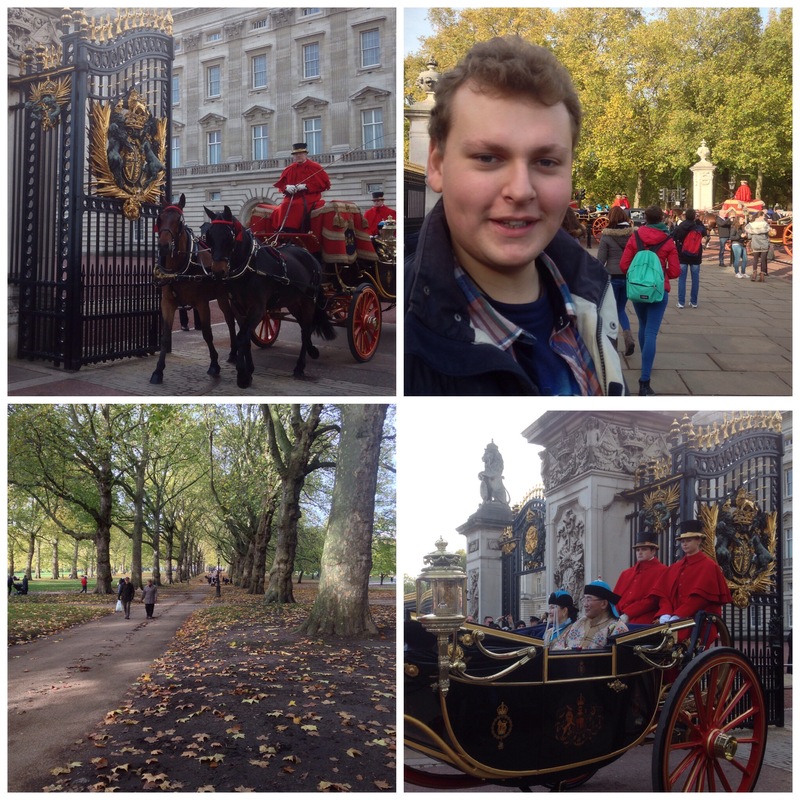 We were actually lucky enough to see some ornate carriages leaving the palace, which was quite exciting. I think one of the things that I love most about cities, is that even if you visit a landmark several times, you never have the same experience twice as there is always something different to observe or take part in. It was interesting to see the ceremonial dress of different dignitaries – I believe that the blue national costume pictured below is the attire worn by the Mongolian ambassador to the UK. 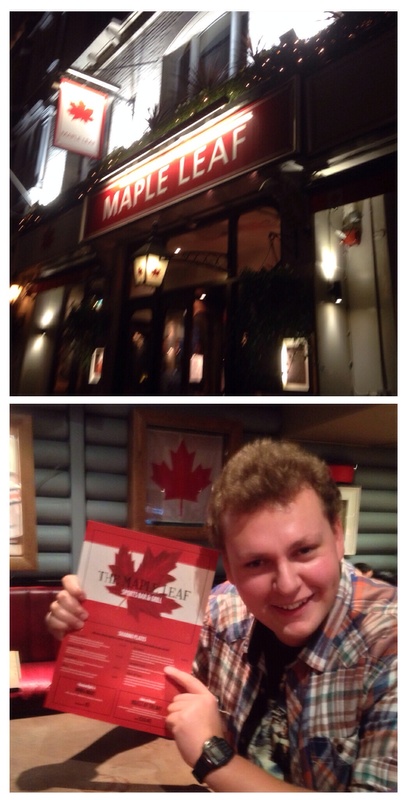 After witnessing some artistic Instagram photography attempts at the Canada gates by a certain member of the gang (who is in denial of his passion for Canada and subsequent status as aficionado of all things canadian), we headed to Covent Garden to catch a bit of street magic and busking. 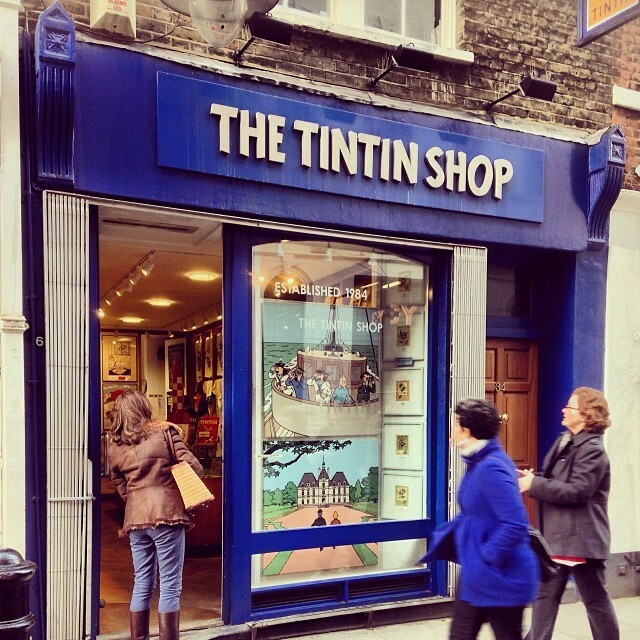 Whilst we were en route to Five Guys – we had decided that we were pretty ravenous by this point – we spotted the official Tintin Shop, which can be found at 34 Floral Street. The street name indicates Covent Garden’s early origins and roots as a flower market (the pun is unintentional this time, I swear). “Les Aventures de Tintin” is a comic book series which was created by Belgian cartoonist Hergé in 1929 and the shop on Floral Street was established in the early eighties. The Tintin comic series has since been adapted into a major feature film and still enjoys popularity today. 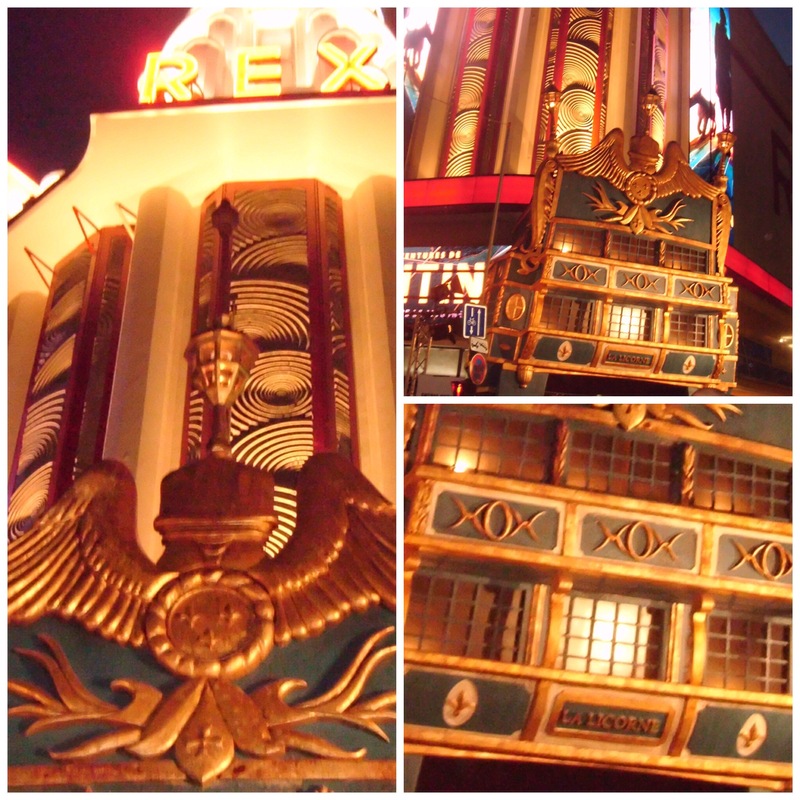 I remember walking past Le Grand Rex in Paris whilst visiting a friend on my year abroad in 2011 and being awestruck that the façade of the cinema had been magically transformed into the exterior of the fantastical boat La Licorne. Tintin is a classic character known all over the world – on one of my first ever trips to Germany, I stayed in a host family and instantly felt at ease when I spotted a Snowy poster on the wall of the lounge*- Tintin ended up forming the basis of one of my first German conversations. The comic books have in fact been published in over seventy languages, which just goes to show how international a character Tintin has become over the years. I have good memories of spending the christmas holidays (in particular the night of ‘Reveillon’ – Christmas Eve) as a little girl watching the animated Tintin series (from the early nineties) with my dad, uncle and grandfather – the series was often broadcast on French TV! These tourists walked into my photo with lightning speed – however I do like how these London ladies coincidentally match the colour scheme of the shop! Inside, Daryl and I got sidetracked by the fluffy Snowy toys, whilst Tom and Caleb checked out some of the books – I think that’s what they were up to at any rate, I was too busy being entranced by fluff. *Snowy’s name in German is Struppi, in case you were wondering – his French name is Milou. Once we had torn ourselves away from the fluffy Snowys, we were back on track on the hunt for food. Five Guys turned out to be not far from Floral Street and surprisingly there was no queue outside – there wasn’t even much time to enjoy the heaps of free monkey nuts that line the restaurant before we were served with our burgers and fries. Of course, I can’t complain because if we had indulged on the peanuts then we would not have had enough space for the main event! The menu at Five Guys is quite simplistic, however there are several different combinations that you can create from the ingredients on offer. I decided to go for a ‘little’ burger – which was a wise choice, as the portion sizes are massive! I would not have been able to cope with a normal sized burger and I hadn’t even eaten breakfast! Look at the cheesy barbecue bacon deliciousness below, pictured on the bottom right – if I could choose any adjective in the world to describe this burger, I would not go for little! Decadent, perhaps? I naively ordered a “regular” diet coke, but soon discovered the novelty of the Five Guys refill ‘coke freestyle’ system – where you can choose from hundreds of different drinks options including combos such as Grape Sprite, Strawberry Fanta, and Raspberry Coke. 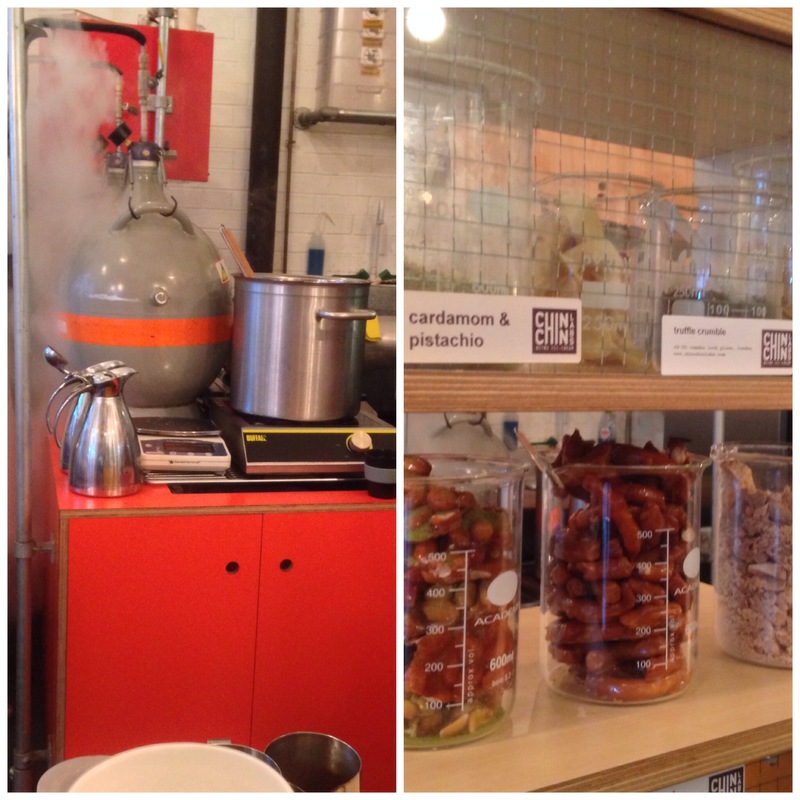 It was mind-blowing for the first five minutes… until I found myself craving the normalcy of a plain diet coke! When it comes to being served your food, you have to present yourself to the counter to receive your order when the number on your receipt is called. The food is then handed over to you in a plain brown paper bag. The burger is wrapped tightly in foil; as soon as you unwrap it, the squishy bun expands (a bit like a slinky or a sponge) to reveal itself piled high with your chosen fillings. I decided to try the cajun fries as well as getting a burger (naughty, naughty). Now, I have a confession to make – I am the kind of girl who likes to slather tabasco and jalopeños over everything. When I was living in halls of residence I even had a little spice selection that I would take to meals to douse my plate with – one of my friends ended up calling me Tabasco girl – not my finest moment. Although my taste buds must be slightly numb from all these years of chilli pepper abuse I actually found that the cajun fries tasted very spicy, so be warned! Again, a ‘little’ sized fries was a crazily generous serving – the cup you can see above was only half the portion, most of the fries were to be found at the bottom of the glorious brown paper bag. So many fries, so little space in my stomach – one portion ended up feeding three of us! We stayed in Five Guys for a while, tucked into an old fashioned 1950s style booth in the downstairs underbelly of the restaurant. The walls are plastered by endorsements from newspapers, bloggers and food critics – not really my taste of decor but the food was satisfying and great value for money. I guess the posters provide you with a bit of light reading if you find yourself on a solitary lunch break! 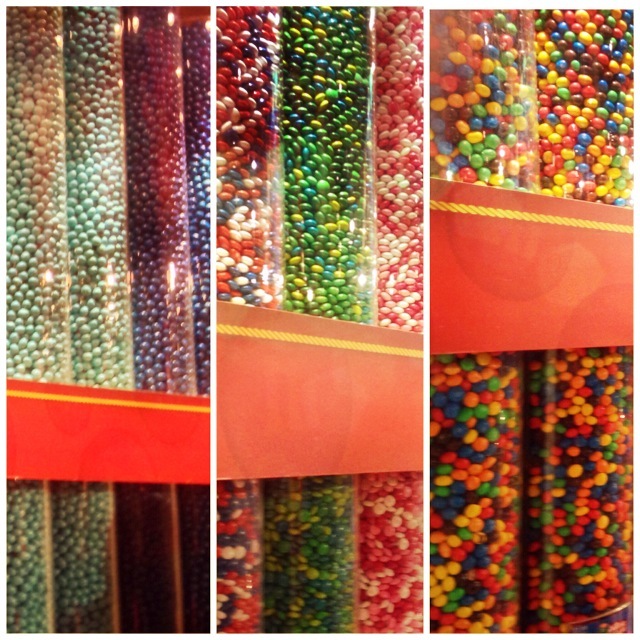 I have to admit that I enjoyed looking around the shop – I definitely didn’t cave into temptation a few days later and return to buy a handful or three of peanut M&Ms…. 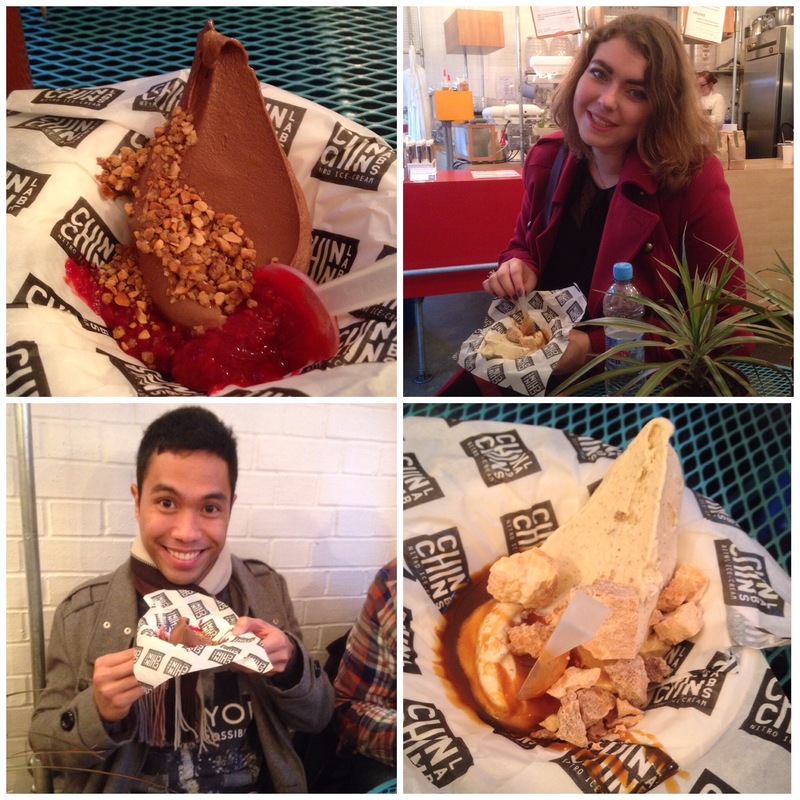 It was definitely turning into a “foodie” day by this point in our reunion – our next stop was Camden Market to visit the place where dessert meets science – the mysterious Chin Chin Labs. Place your order at the small counter, and you can watch as ‘test-tube ice cream’ is created before your very eyes using liquid nitrogen, being frozen into a delicious triangular slab just for you. This was definitely up the boys street – I, however, have not been near a pipette or beaker for years and tend to be scared that scientific equipment will break if I touch it, so it was a slightly surreal experience. There was a choice of four flavours – Tom and I went for Pondicherry Vanilla whilst Caleb went for a slightly more adventurous “limited edition seasonal” flavour, Szechuan Peppered Pineapple (which was actually the nicest in my opinion and turned out to be dairy free). Daryl chose a dark chocolate flavour which was around 80% cocoa and tasted extremely bittersweet. You can choose one sauce or topping from the pyrex beakers displayed on the lab shelves – I was a little bit greedy and went for grilled white chocolate bits AND salted caramel sauce. Caramel pretzels looked like an intriguing topping, but will have to wait for another visit. The tasting was an unusual experience – I find it hard to describe its exact consistency but it definitely felt a lot smoother than ‘normal’ ice cream. 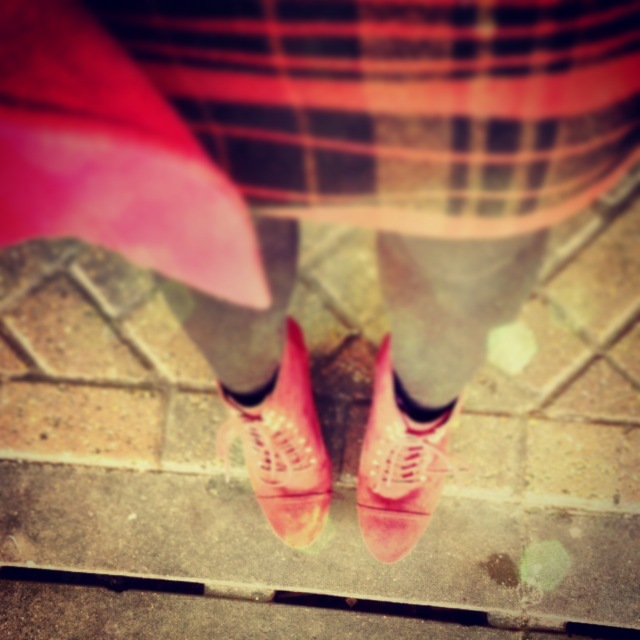 We walked off all our ice cream on the Camden cobbles – it was an interesting experience to navigate around over the said cobbles wearing the “disco shoes”, but I managed it, just about. Thanks for the patience, guys… the sun was setting over the Lock and the view was breathtakingly beautiful, so we stopped for a while to soak up the scenery. 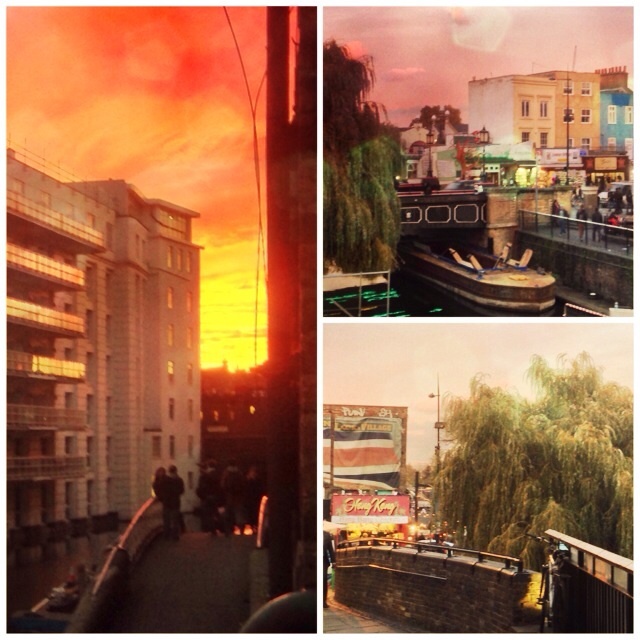 Camden is a very quirky open air market and residential area, which serves as a haven for all sorts of alternative fashion shops, one off street stalls, tattoo parlours, piercing studios and bars. It’s a good place to look for cds, a vintage look dress or if you’re feeling particularly daring, a steampunk-esque corset! It was here Daryl left us, as he had to be up early the next day to drive up to Durham to visit the Lumière light festival. And so, the remaining trio retreated to The Lockside Lounge to wait for Nick, who had text us to confirm that he was finally deigning to join us. 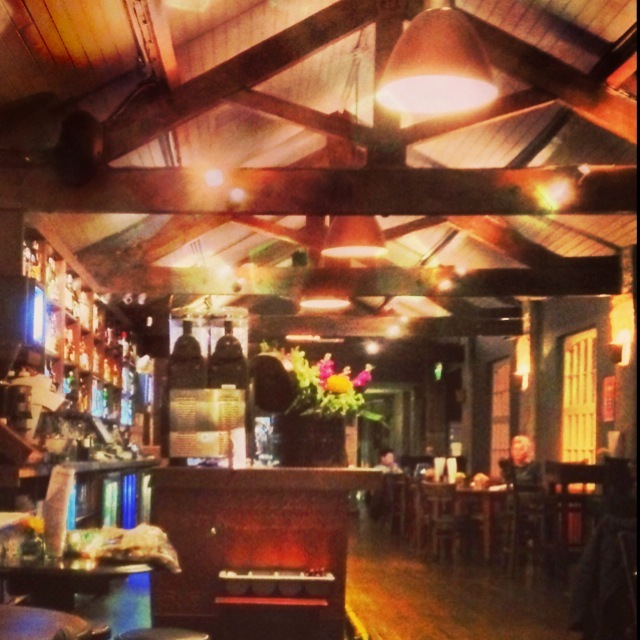 The Lockside Lounge is a cool haunt – and definitely has a boathouse vibe with its nautical beams. As you may have guessed from previous posts, I love buildings with character and this bar was no exception. 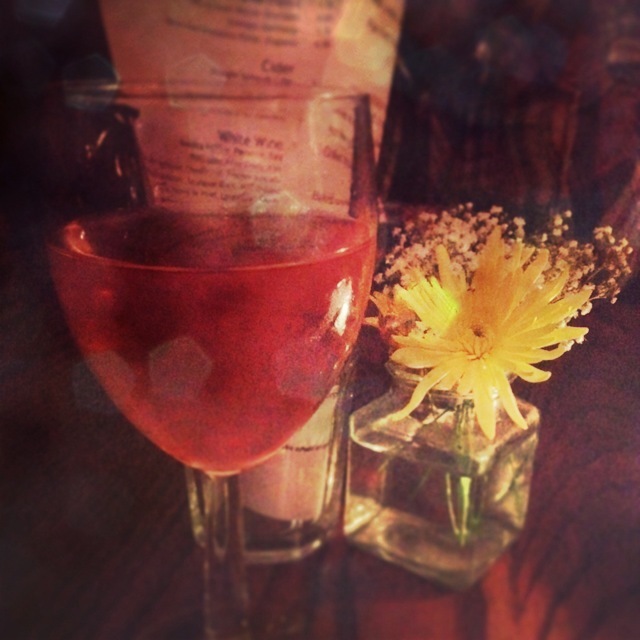 I ordered a glass of Burlesque rosé and was informed by the bartender that the label of the wine was chosen because the lounge often pays host to burlesque evenings. Camden nightlife seemed to be pretty vibrant, and I reckon that The Lockside Lounge would be a great place to spend an evening as it had an awesome atmosphere. It also endorses up and coming indie, funk, blues and jazz performers. The peace was shattered when Nick arrived – he was enthused after a day at work and obviously hadn’t had to go through the tiresome trials of tasting various foodstuffs all day… We stayed in the bar for a little longer, being updated on his recent exploits in Lithuania and Latvia, before we found ourselves being frogmarched out of the bar and taken to Fire and Stone, a pizzeria on Maiden Lane near Covent Garden. I can’t personally vouch for the pizzas as I was still feeling pretty full from Five Guys and Chin Chin Labs so picked at a salad, but the boys seemed satisfied with their meal choices. 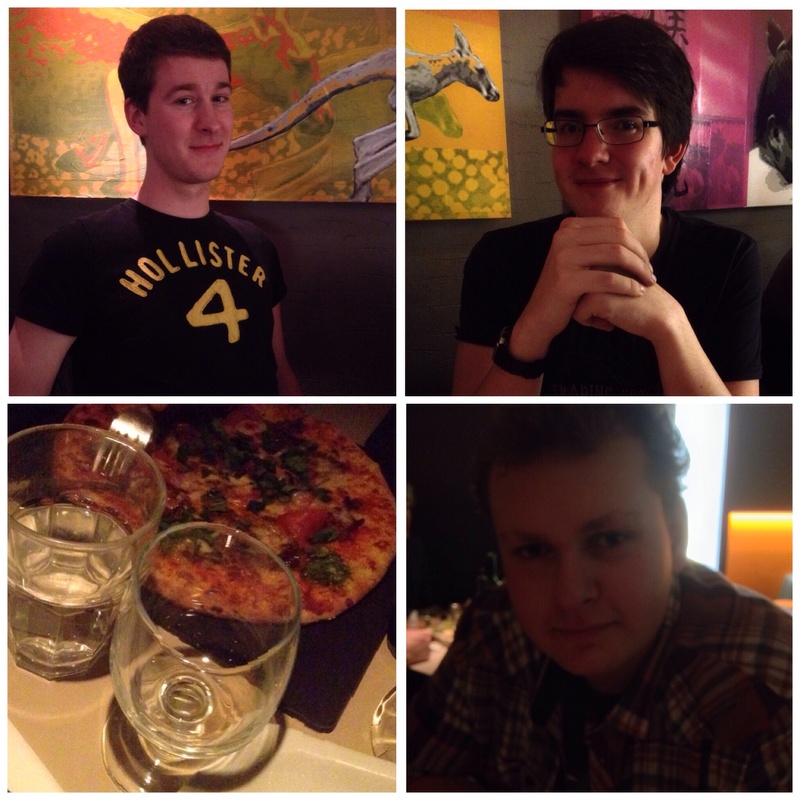 Nick claims that it was “better than Nando’s” – high praise indeed. I took the opportunity to take a few snaps of the guys looking relatively refined, taking on the role of slightly overenthusiastic paparazzi photographer/a grandmother. 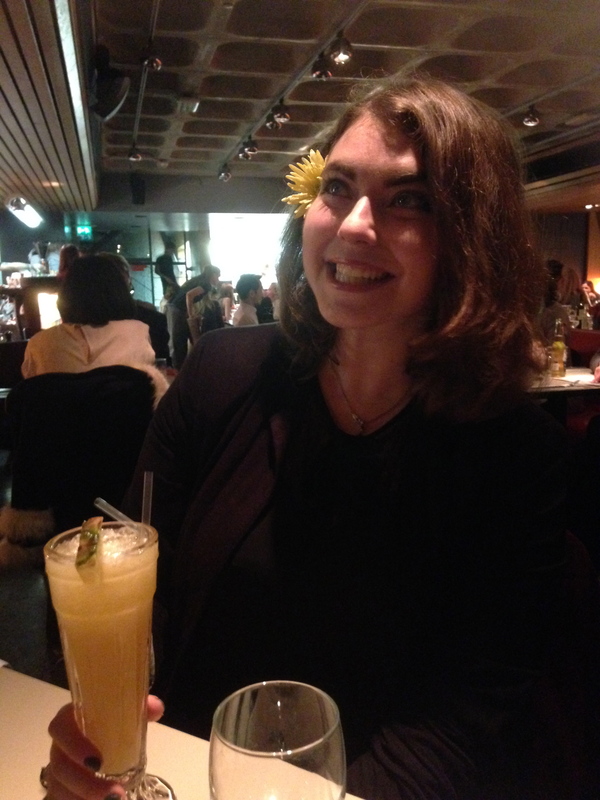 Nick helped me accessorise my Mai Tai with aplomb. 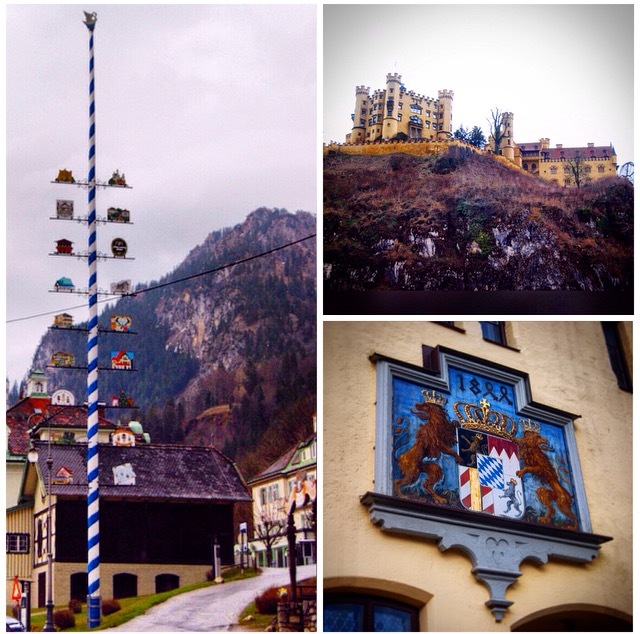 I guess you can say that we all had quite a diverse day of café, bar and restaurant hopping! After returning to Victoria via Covent Garden tube station (with its surreal lifts that transport you from the street into the bowels of the underground) it was time for me to head back to Croydon, reunite with Ellie and to begin planning another day indulging in pleasures of a different nature – the theatre! 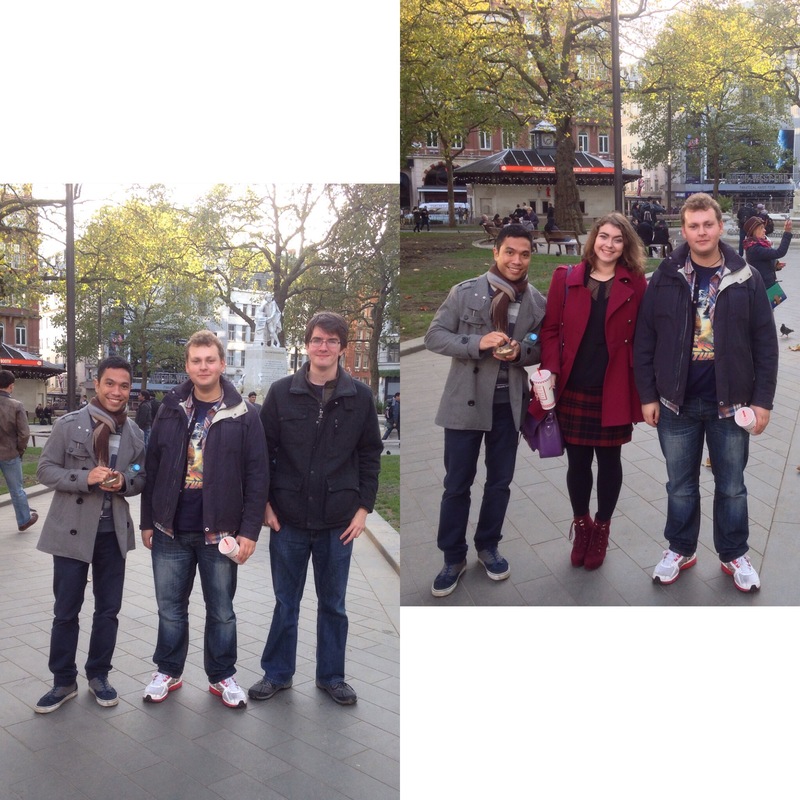 Thanks go to Caleb, Daryl, Nick and Tom for an unusual culinary themed day of sightseeing in the capital. P.S. Forget the riddle “Why is a raven like a writing desk?”. We had an incident on the tube where Caleb tried to persuade us all that lemon strepsils are as effective at cleansing the palate as chewing gum, much to the amusement of our fellow tube passengers. “Why is chewing gum like a lemon flavoured strepsil?” – the new riddle of our time.